The HEIRS framework for 48204 creates an HNZE district, anchored by a Community Center/Kitchen as the epicenter of a collectively owned MicroGrid. TSP reveals and deploys the capacities of 23 acres of publicly-owned vacancy concentrating along 3 streets, or Energy Avenues. TSP pairs HnZE Canopy with conventional PV to meet demand for electricity via solar and HVAC geothermal, and water management, food production, and waste conversion. 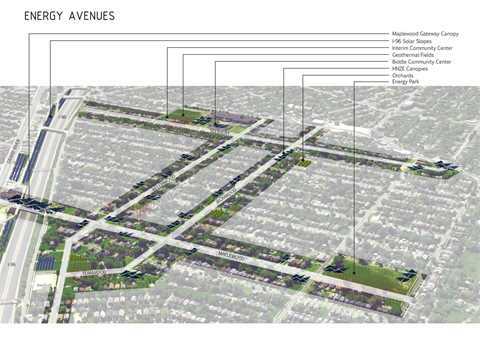 TSP can be expanded to all of 48204 and other neighborhoods. 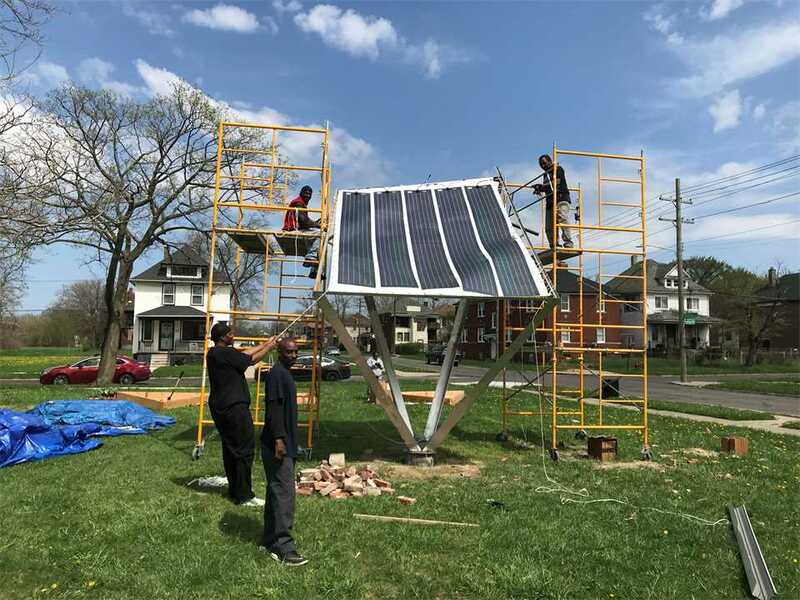 Installing a prototype solar panel canopy. In 2013, three young men who proudly grew up in 48204 founded the NGO It Starts at Home (IS@H). 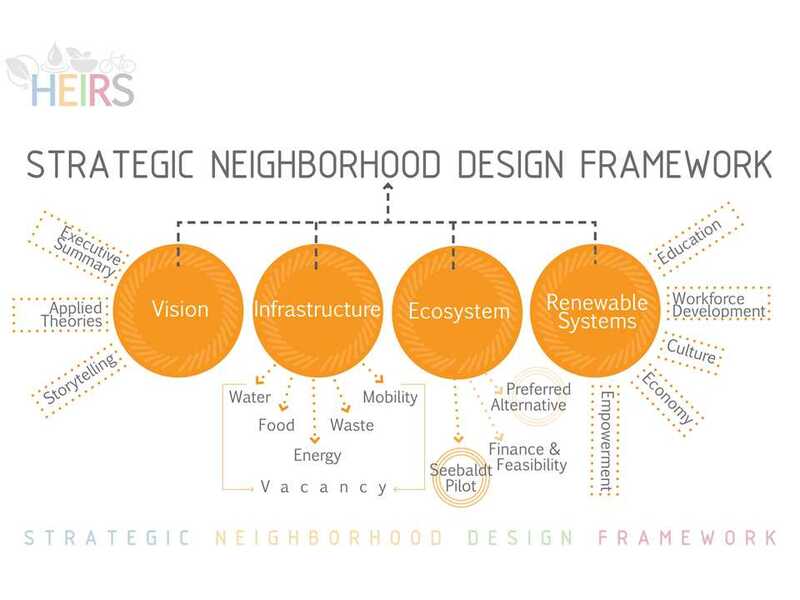 The HEIRS framework for vacancy, NZE generative infrastructure and public realm interventions. 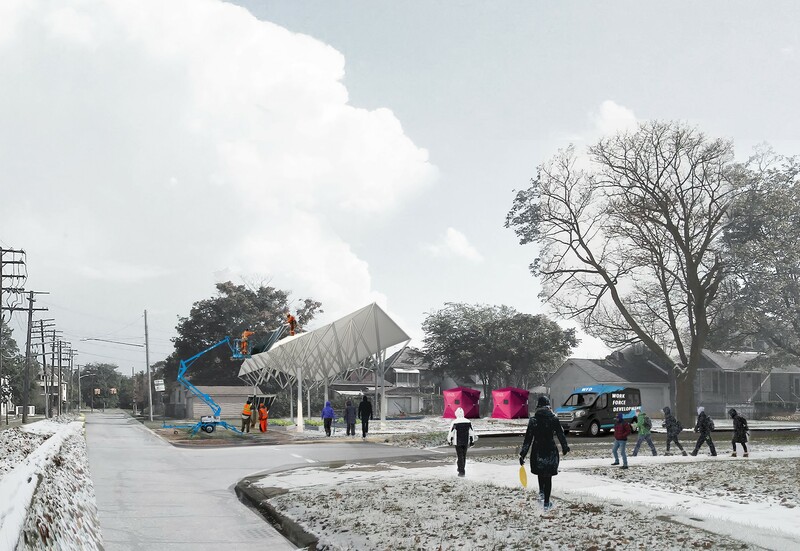 TSP is Phase 1 of a larger design framework to revitalize Detroit’s historic Old Westside – 48204. HNZE canopy computational design/digi fab methods meeting performative, cost, and aesthetic metrics. 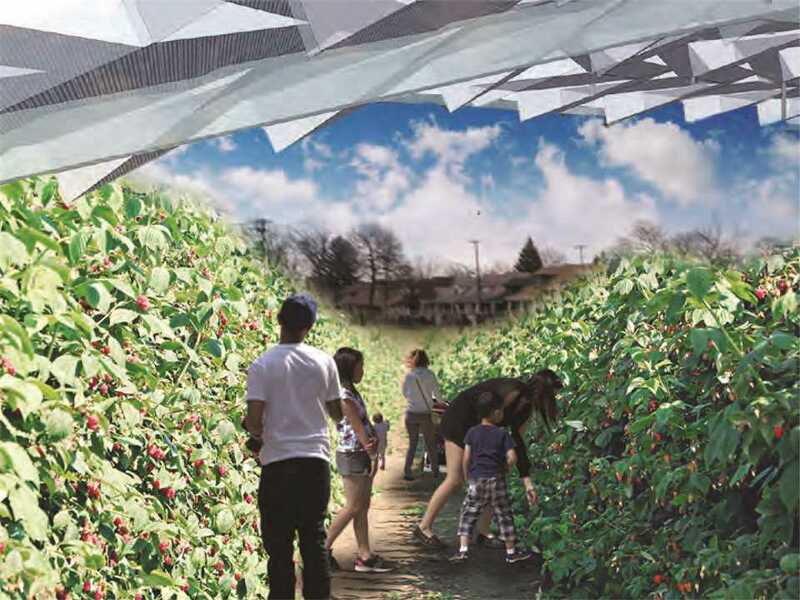 The HNZE Canopy captures and stores rainwater for irrigation of gardens throughout the study area. The Energy Avenues have the potential to serve at least half the homes and residents in TSP boundary. Berry bushes planted as green infrastructure without the fruit absorbing toxins from storm water runoff. 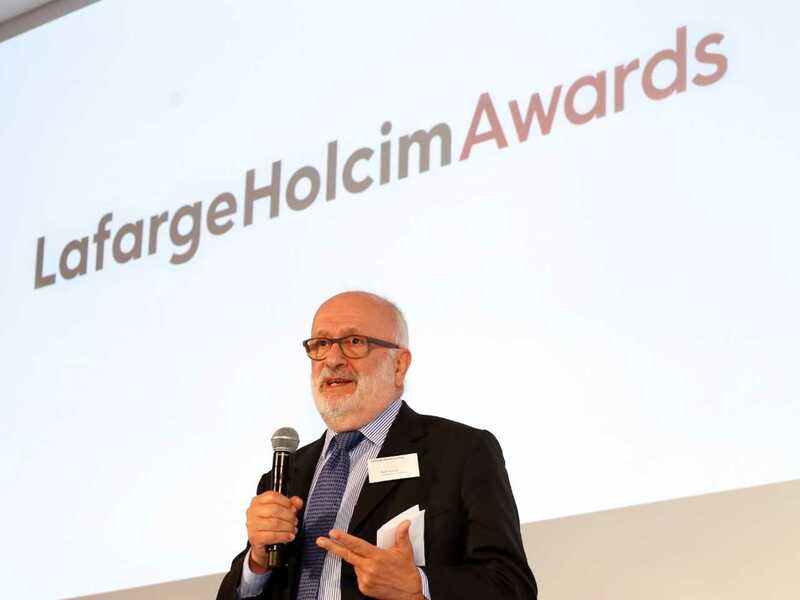 Presentation of the LafargeHolcim Awards Gold prize (l-r): Member of all five regional Awards juries, Marc Angélil, Professor of Architecture & Design, Swiss Federal Institute of Technology (ETH Zurich); Pascal Casanova, Member of the Executive Committee of LafargeHolcim responsible for North America including Mexico; Maik Strecker, Head Growth & Innovation North America, LafargeHolcim; prize winners Constance Bodurow, Will Bright, Eric Mahoney and Haibin Tan for their project Community-driven neighborhood planning in Detroit; John Stull, CEO Cement LafargeHolcim US. 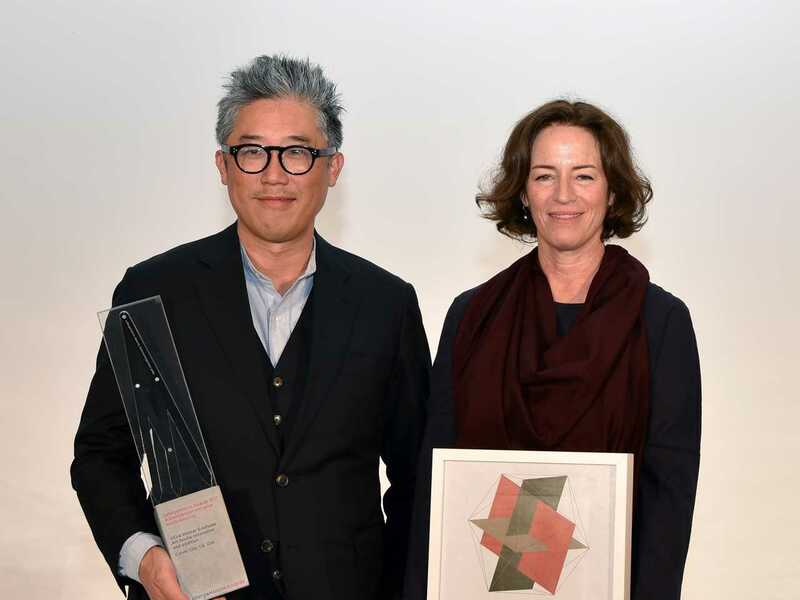 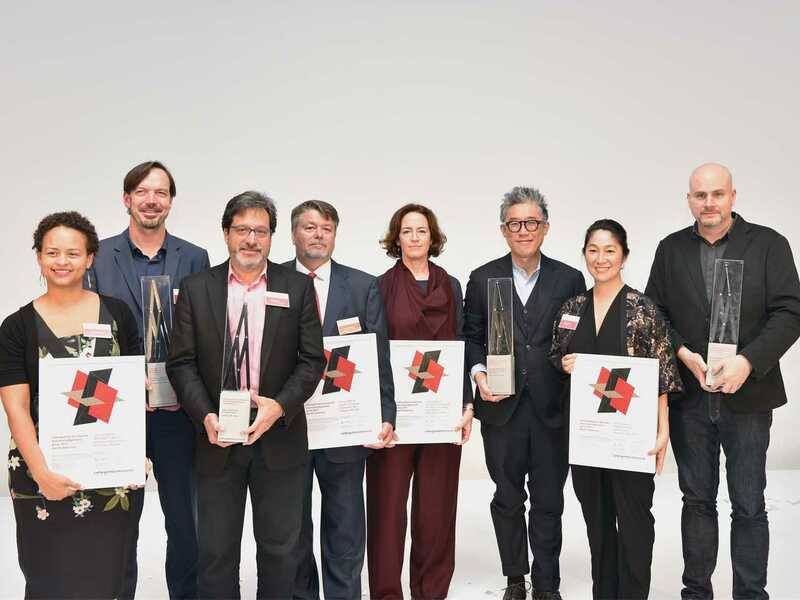 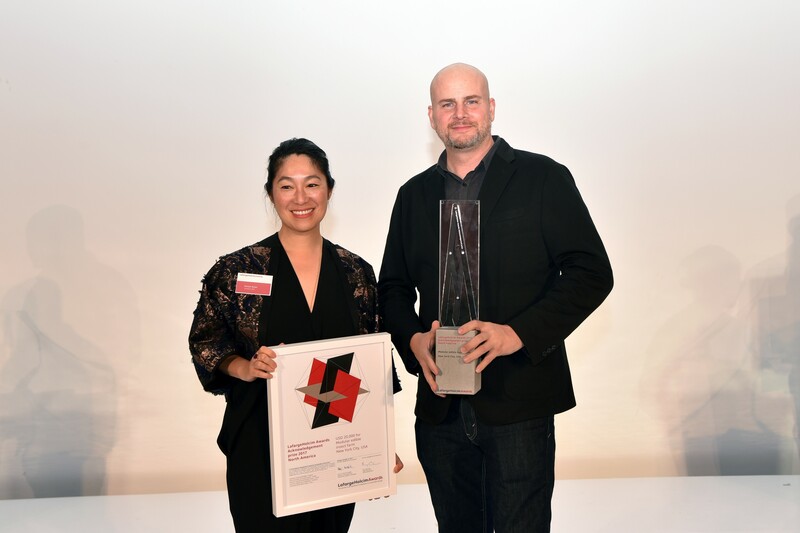 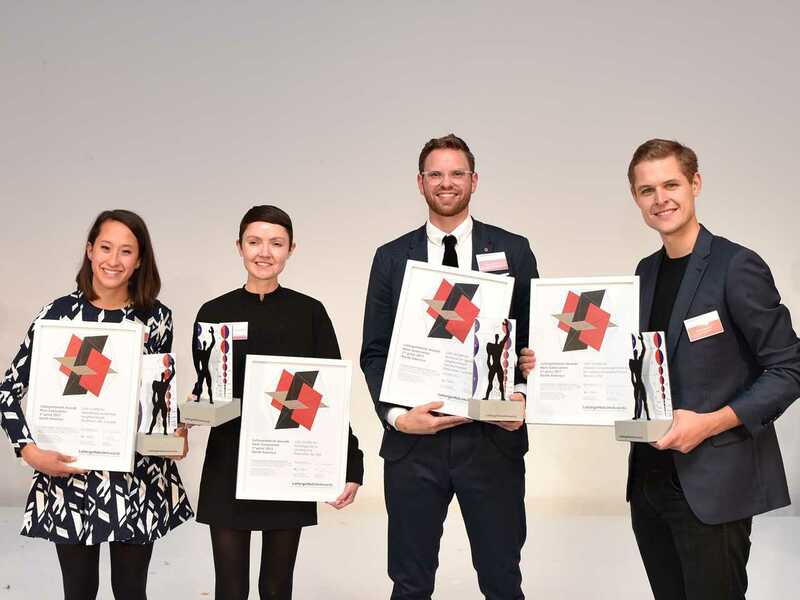 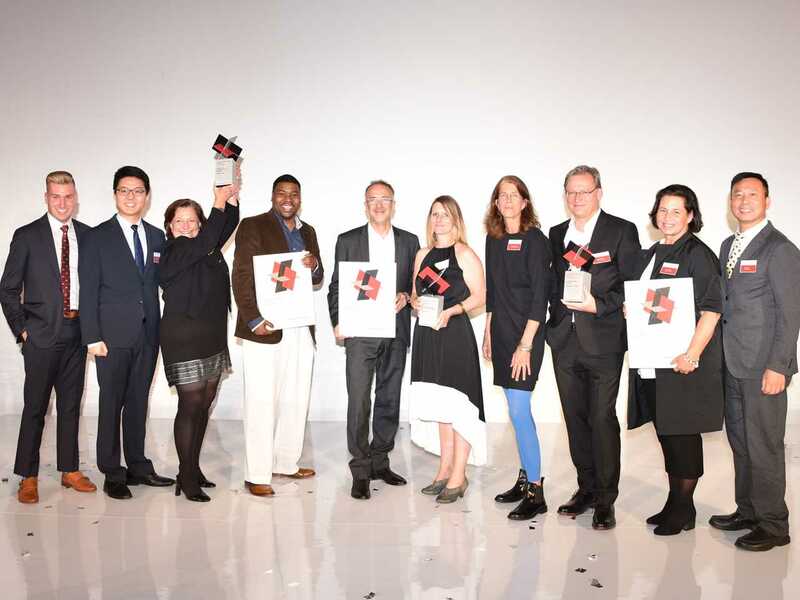 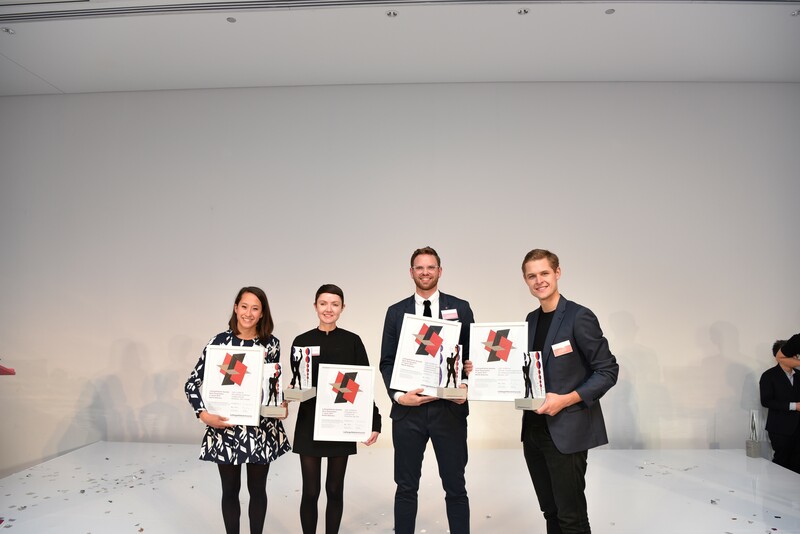 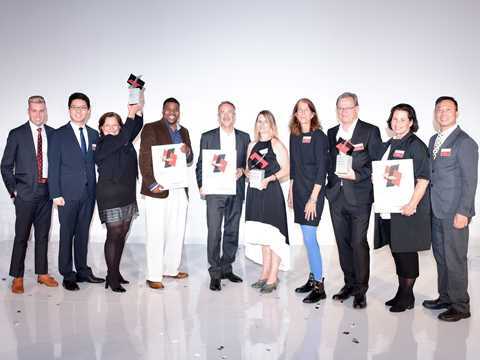 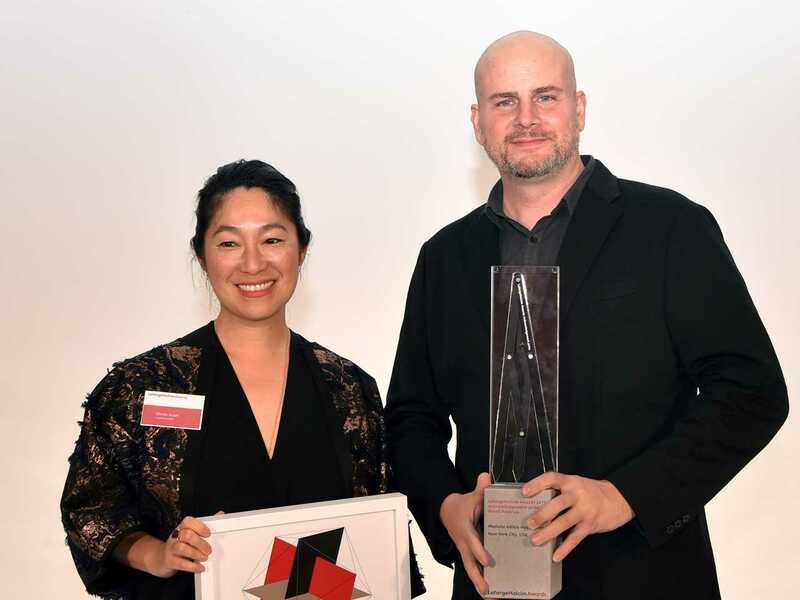 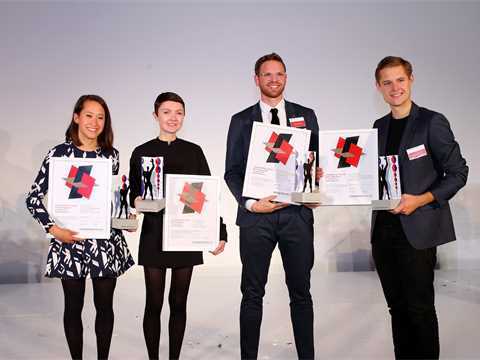 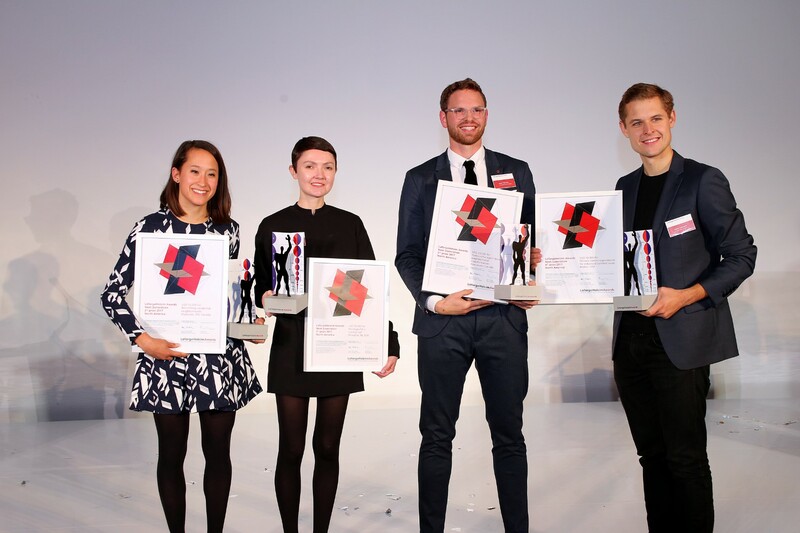 Winners of the LafargeHolcim Awards Gold celebrate (l-r): Constance Bodurow from studio[Ci], Detroit, USA with Eric Mahoney, Will Bright, Haibin Tan and Jinru Shen. 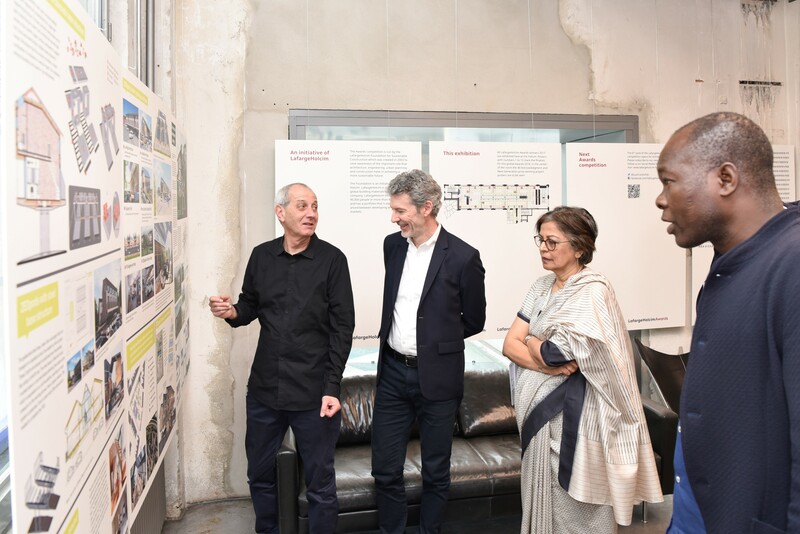 Driving the project (l-r): Will Bright, representing the residents of Seebaldt Street, Architect Constance Bodurow, and designer Eric Mahoney. 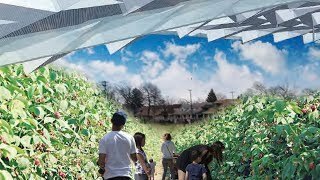 This neighborhood-scale project reimagines empty lots as collective infrastructure for energy and food production, as well as civic engagement, Detroit, USA. 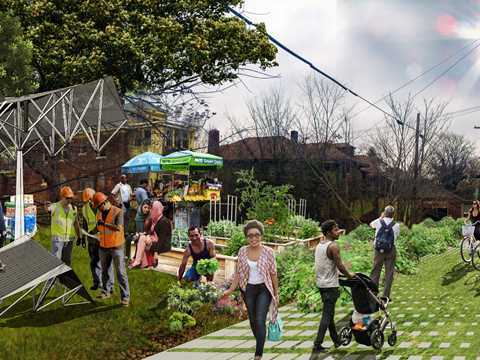 Building on long-term community engagement, the large group of collaborators proposes a pilot project for local energy and food production, water and waste management, and community empowerment. 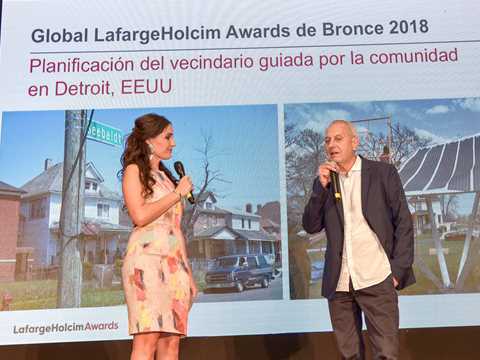 A picnic party including the entire neighborhood was enabled by the LafargeHolcim Foundation to celebrate the Global Awards Bronze winning project 2018. 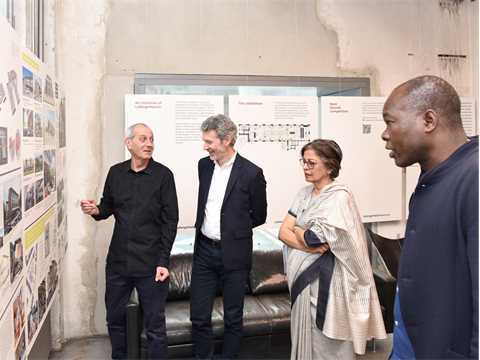 The program enabled guests to learn about TSP and visit a prototype element to generate solar power, collect rainwater and encourage urban farming. 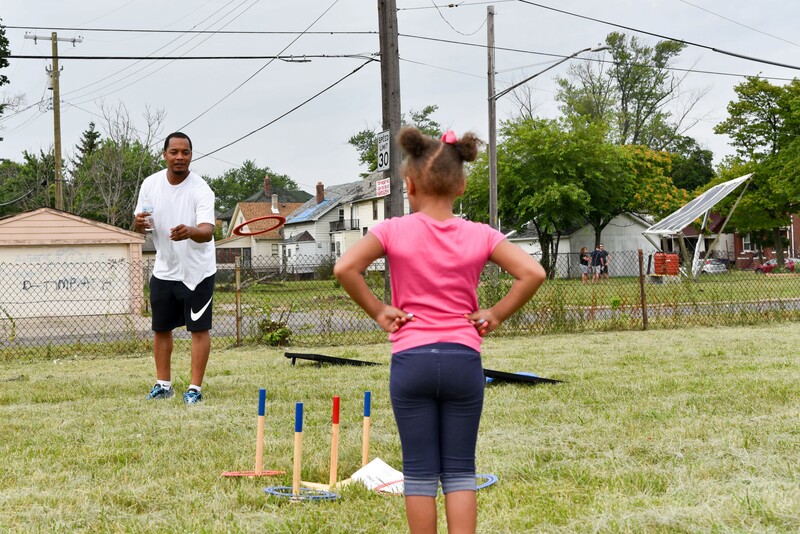 A community-driven contribution to brighten the future of residents in the “Comeback City” of Detroit. Kids of the neighborhood where invited to play baseball and other games, have a BBQ lunch and experience further attractions. 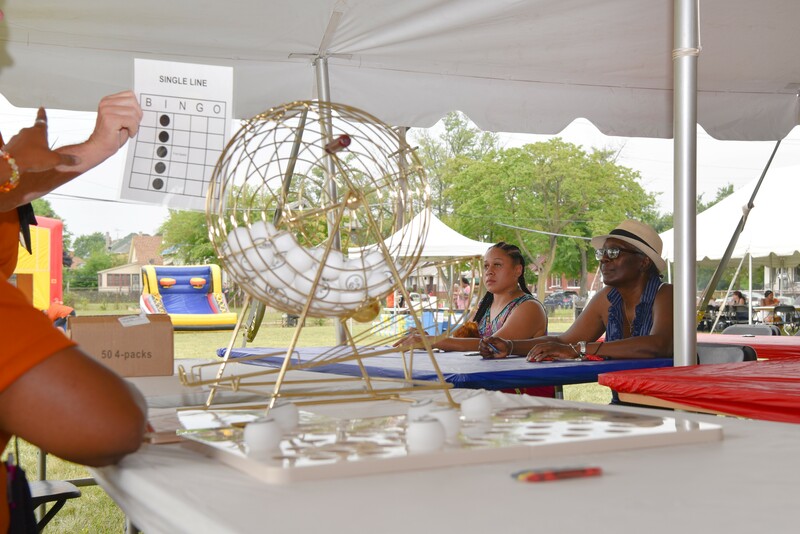 Parents had a choice of games including bingo – all leading to attractive prizes for participants of all ages. 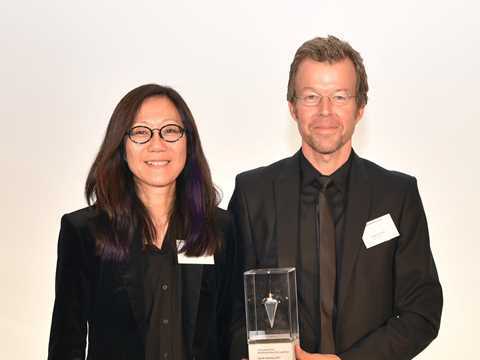 At the Waterview Loft dinner event: members of the team with Barry Descheneaux, Manager Product Development at LafargeHolcim in the US and Marc Angélil, member of the Board and Head of the Academic Committee of the LafargeHolcim Foundation, who explained why the Global Awards jury had selected TSP for a prize from the finalists from all regions of the world. 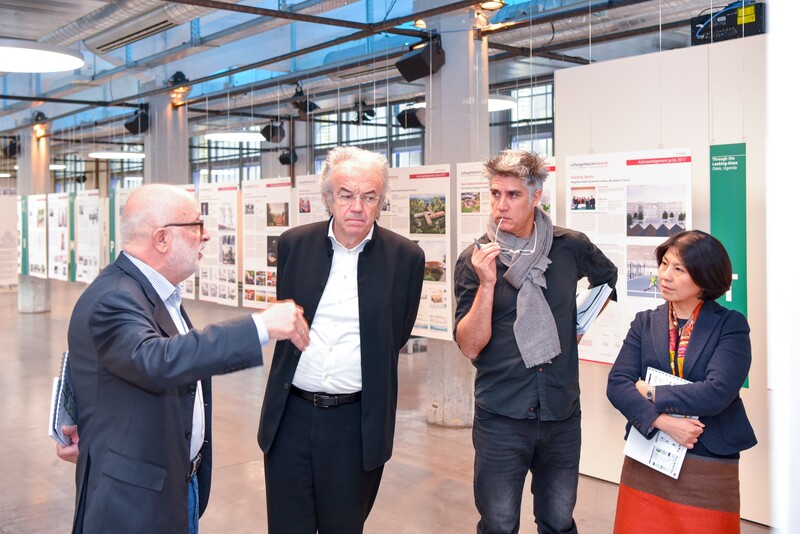 Project posters at the Waterview Loft dinner event. 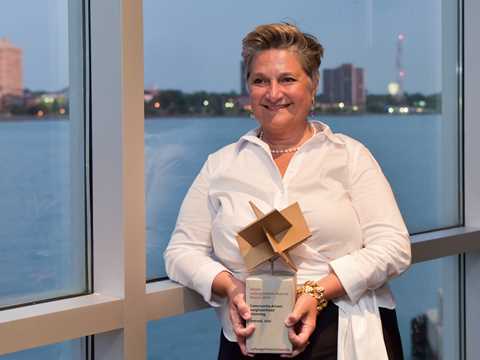 The project's main author, Constance C. Bodurow, studio[Ci], Detroit, USA. Video of jury statements and project overview were shown during the Waterview Loft dinner event. 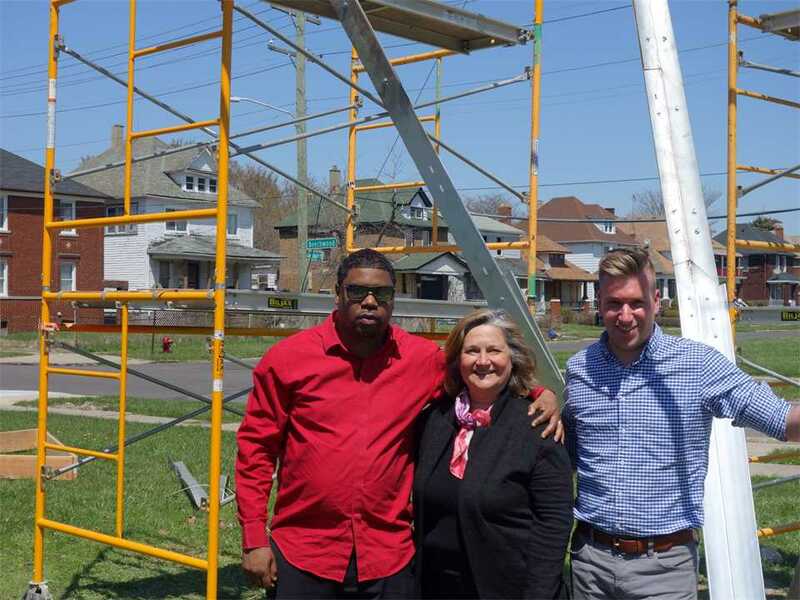 The visit to a prototype element that will generate solar power, collect rainwater and encourage urban farming with (in front of poster, l-r) project design lead Constance C. Bodurow, studio[Ci] and Joel Howrani Heeres, director of the Detroit Office of Sustainability. 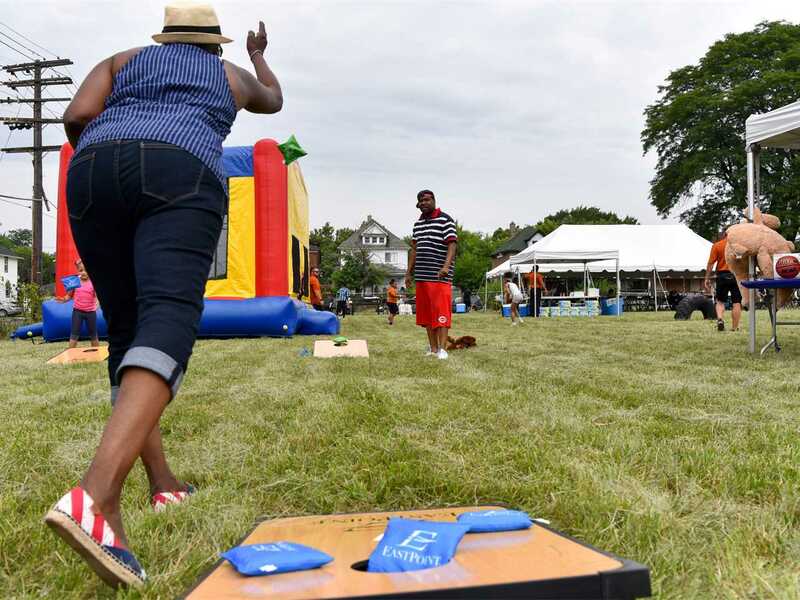 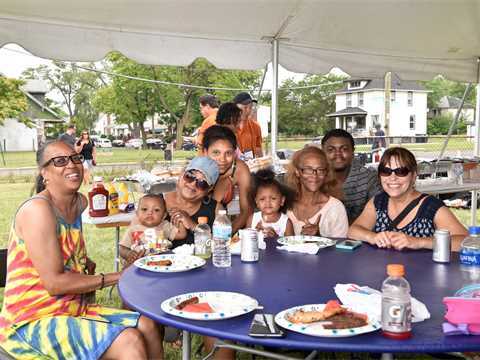 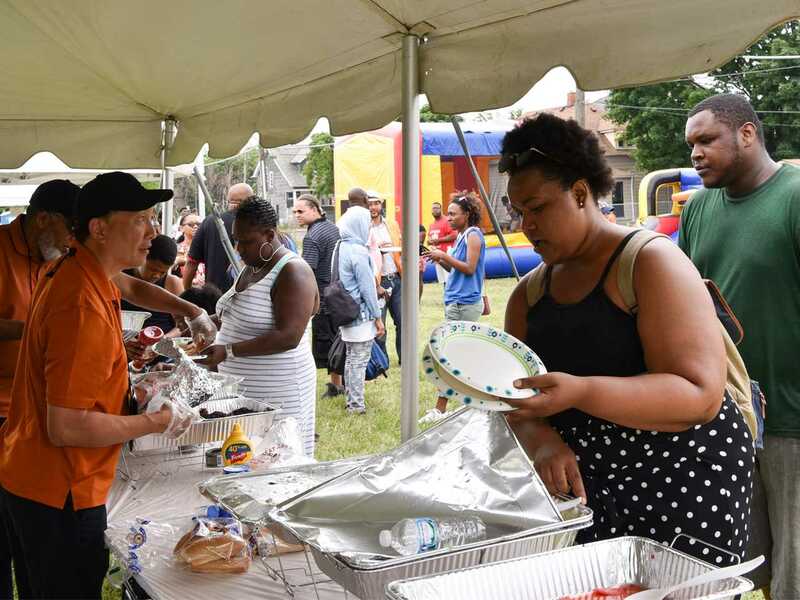 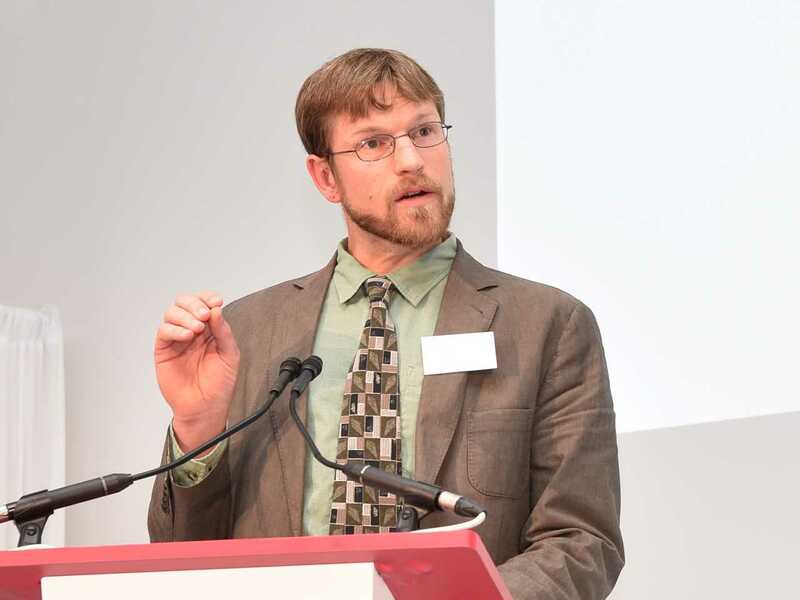 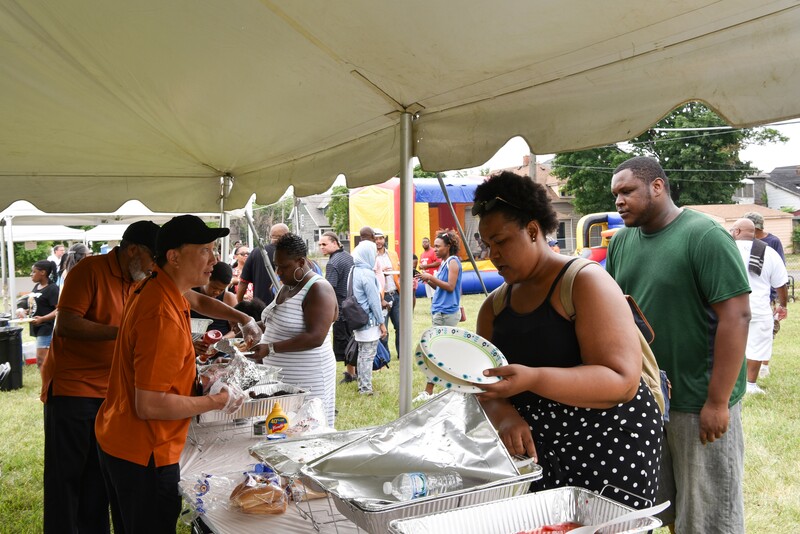 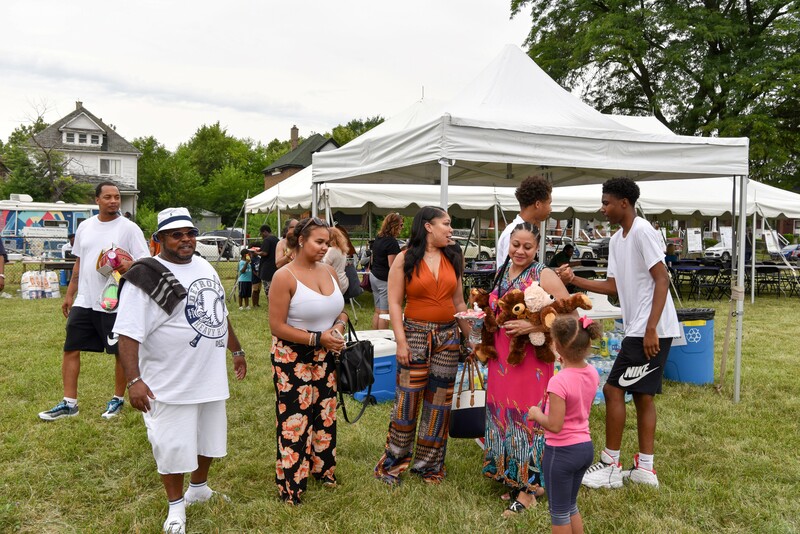 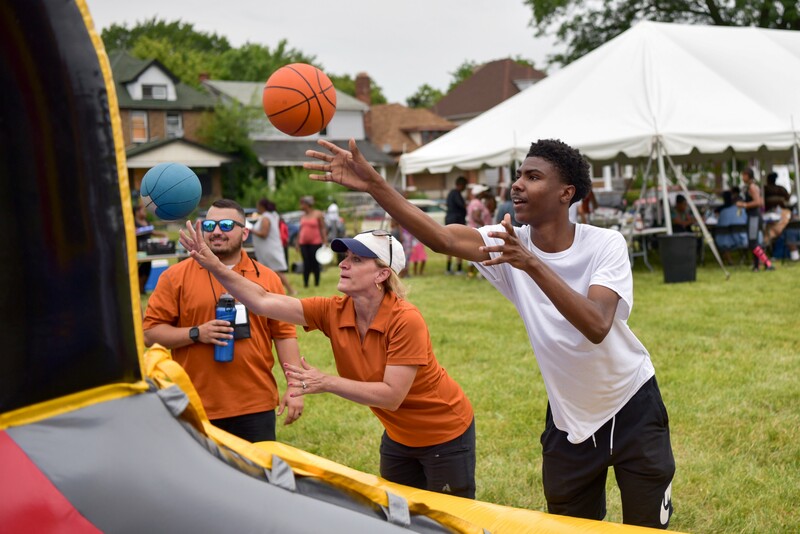 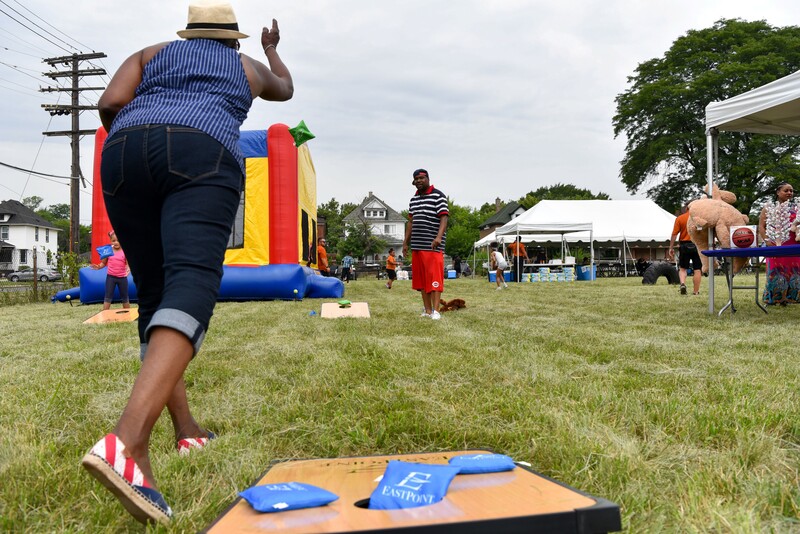 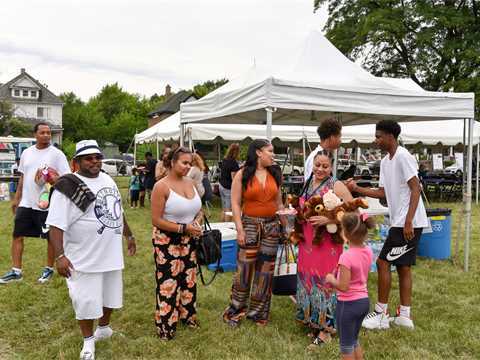 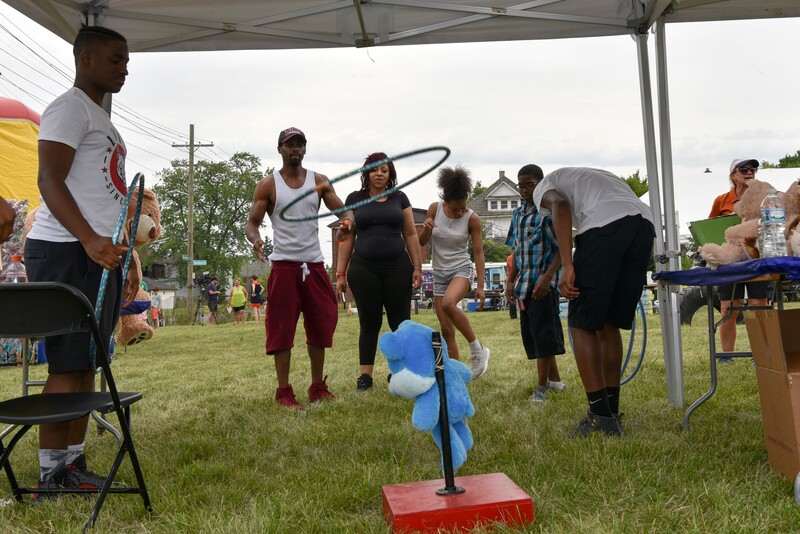 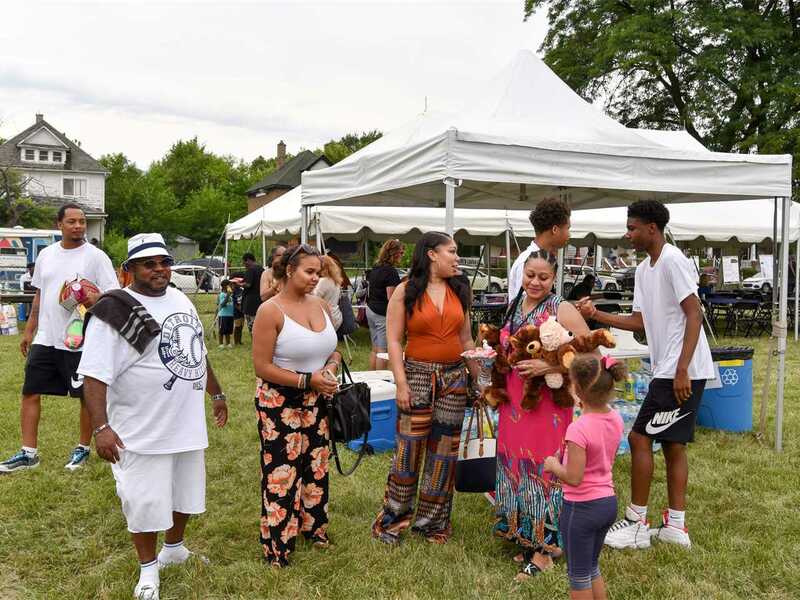 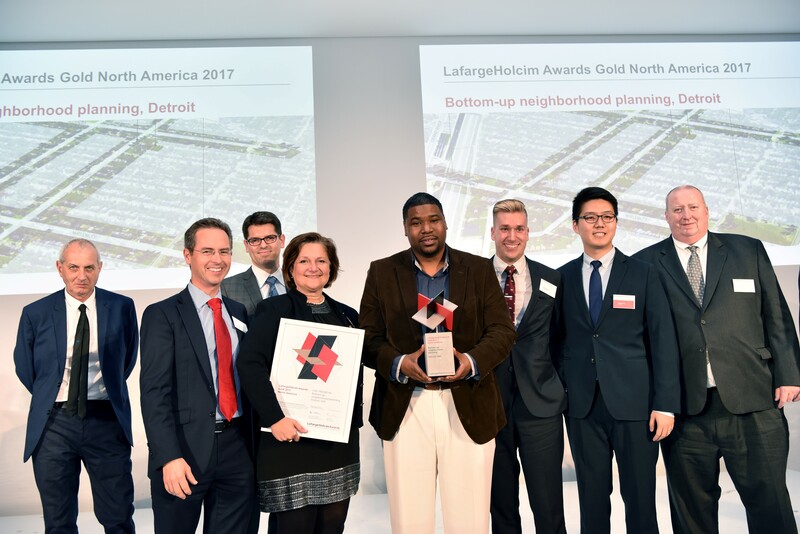 The Seebaldt Project (TSP) – “Grassroots Microgrid” – is truly a community-driven contribution to brighten the future of residents in the “Comeback City” of Detroit: A picnic party including the entire neighborhood was enabled by the LafargeHolcim Foundation to celebrate the Global Awards Bronze 2018, that was later handed over to the winning team of authors at the Waterview Loft, Port Detroit. 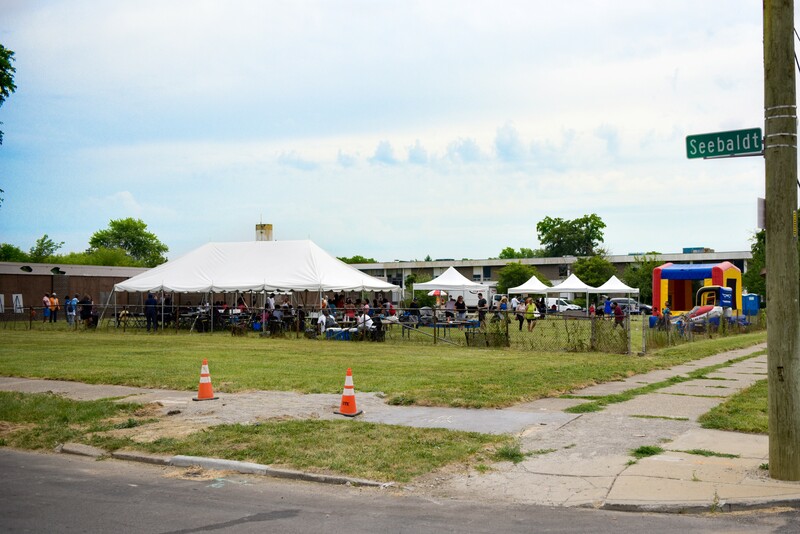 The DJ, the cook and many more involved in the Seebaldt Street party live within a stone’s throw of the open air location where all the kids of the neighborhood where invited to play baseball and other games, have a BBQ lunch and experience further attractions down to “eat as much ice-cream as you can”. 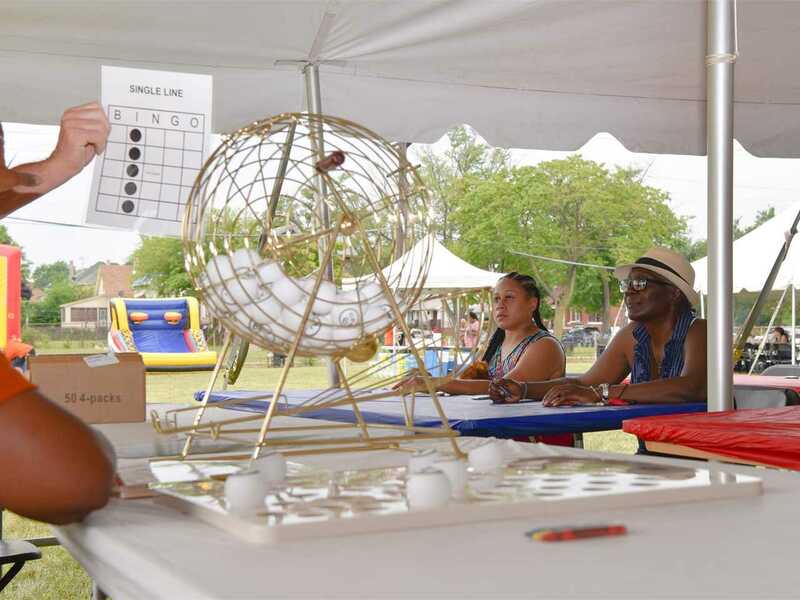 A real fire engine complete with fire fighters could be explored; while the parents had a choice of games including bingo – all leading to attractive prizes for participants of all ages. The program enabled guests to learn about TSP and visit a prototype element to generate solar power, collect rainwater and encourage urban farming. 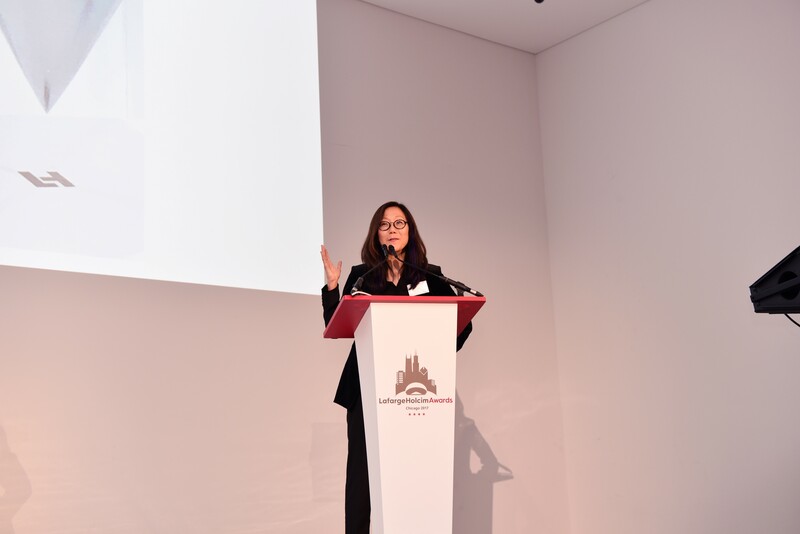 A series of speeches demonstrated the importance of the project and the support it is receiving from many sides. State Representative candidate and TSP co-initiator Rico Razo set the frame before the guests were addressed by representatives of the community, involved organizations, the TSP author team and Joel Howrani Heeres, director of the Detroit Office of Sustainability that was created by Mayor Mike Duggan in 2017. 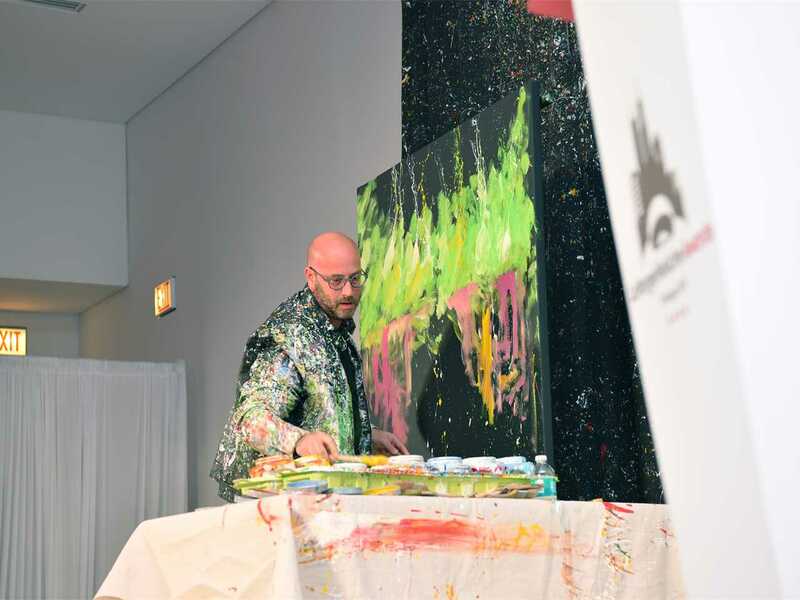 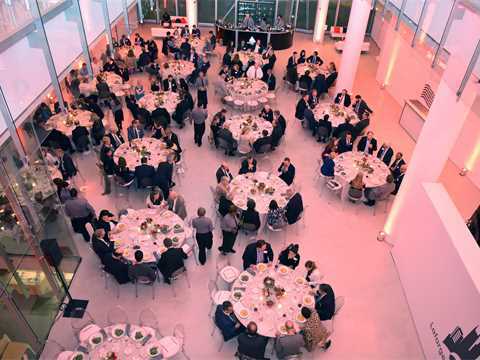 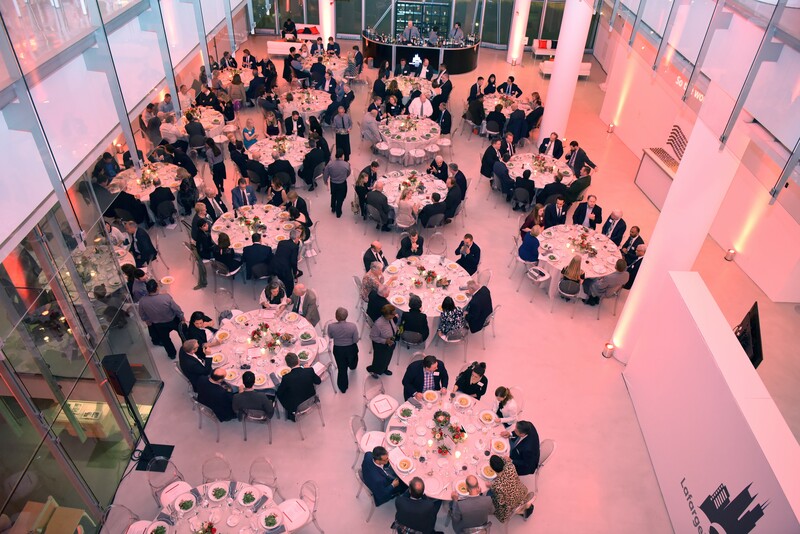 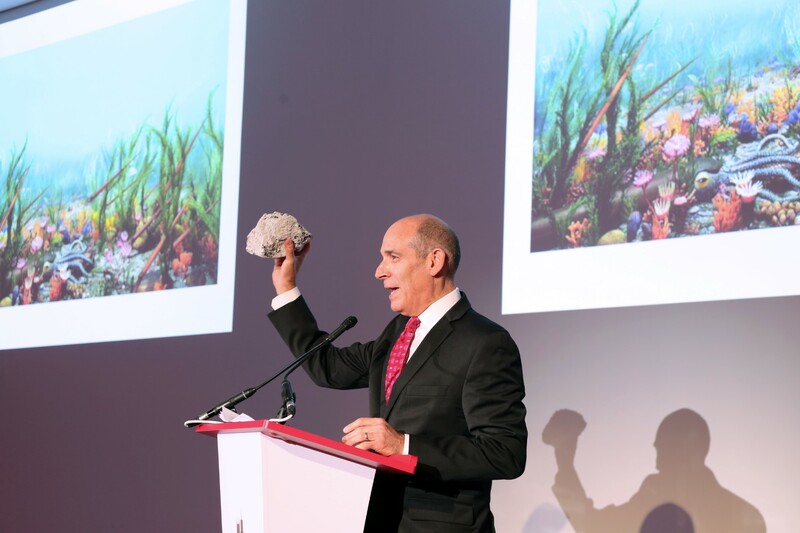 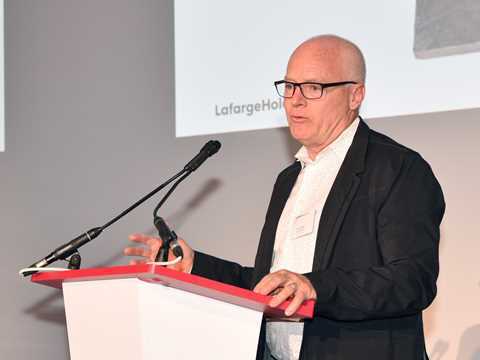 At the Waterview Loft dinner event Marc Angélil, member of the Board and Head of the Academic Committee of the LafargeHolcim Foundation, explained why the Global Awards jury had selected TSP for a prize from the finalists from all regions of the world. 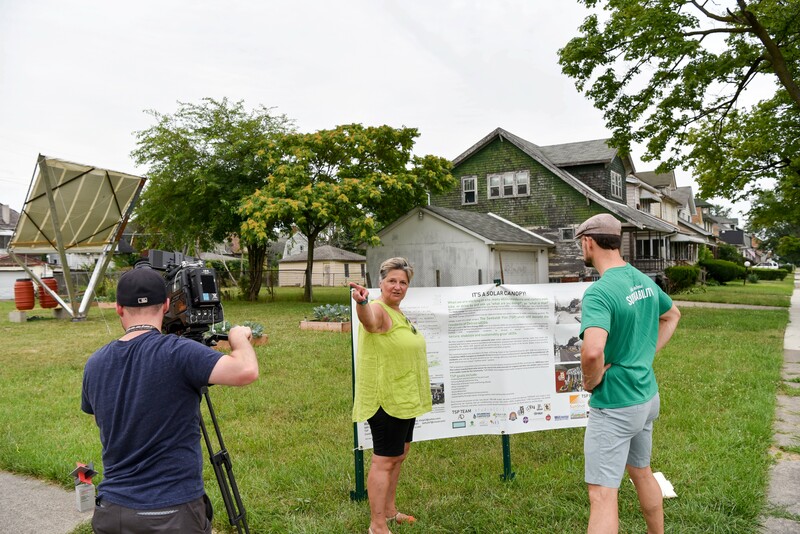 The Seebaldt Project – “Grassroots Microgrid” – is an outstanding example of the many ongoing projects dedicated to increasing the quality of live in Detroit in a sustainable way. 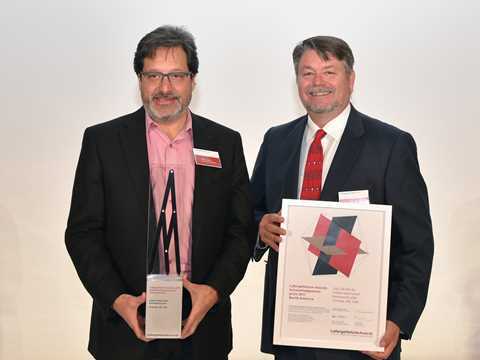 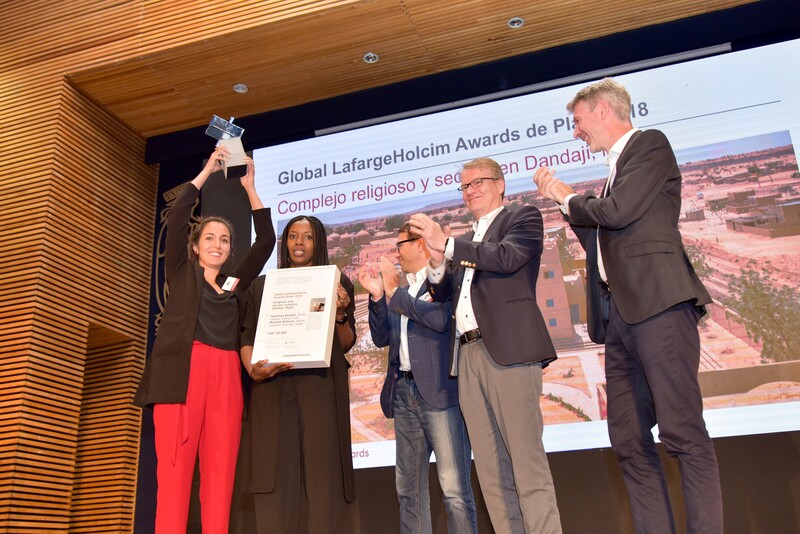 Together with Barry Descheneaux, Manager Product Development at LafargeHolcim in the US, Marc Angélil congratulated Constance Bodurow and her large team of TSP co-authors on their success in the Global Awards competition. The project had also won the LafargeHolcim Awards Gold for North America in 2017. 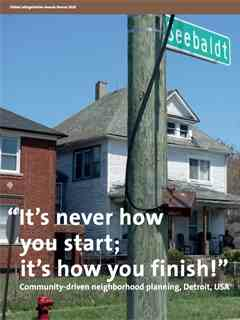 Seebaldt Street Detroit: every third house is vacant. 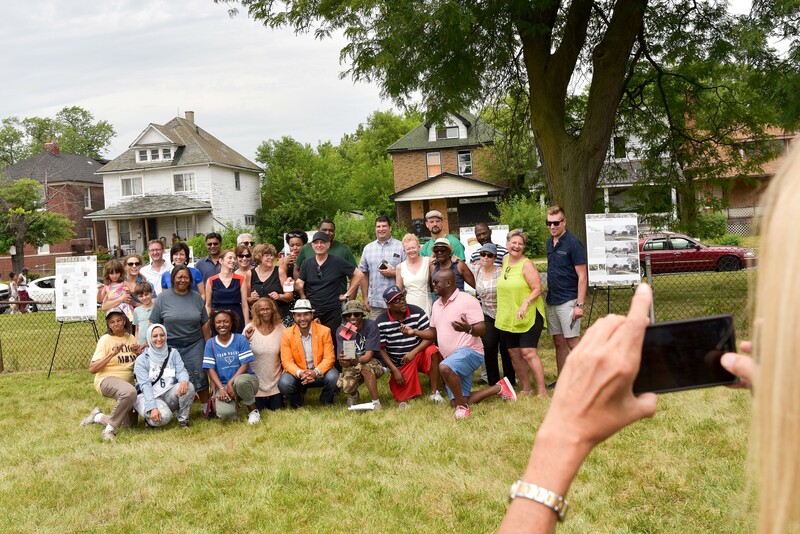 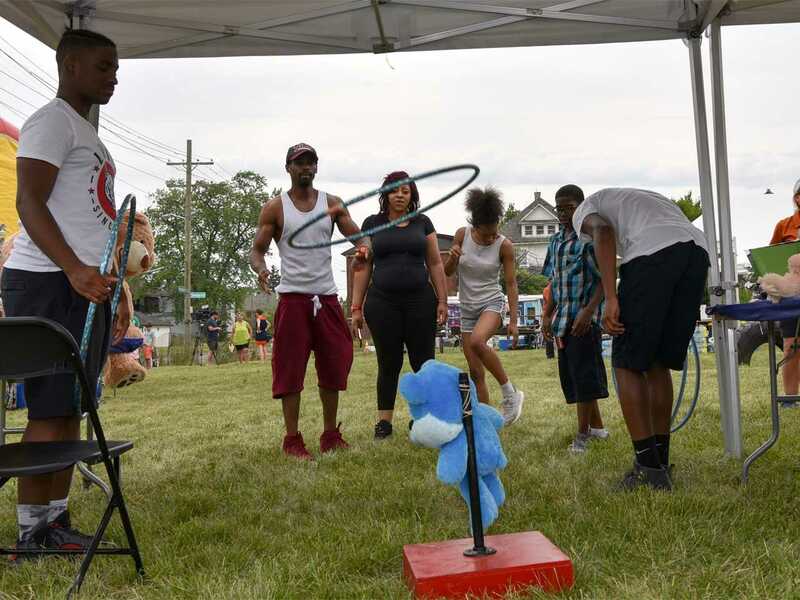 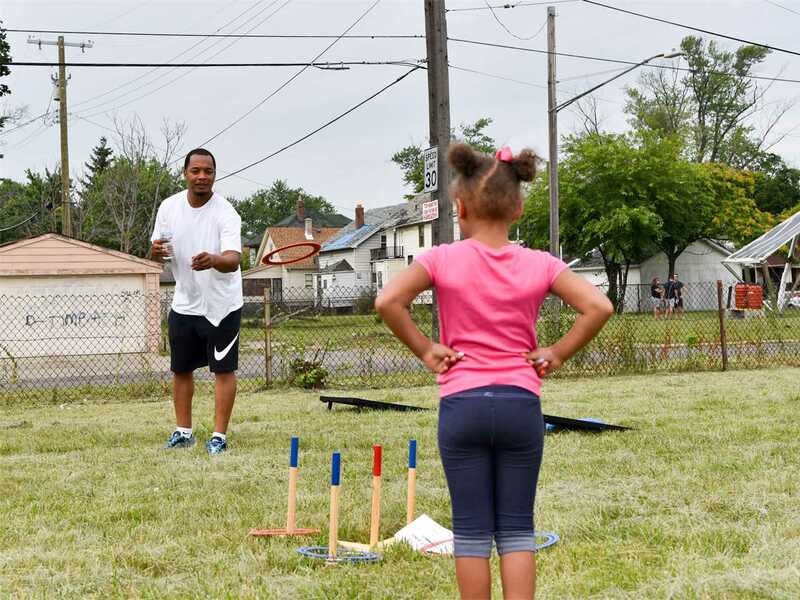 A project to drive long-term community engagement has started to make tangible steps forward in suburban Detroit. 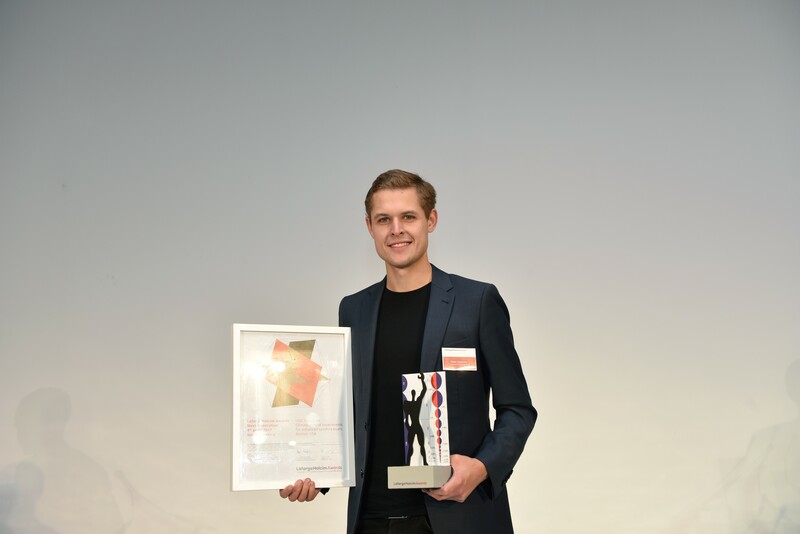 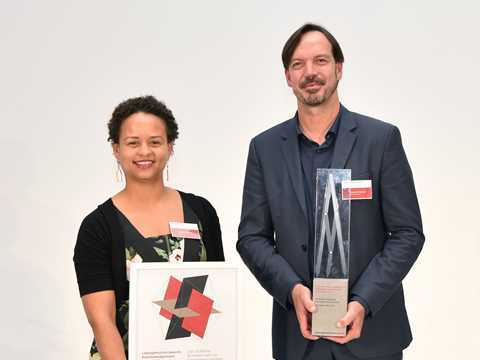 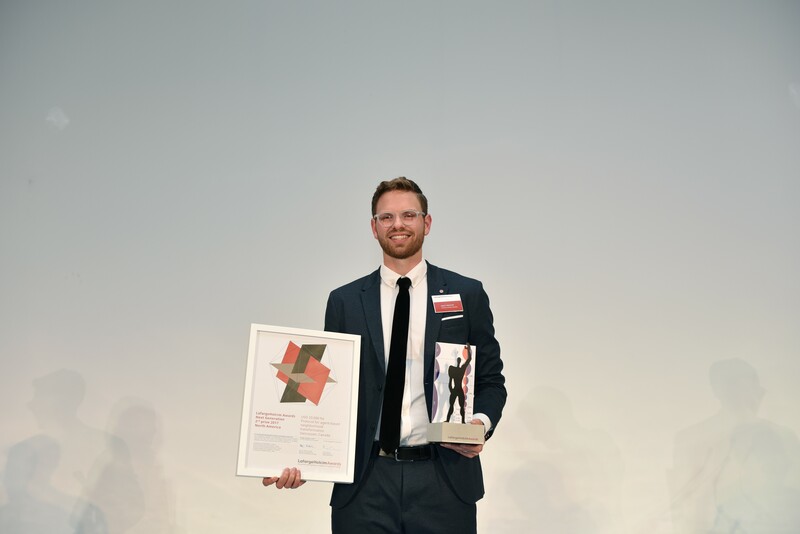 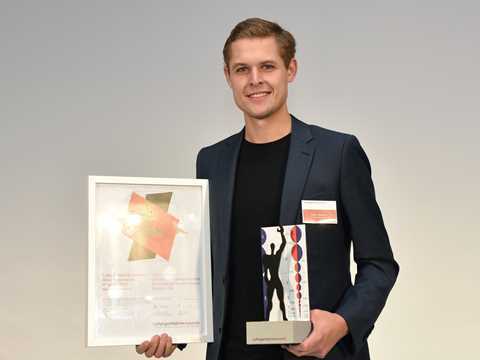 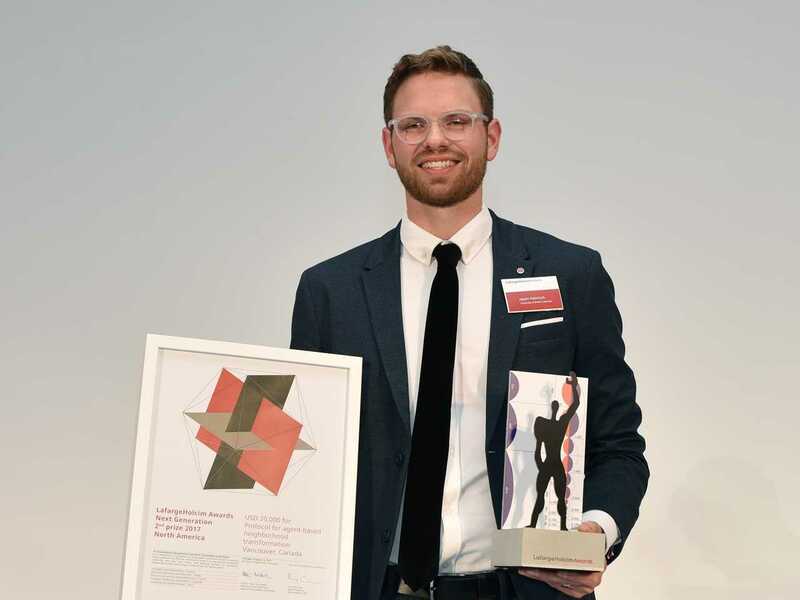 The Global LafargeHolcim Awards Bronze 2018 winner aims to improve living conditions in an area emerging from economic decline. The components of the project include solar power generation, rainwater collection and urban farming – which all make the neighborhood more attractive for renters and potential home-owners, thereby building momentum for urban recovery. 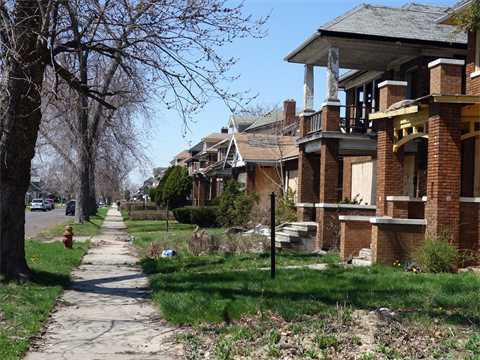 A third of the houses on Seebaldt Street in district 48204 are boarded-up and vacant. The high level of vacancy is common across Detroit where an estimated 70,000 buildings out of a total stock of 300,000 houses are unoccupied, following the decline of the auto industry and its impact on employment and city revenues. 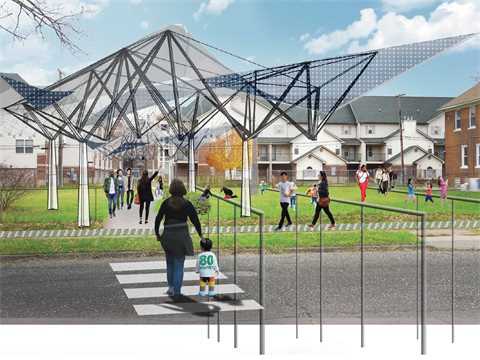 The community-driven neighborhood planning project introduces multifunctional canopies on several empty plots of land to produce solar power for the houses in Seebaldt Street and collect rain water for urban gardening projects. 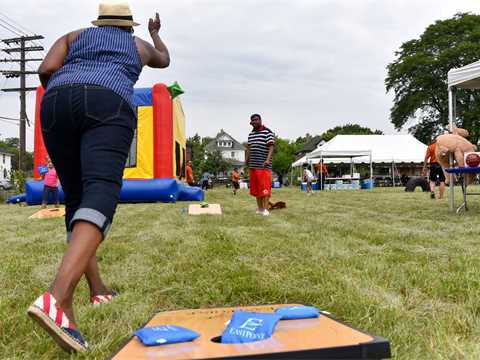 The city of Detroit has relatively high utility charges. 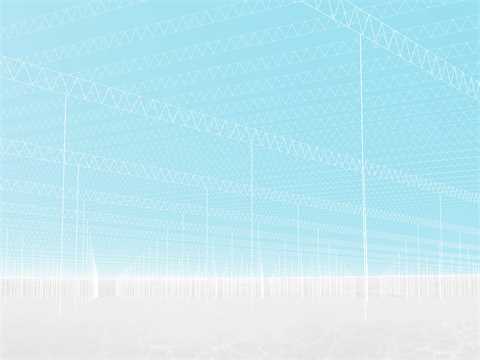 The cost of maintaining the extensive water supply network has been spread across fewer and fewer households, impacting on disposable income. 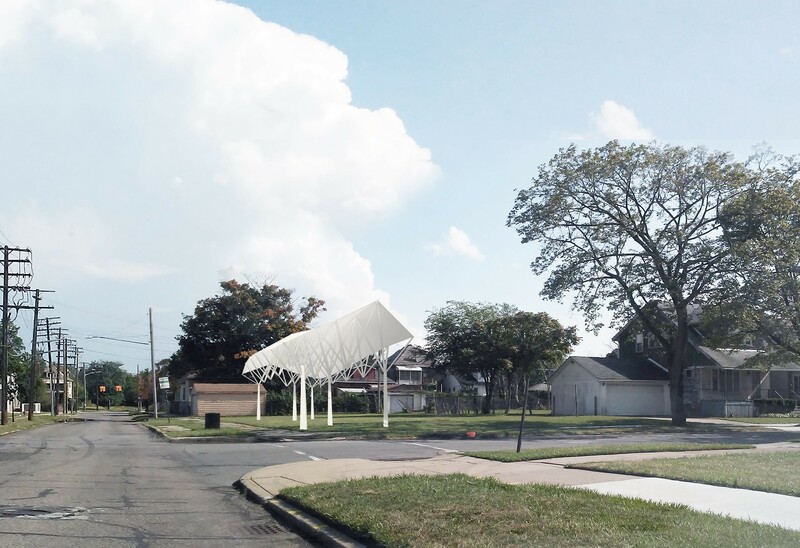 A first small-scale prototype canopy has been installed to demonstrate the positive effect of solar power and to familiarize local residents with the idea behind it. The solar panels will supply 33 houses on 40 plots of land along Seebaldt Street with electricity at lower cost. By increasing the quality of life, the project aims to trigger interest in renting or buying vacant houses that will contribute to rejuvenating the area. 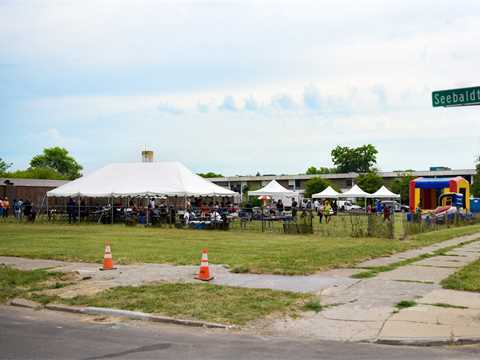 In a later phase of the project, a former schoolhouse along the street is to be converted into a local community center. 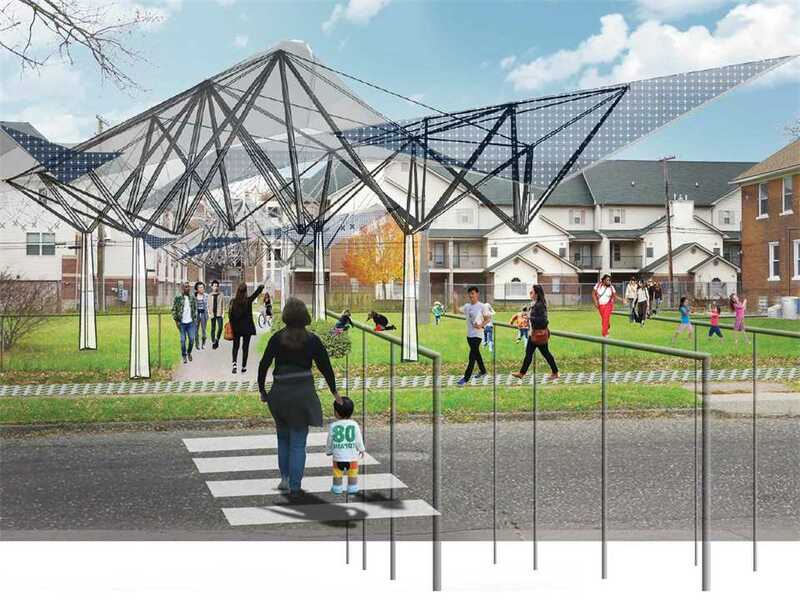 The project’s long-term vision is to create a fully functional, cooperatively owned “micro-grid” that will deliver both reduced energy and water costs and a revenue stream for community services, initiatives, and investments within an enhanced public realm. 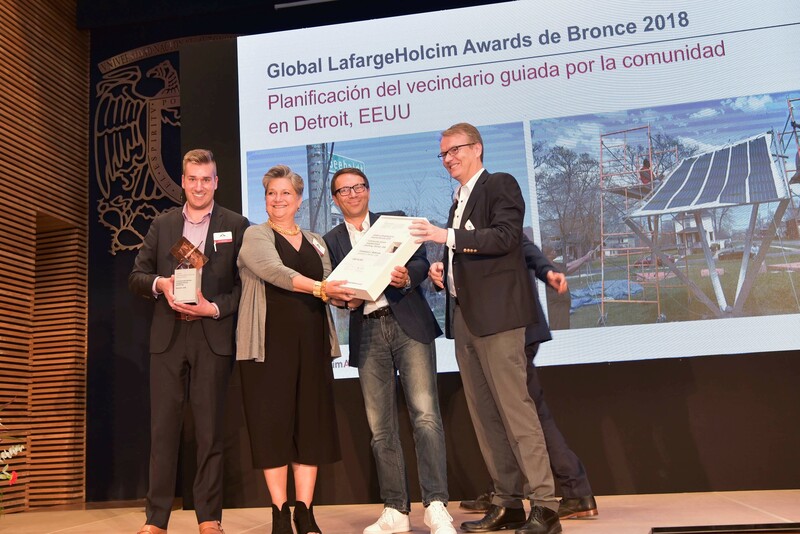 “Hydropuncture”, Global LafargeHolcim Awards Gold winning project in Mexico City, is a water retention and treatment complex including flood basins and public amenities with spaces that follow the gravitational logic of flowing water. 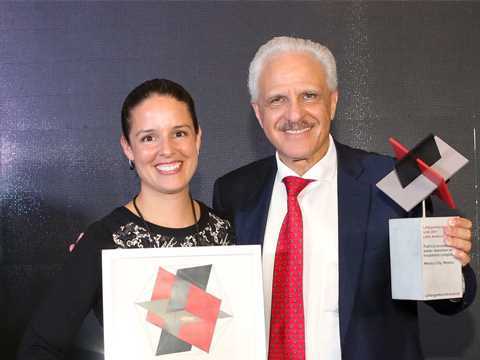 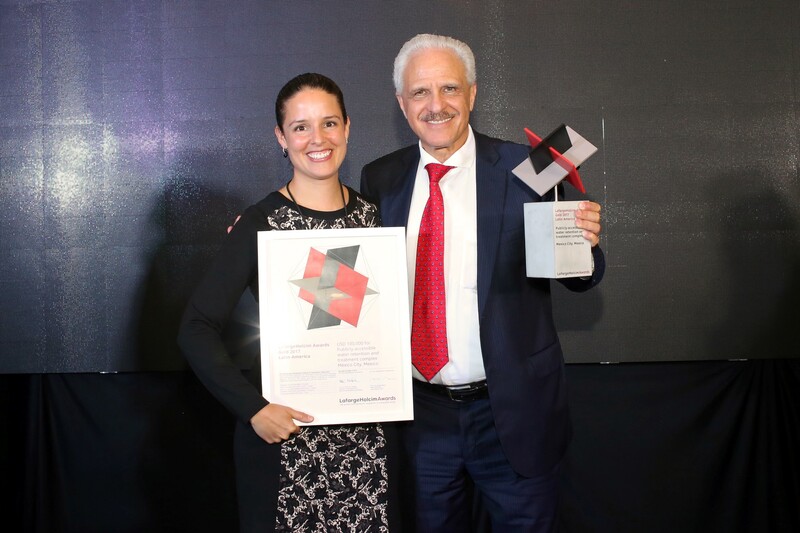 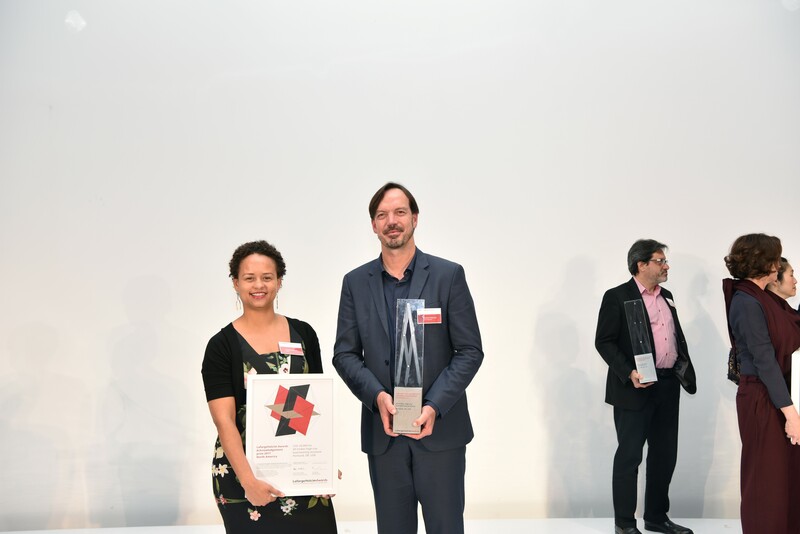 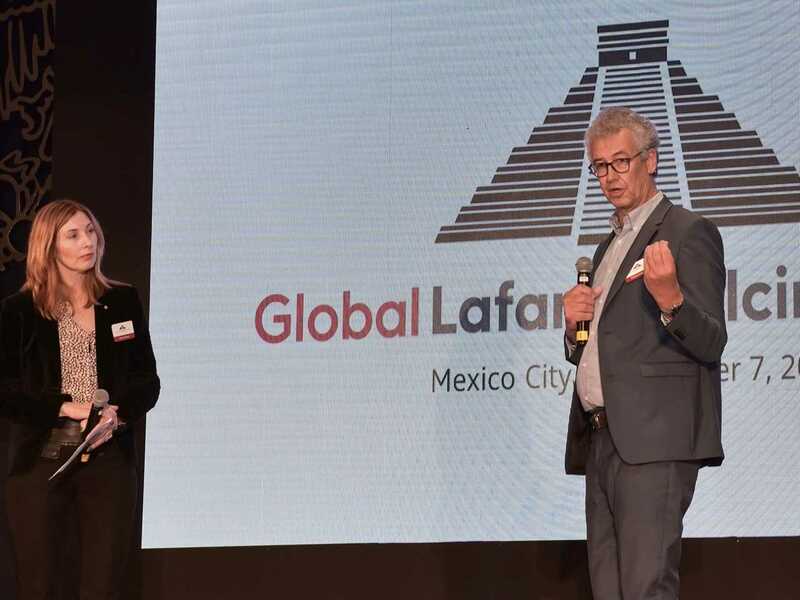 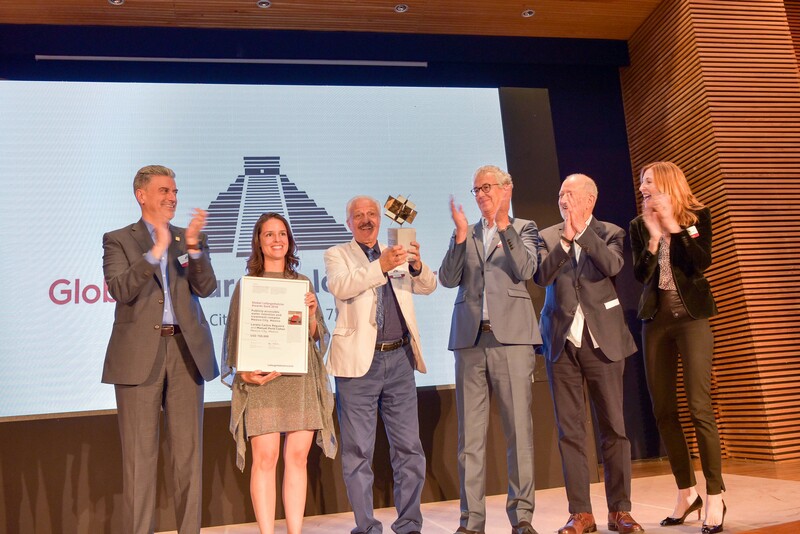 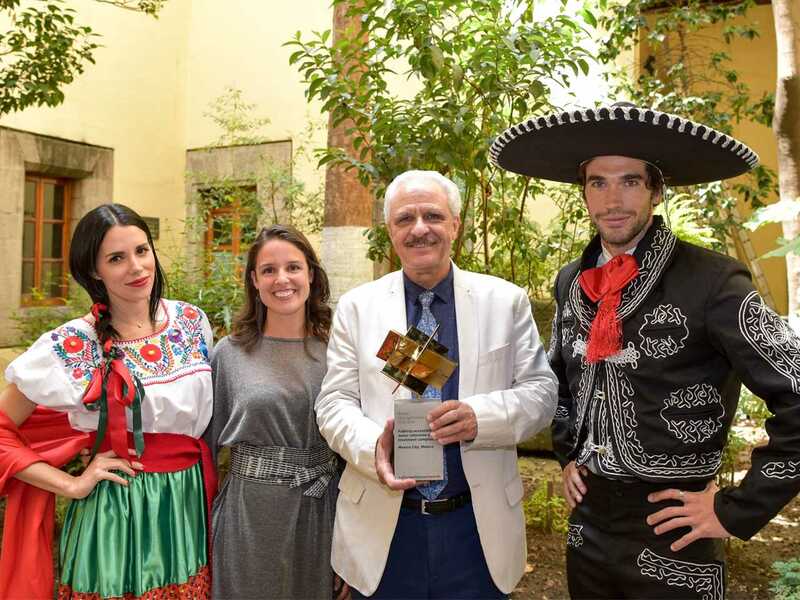 Winners of the Global LafargeHolcim Awards Gold 2018 (l-r): Loreta Castro Reguera and Manuel Perló Cohen, Universidad Nacional Autónoma de México, Mexico City for Publicly-accessible water retention and treatment complex in Mexico at the regional prize ceremony. 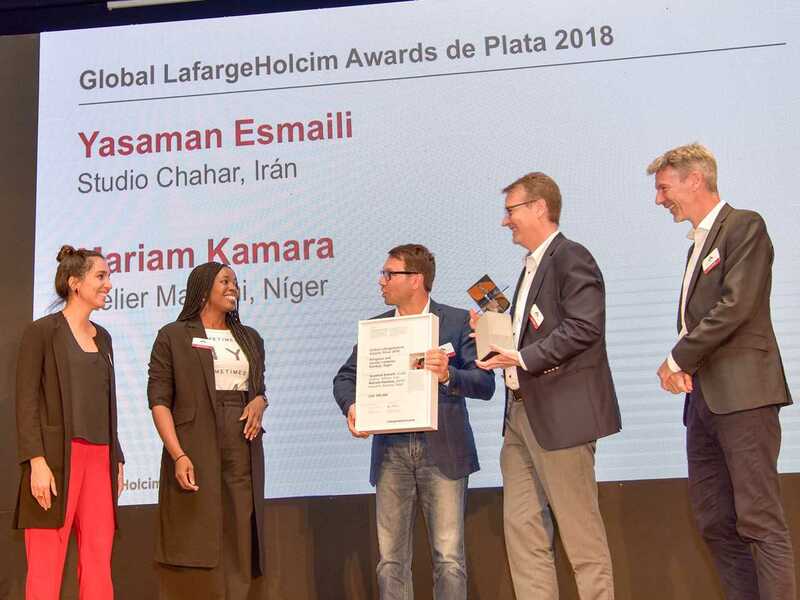 “Legacy Restored”, Global LafargeHolcim Awards Silver winning project in Niger, is a religious and secular complex that creates a civic space open to all and champions local artisanship, traditional building techniques and materials produced on site. 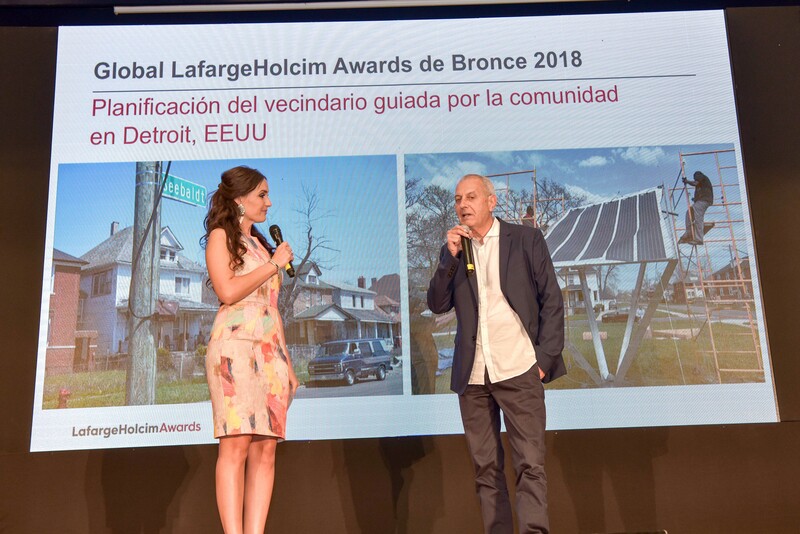 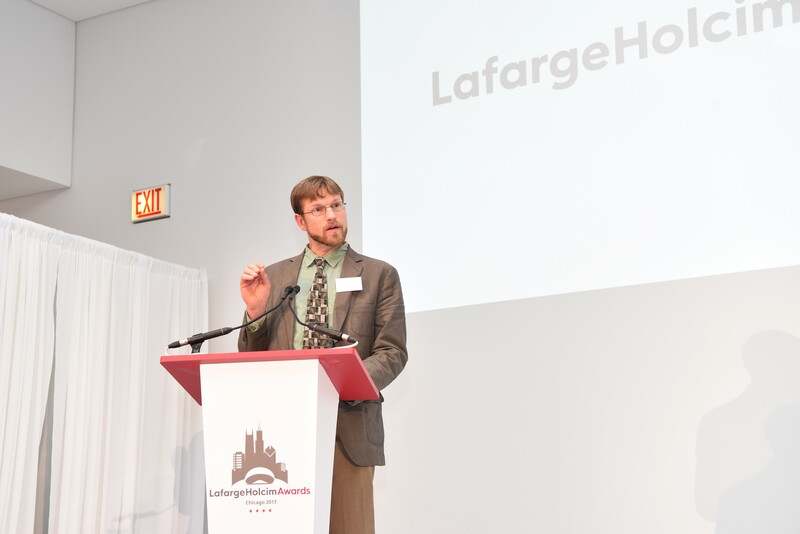 “Grassroots Microgrid”, Global LafargeHolcim Awards Bronze winning project in Detroit, is a community-driven initiative enabling neighborhoods to reach energy autonomy and creating a new economic paradigm for community renewal. 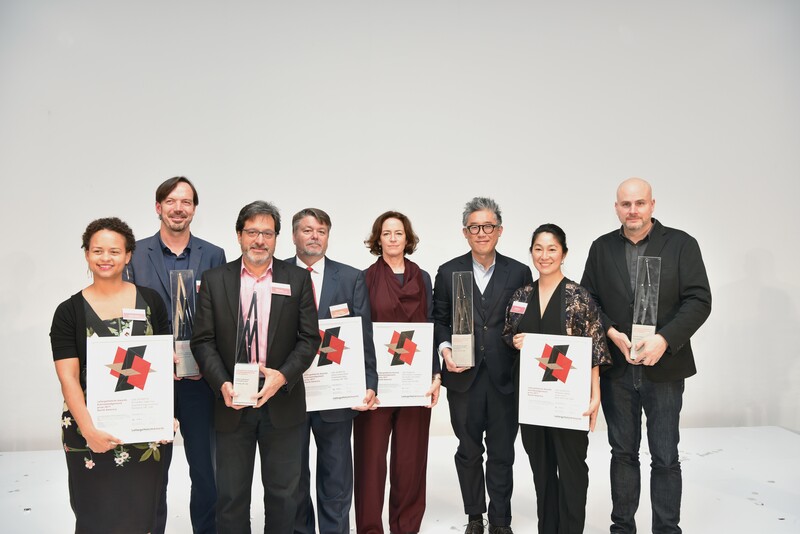 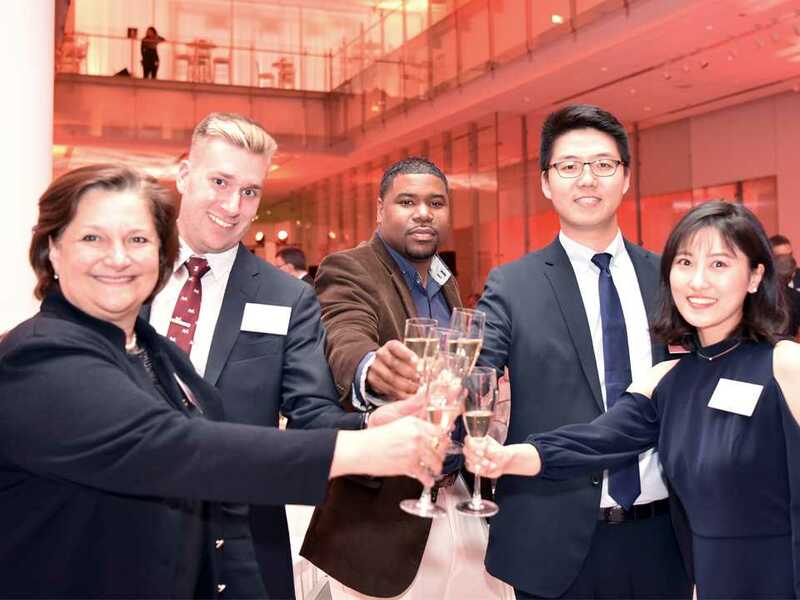 Winners of the Global LafargeHolcim Awards Bronze 2018 celebrate (l-r): Constance Bodurow from studio[Ci], Detroit, USA with Eric Mahoney, Will Bright, Haibin Tan and Jinru Shen at the regional prize ceremony. 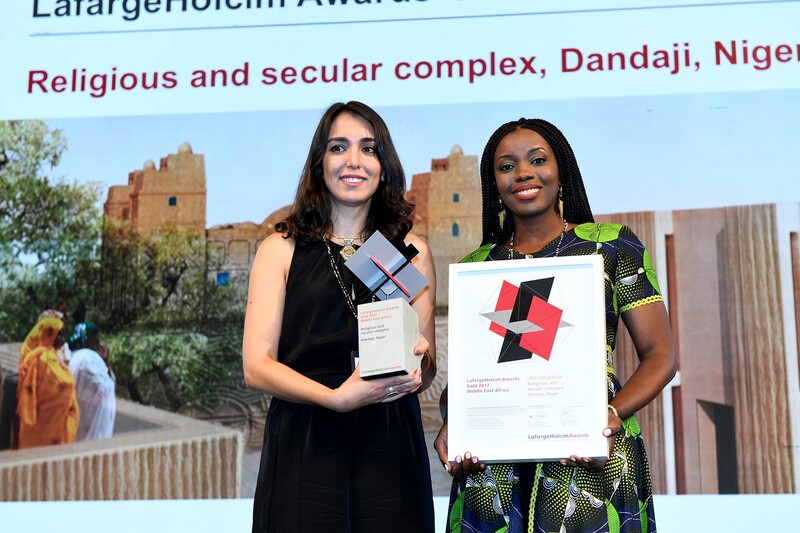 Global LafargeHolcim Awards Silver 2018 winners for Religious and secular complex, Dandaji, Niger (l-r): Iranian architect Yasaman Esmaili and Nigerien architect Mariam Kamara at the regional prize ceremony. 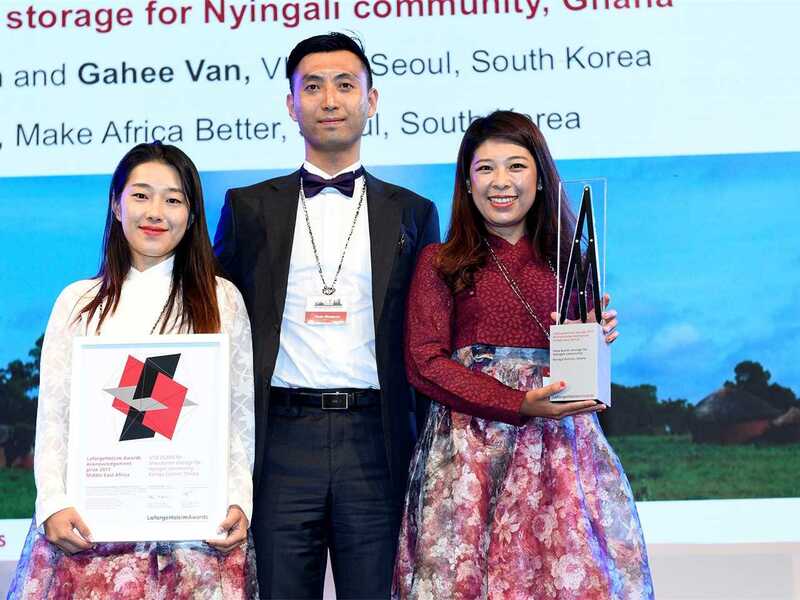 Architects Wonjoon Han and Gahee Van of VHAN together with Sookhee Yuk from Make Africa Better led a South Korean team designing shea butter storage towers in Nyingali, Ghana that won a LafargeHolcim Awards Ideas prize; they enable passive cooling that enhances the economic viability of agriculture and an aesthetic that alludes to traditional local architecture. 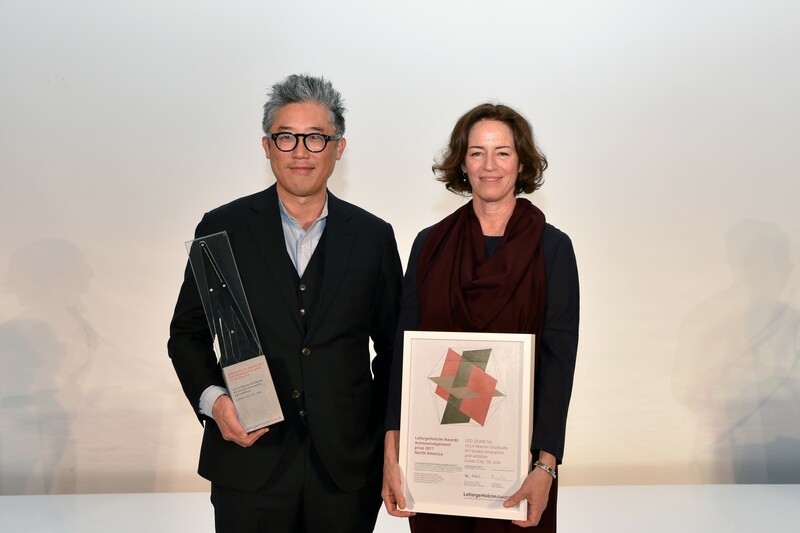 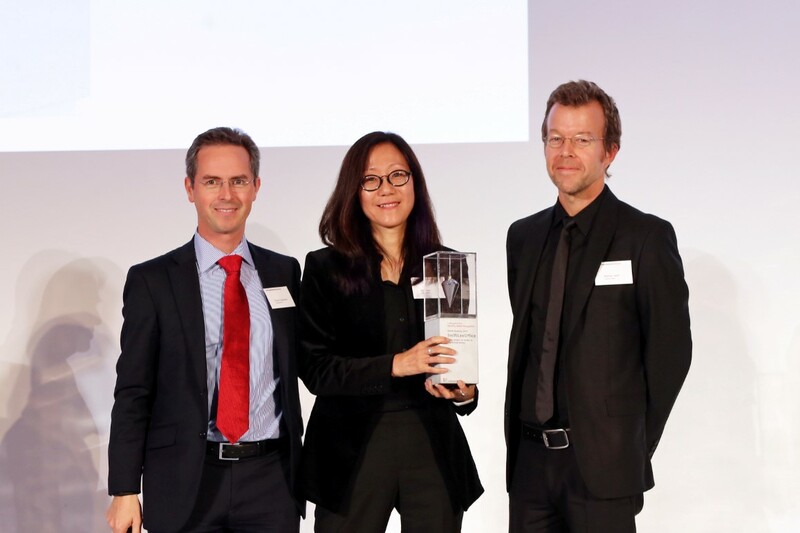 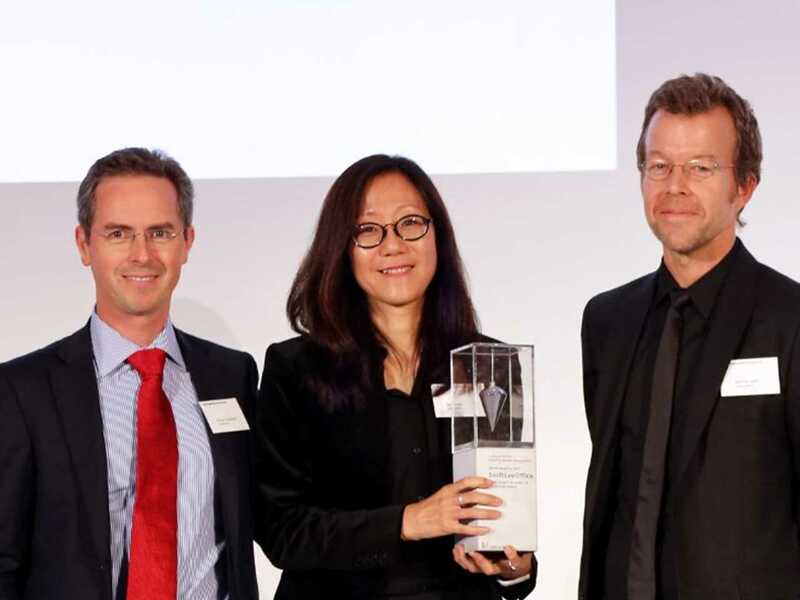 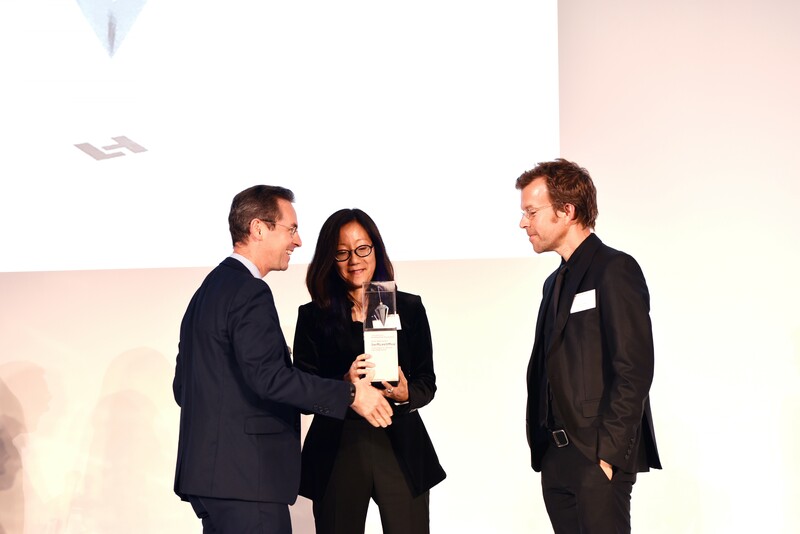 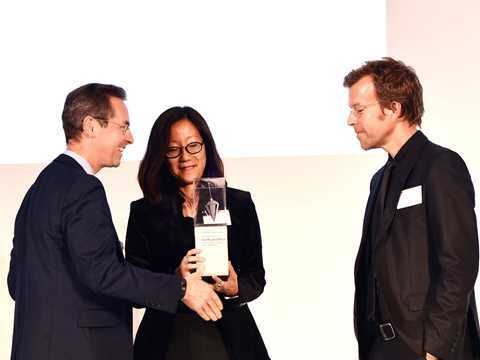 LafargeHolcim Awards Ideas prize winners (l-r): Gahee Van and Wonjoon Han of VHAN and Sookhee Yuk, Make Africa Better, all Seoul, South Korea for Refrigerating Jar: Shea butter storage for Nyingali community, Karaga District, Ghana, at the regional prize ceremony. 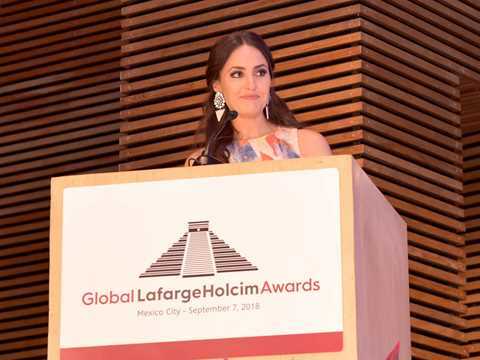 LafargeHolcim Awards Ideas prize 2018 winner Georgina Baronian, student at Princeton University in the USA, developed a prototype of a large-scale structure using water on the roof as a thermal insulator and solar reflector in one. 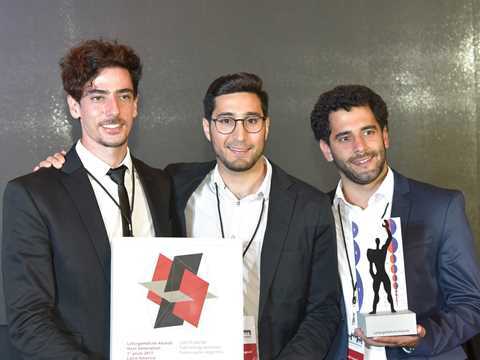 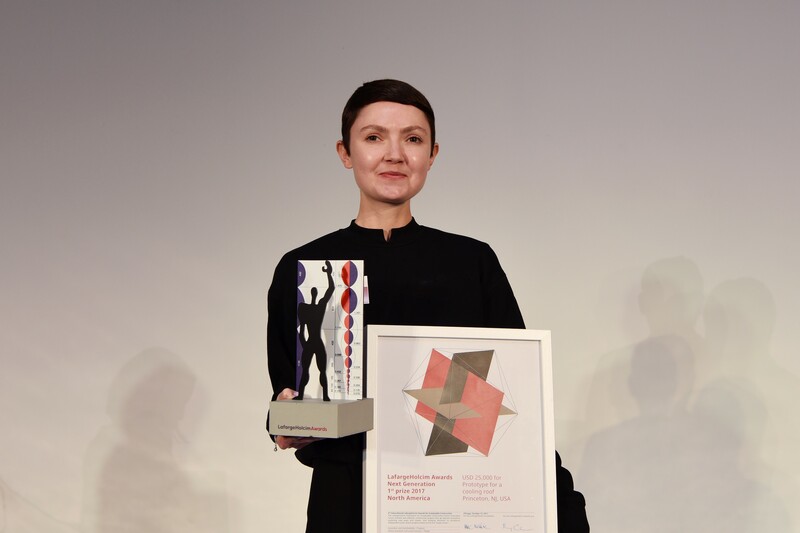 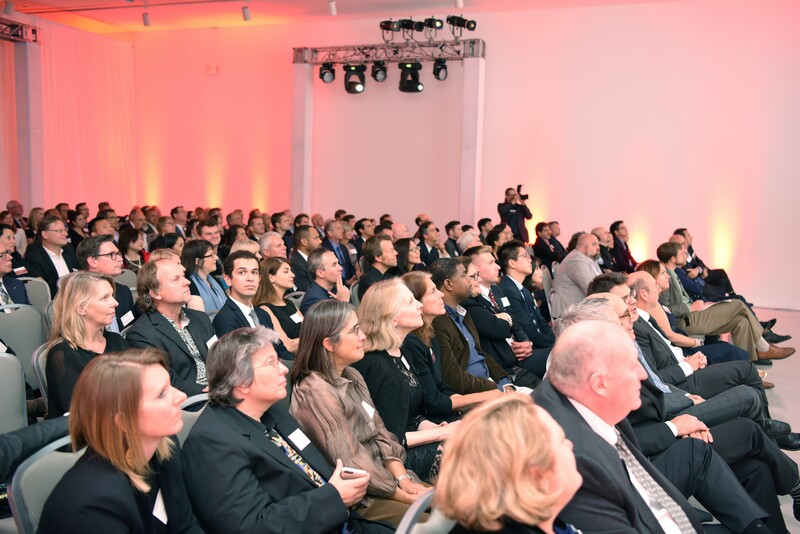 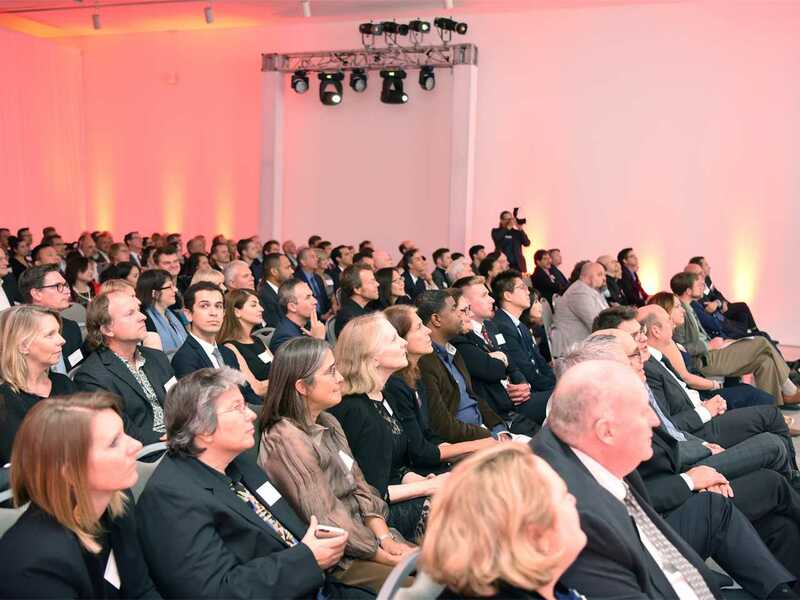 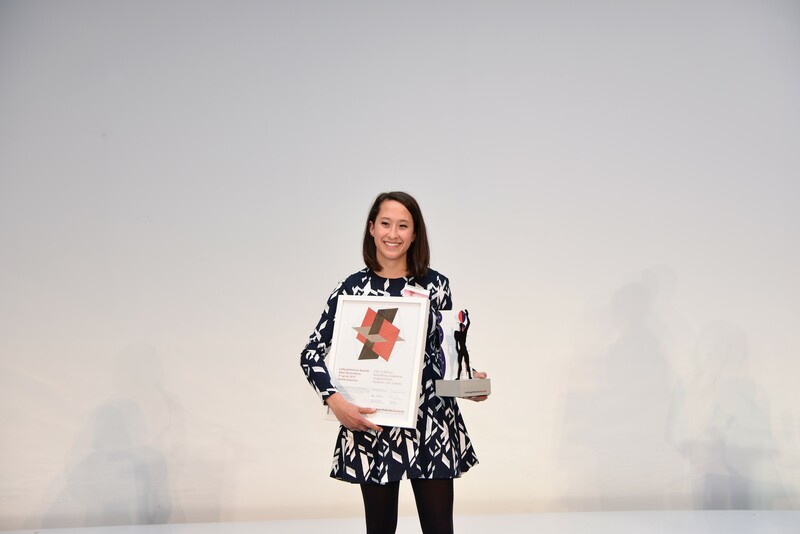 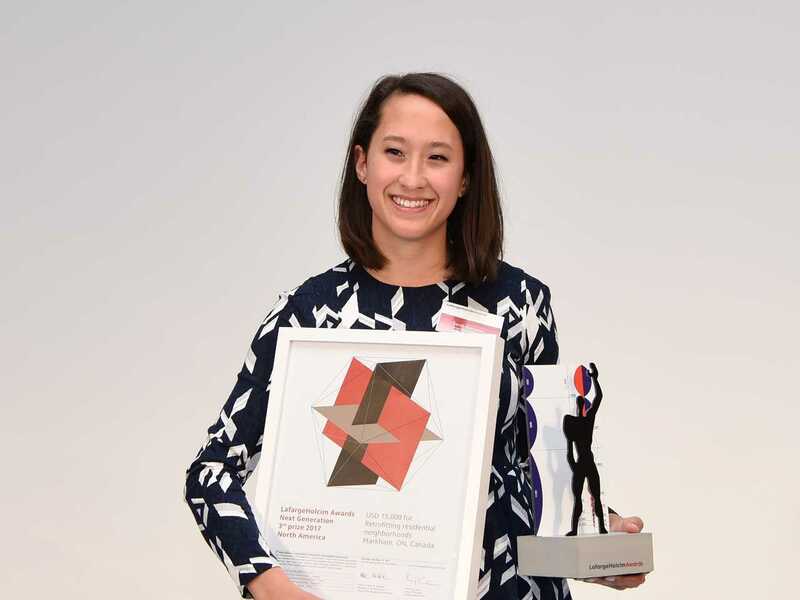 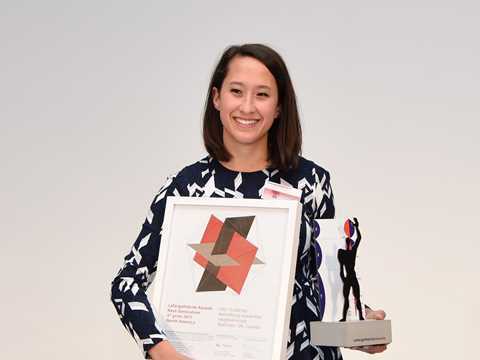 Georgina Baronian from Princeton University won the LafargeHolcim Awards Ideas prize for a Prototype for a cooling roof, at the regional prize ceremony. The infrastructure-landscape project for the generation of electric power based on tidal currents at Punta Loyola in Argentina won a LafargeHolcim Awards Ideas prize and was developed by three students from the Universidad Nacional de Córdoba in Argentina: Stefano Romagnoli, Juan Cruz Serafini, and Tomás Pont Apóstolo. LafargeHolcim Awards Ideas prize winners for Territorial Figure in Argentina, Punta Loyola, Argentina (l-r): Tomás Pont Apóstolo, Stefano Romagnoli and Juan Cruz Serafini, all Universidad Nacional de Córdoba, Córdoba, Argentina, at the regional prize ceremony. 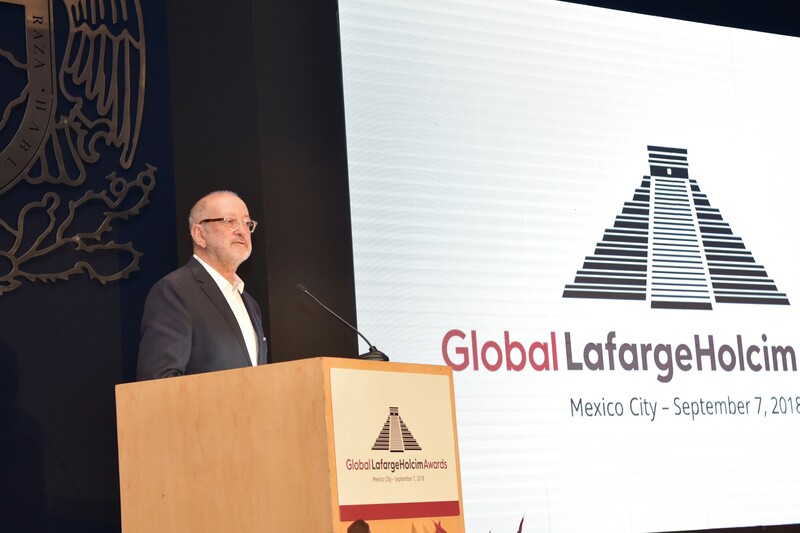 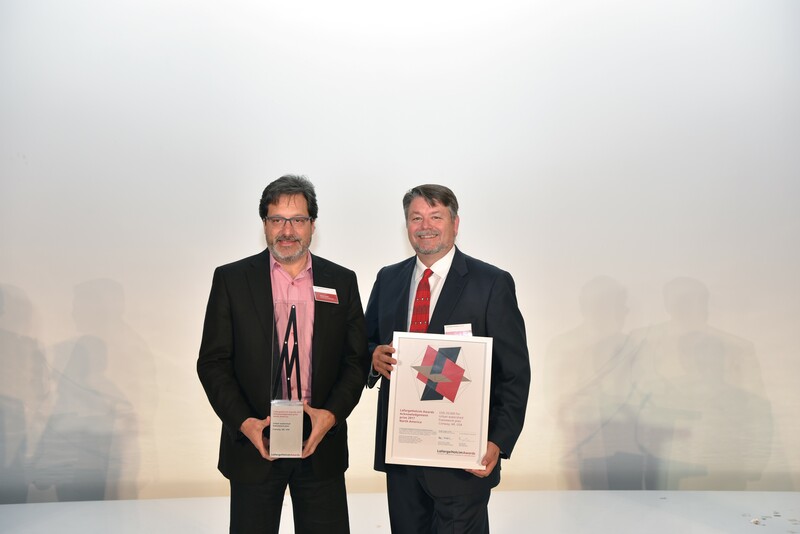 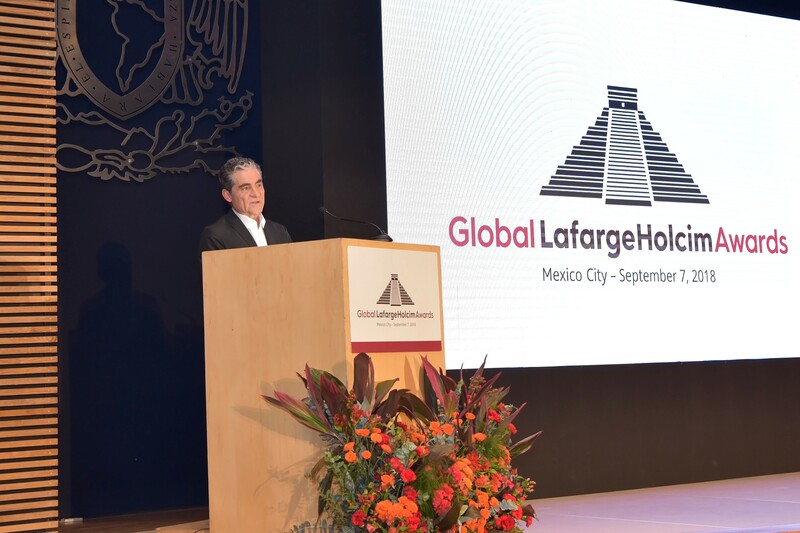 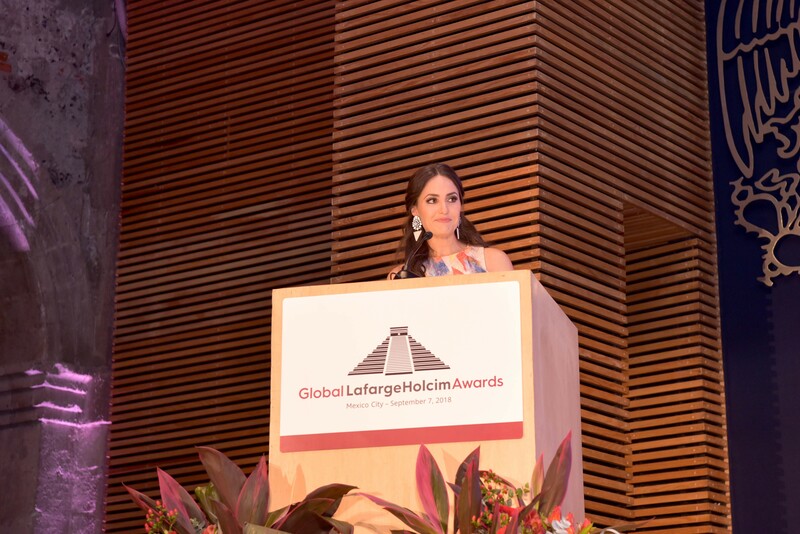 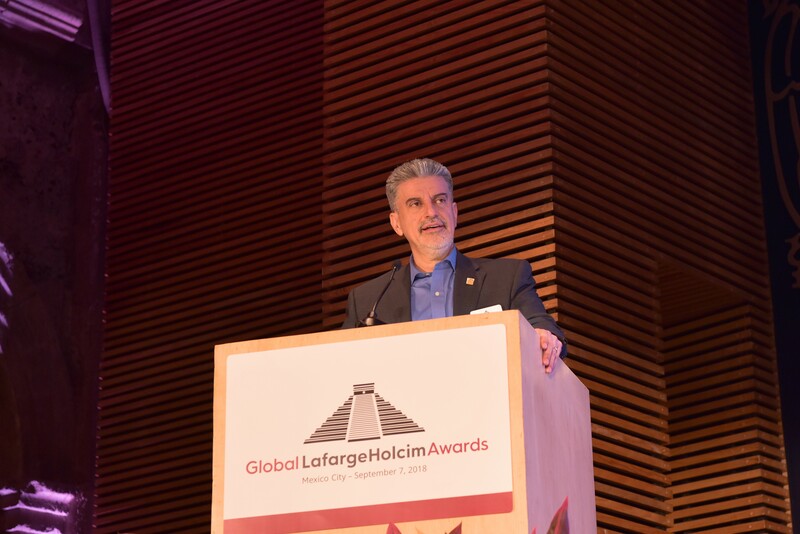 Projects in Mexico, Niger, and the USA win the 5th Global LafargeHolcim Awards for Sustainable Construction. 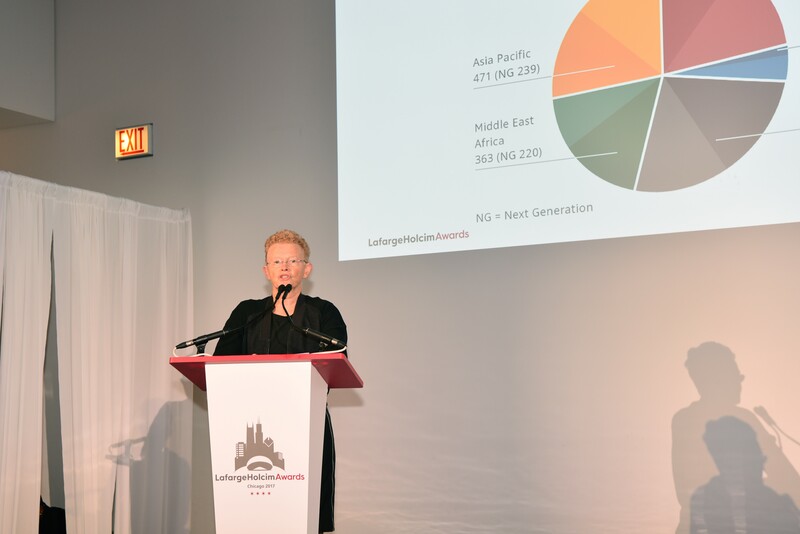 As diverse as the three top projects are in terms of geography, program and scale – they are all the result of true teamwork across generations, genders and ethnicities. 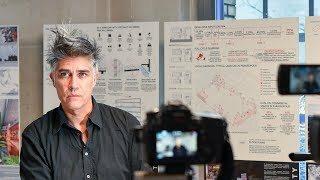 Alejandro Aravena (Chile) headed the independent jury of renowned experts who evaluated the 15 finalist projects from all continents that had qualified for the global phase of the Awards. 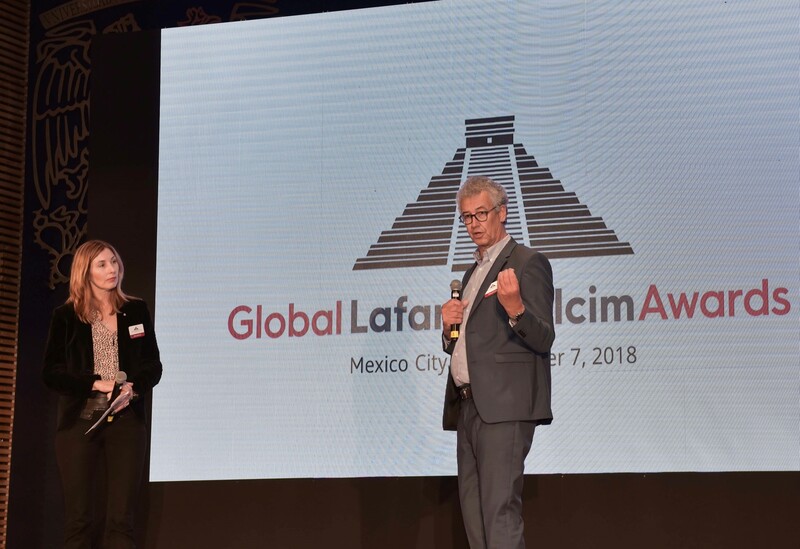 The USD 2 million competition is run by the LafargeHolcim Foundation, an initiative of LafargeHolcim, the leading global building materials and solutions company. 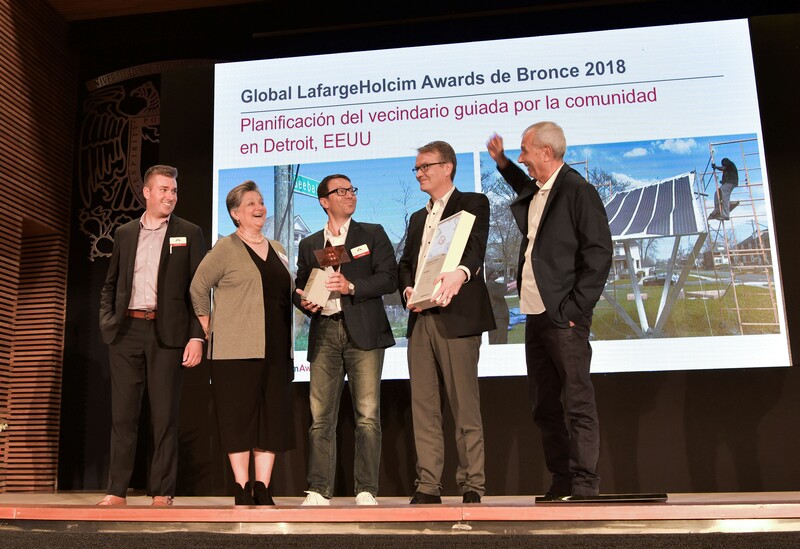 Global LafargeHolcim Awards Gold 2018 goes to “Hydropuncture”, a publicly accessible water retention and treatment complex in Mexico. 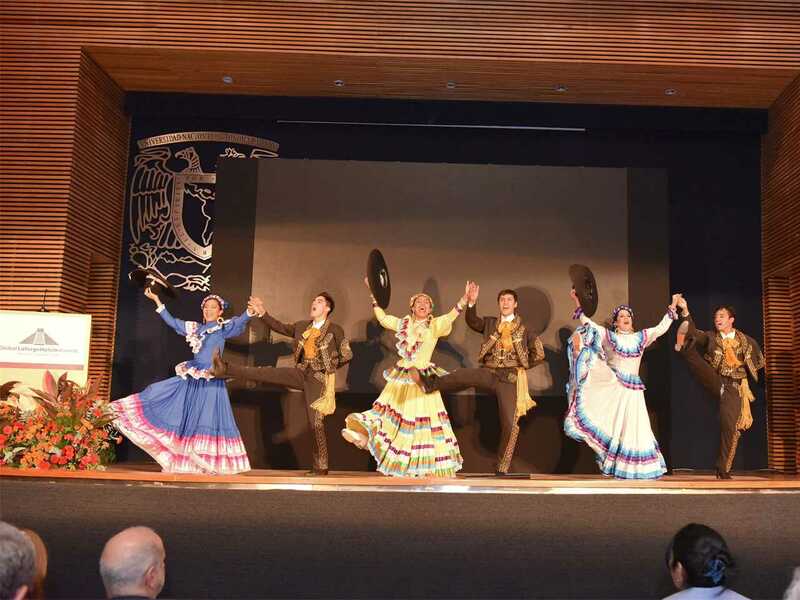 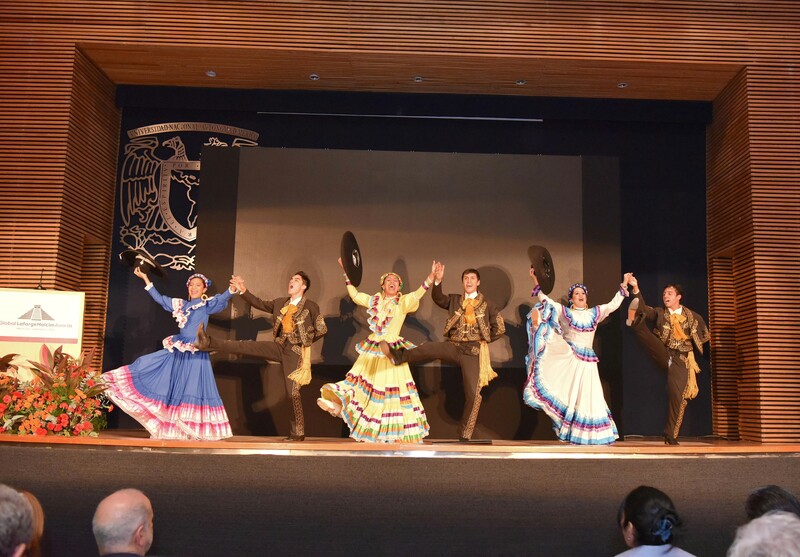 The project team is led by design director Loreta Castro Reguera at Taller Capital, and researcher Manuel Perló Cohen from the Universidad Nacional Autónoma de México. 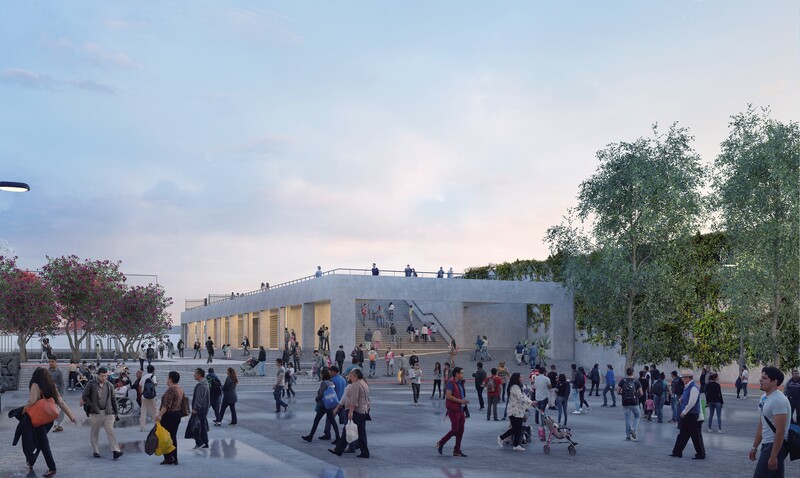 The infrastructure project in an underprivileged area of Mexico City intermingles flood basins and public amenities with spaces that follow the gravitational logic of flowing water. The jury stated that the sophisticated design addresses an urgent issue at a scale with real impact. 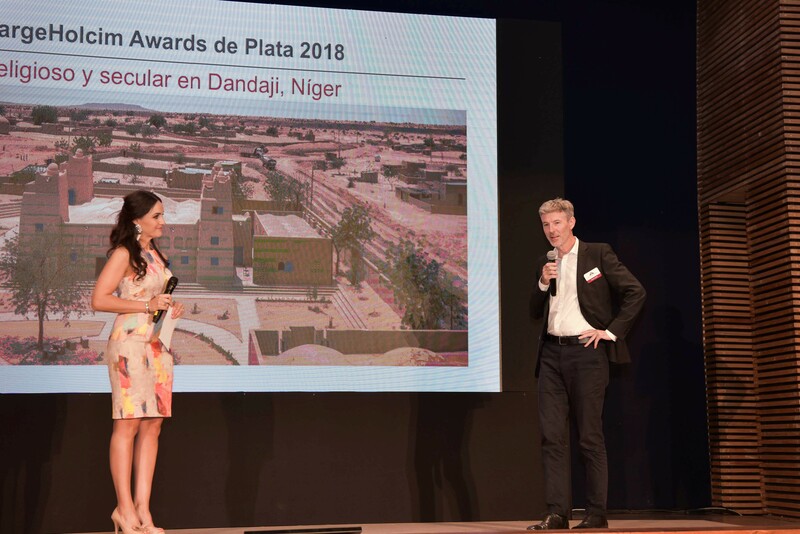 “Legacy Restored”, the Awards Silver winner, is a religious and secular complex in Niger that reinterprets traditional local construction for a new mosque and a community center. 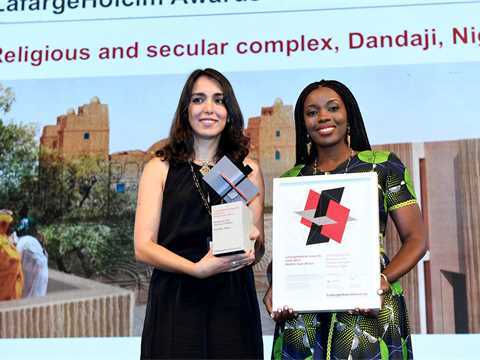 The project was designed by architects Mariam Kamara, atelier masomi, Niger; and Yasaman Esmaili, studio chahar, Iran. 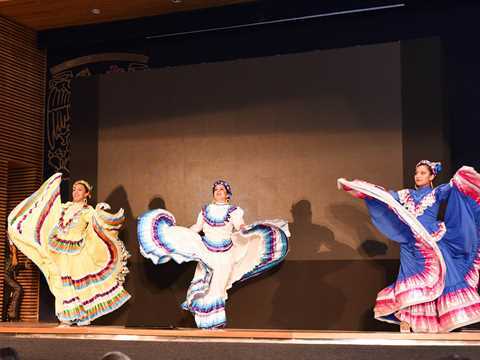 It creates a civic space open to all in the village of Dandaji, supporting the education of women and strengthening their presence within the community. The design strategy champions local artisanship, traditional building techniques and materials produced on site. 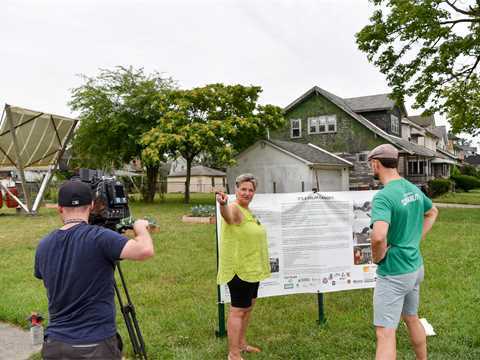 The community-driven neighborhood planning project “Grassroots Microgrid” wins Awards Bronze for re-imagining empty lots as collective infrastructure for energy and food production as well as for civic engagement in Detroit, USA. 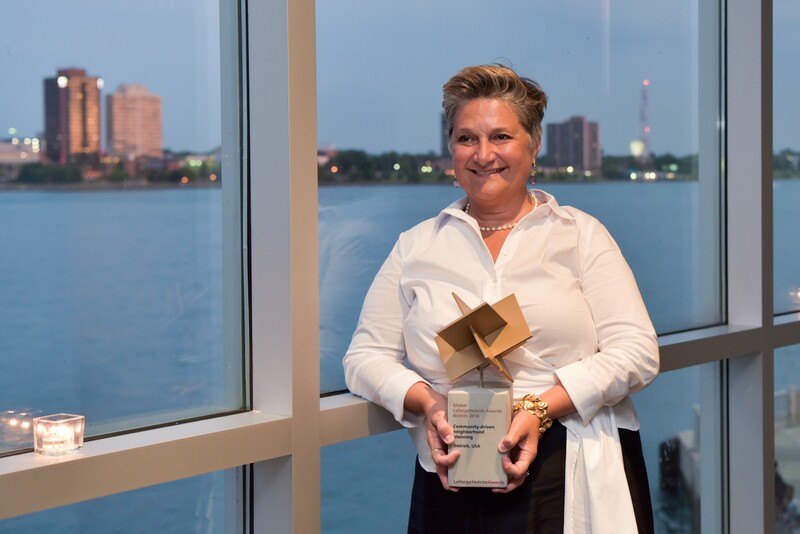 The large team of authors is led by Constance C. Bodurow, founding Director of studio[Ci], a transdisciplinary design collaborative in Detroit. 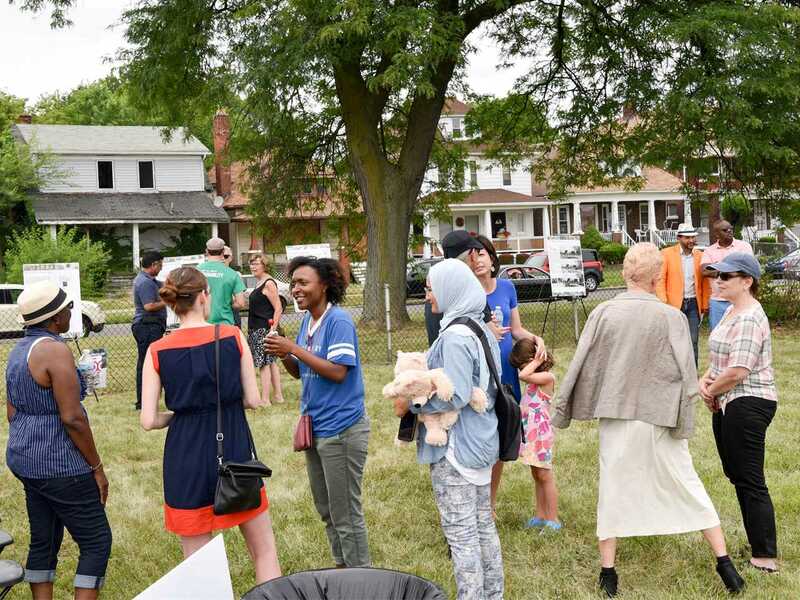 The project enables neighborhoods to reach energy autonomy through micro-infrastructure, leverages vacancy as an asset, and creates a new economic paradigm for community renewal. 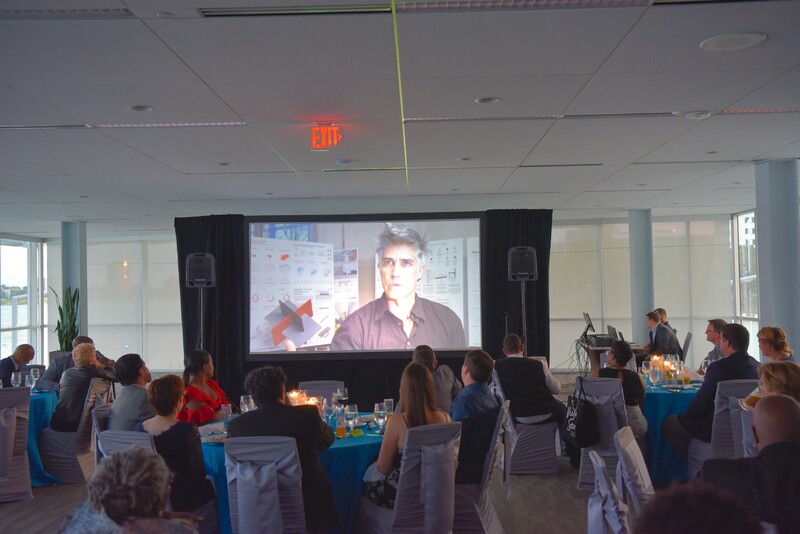 Jury head Alejandro Aravena commented that the global Gold and Silver winning projects act as role models: “They are masterful pieces that demonstrate what sustainable design and construction can achieve. 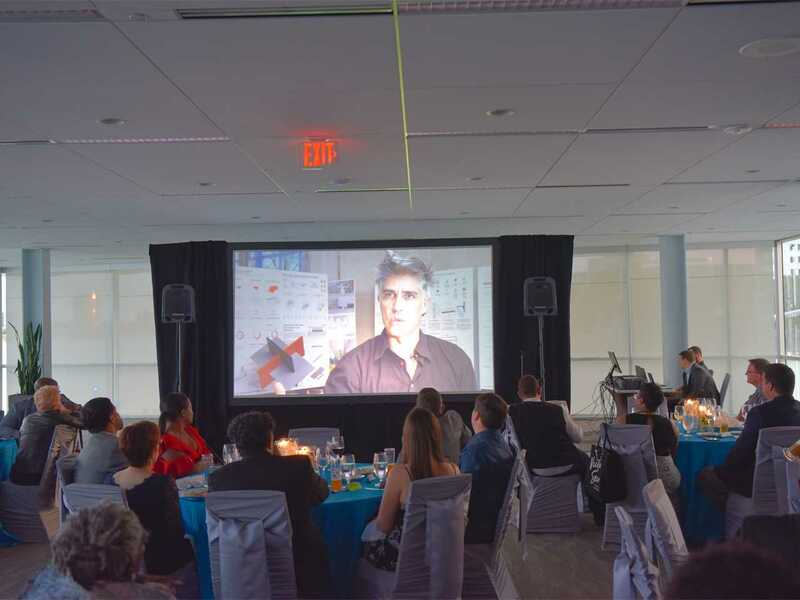 As a community-driven initiative, the Bronze winner opens a path, innovating an approach that will need to be developed further,” said Aravena. 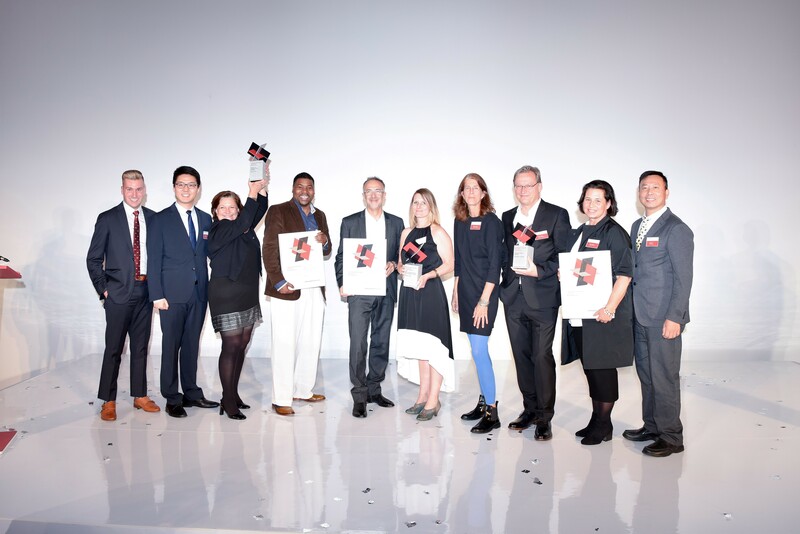 The global Awards winning teams are diverse in every sense of the word. 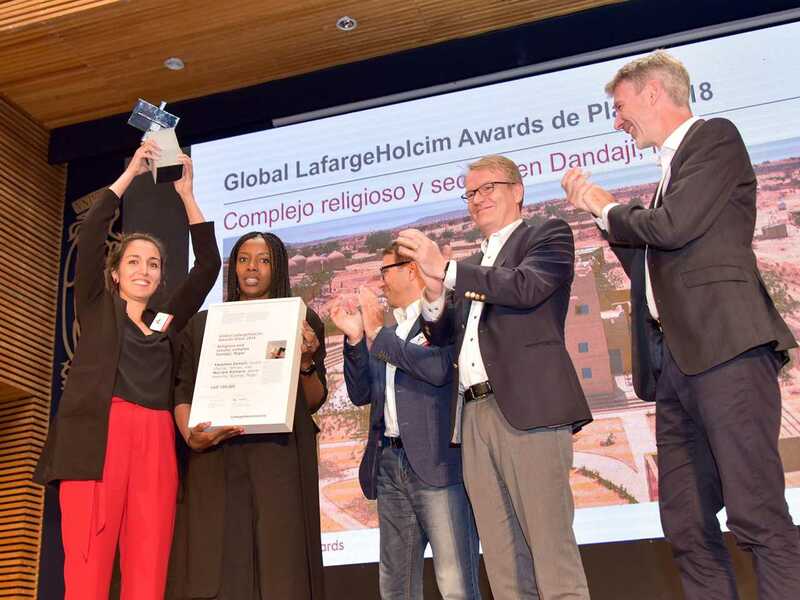 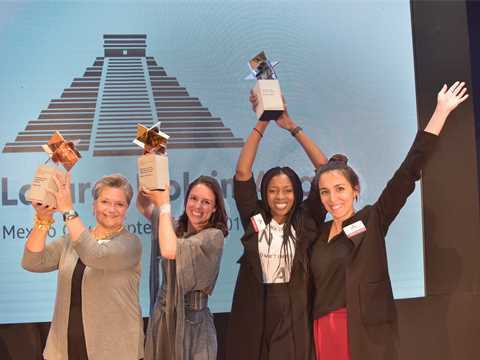 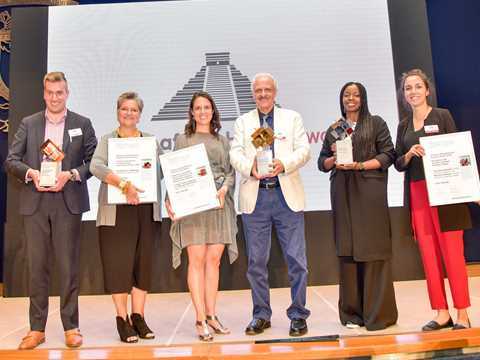 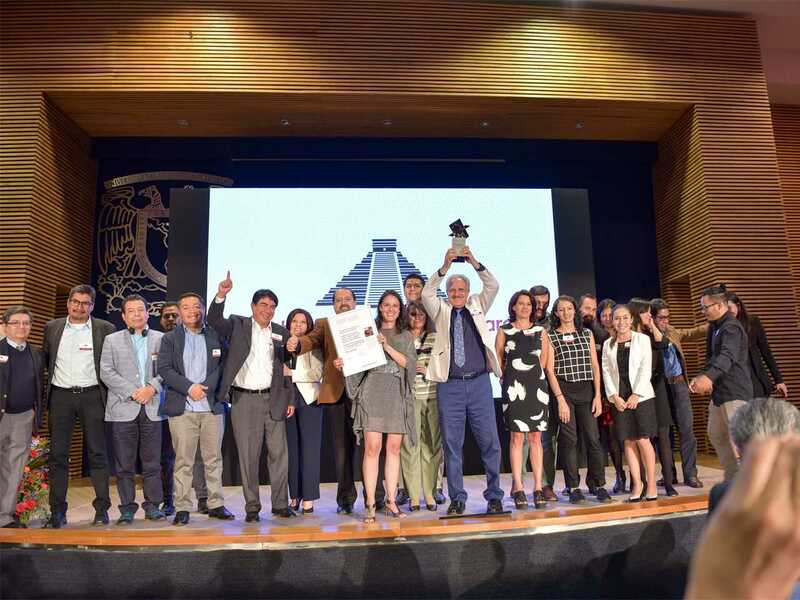 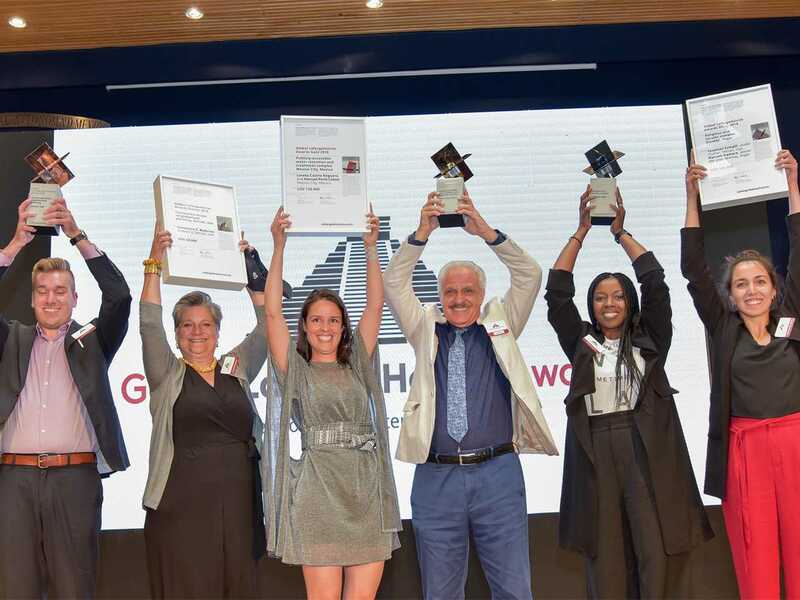 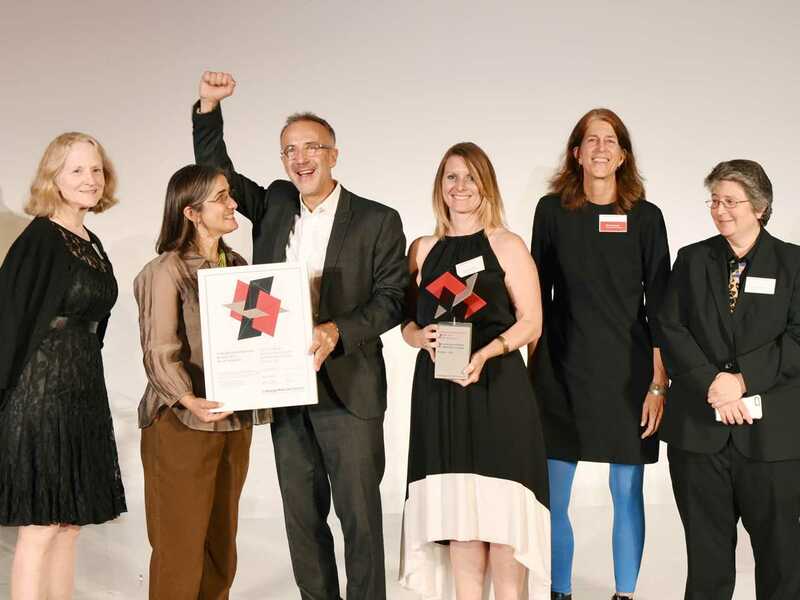 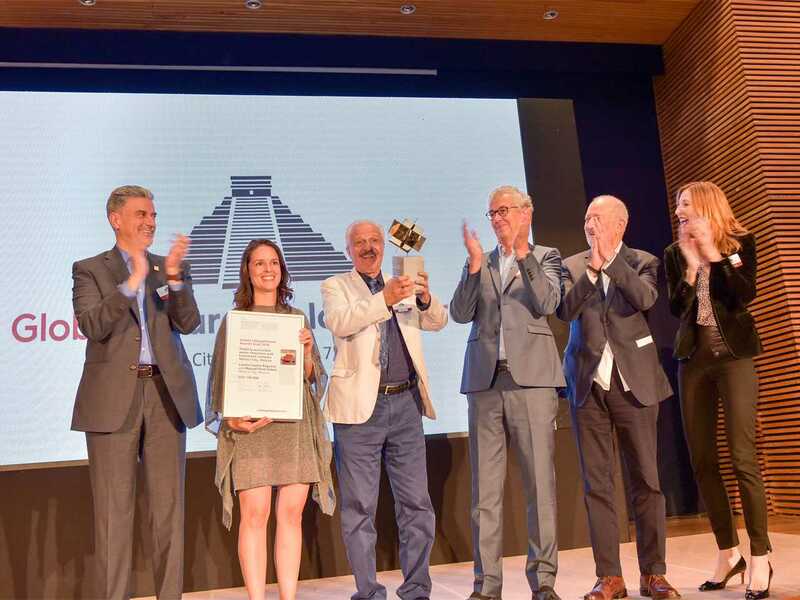 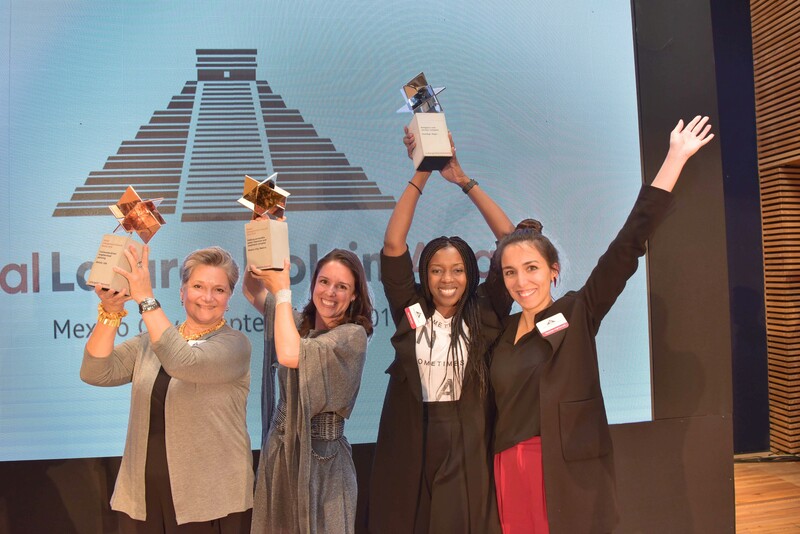 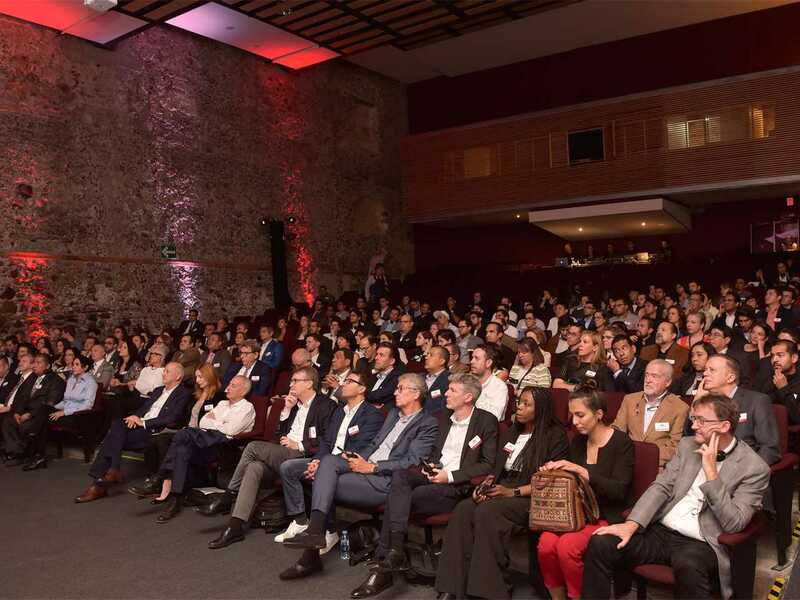 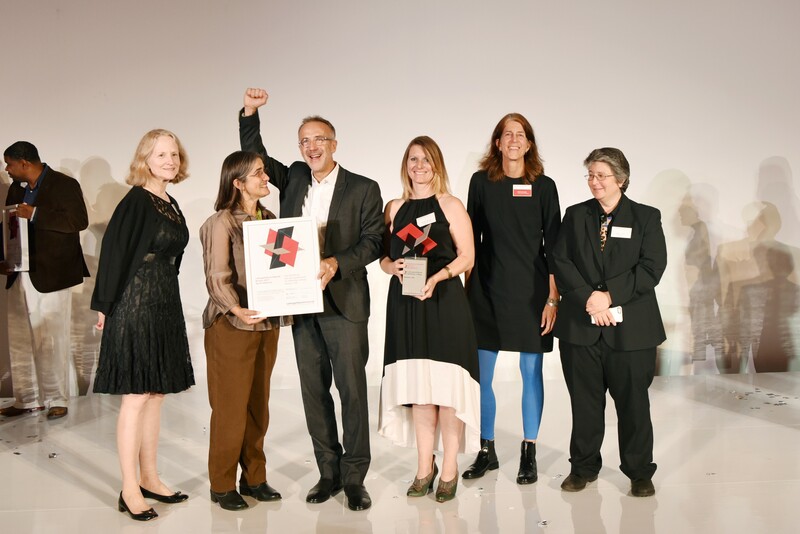 “Although not something considered during the evaluation process, the jury was delighted by the strong representation and success of women in the LafargeHolcim Awards,” said Aravena. Traditionally, the Awards competition enjoys a strong level of both participation and success in the competition by female professionals and students. 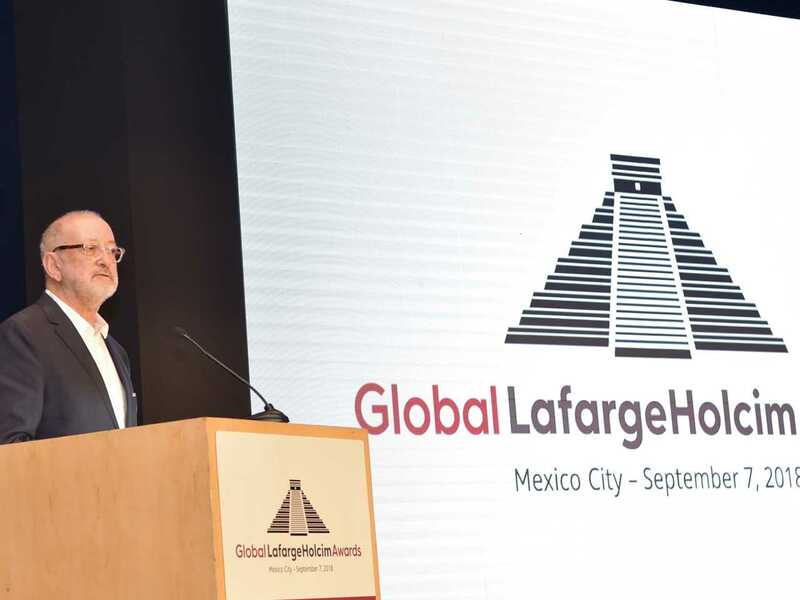 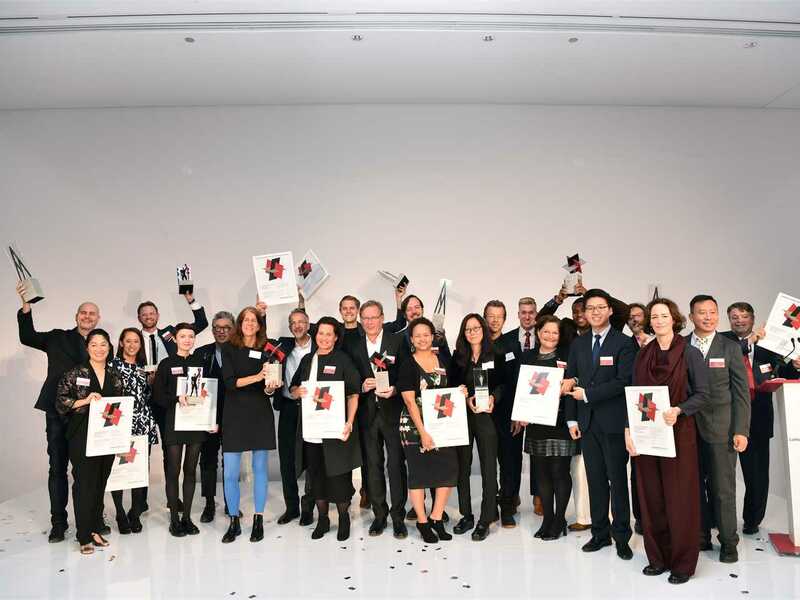 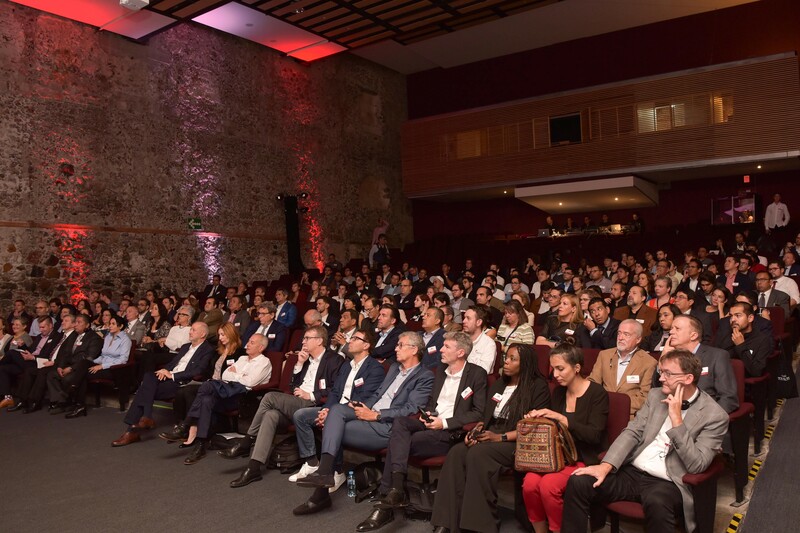 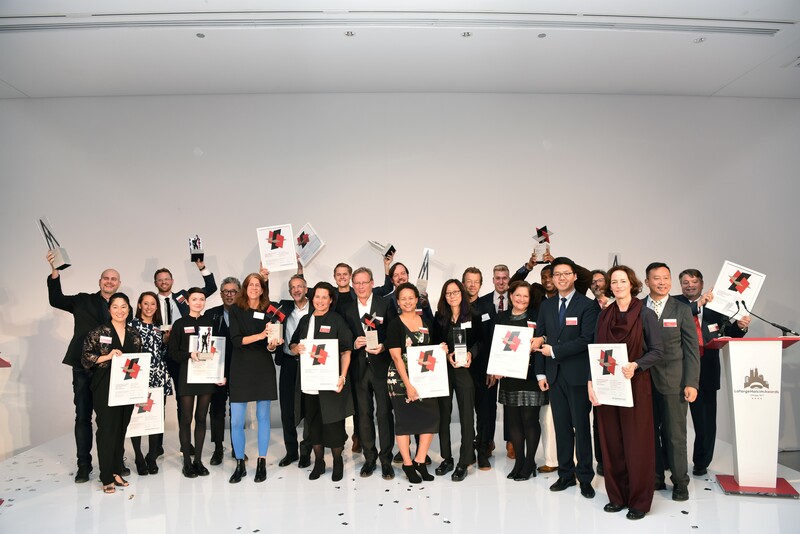 For the first time, the global Awards jury selected three of the 40 Acknowledgement and Next Generation prize-winning projects from the regional phase of the competition to receive LafargeHolcim Awards Ideas prizes. 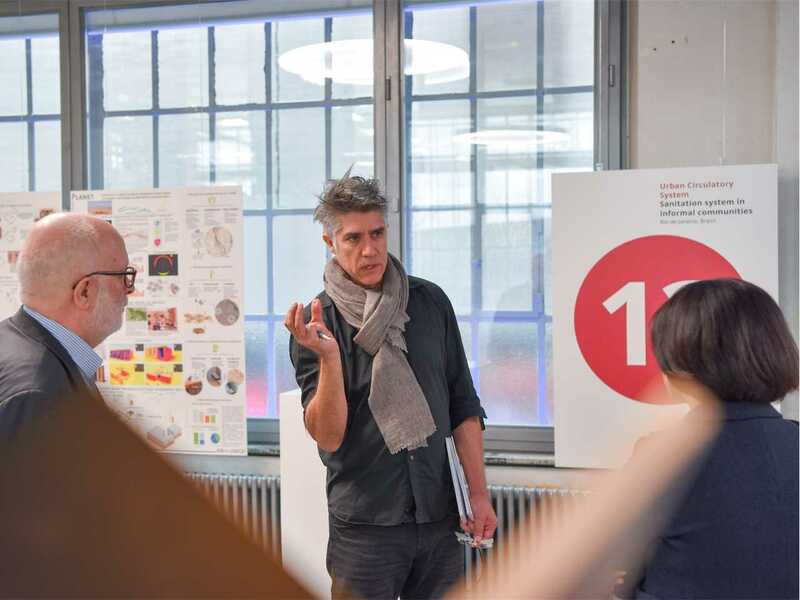 “We felt that they offer exciting and novel ideas, even within proposals that are not yet fully developed,” said jury head Alejandro Aravena. 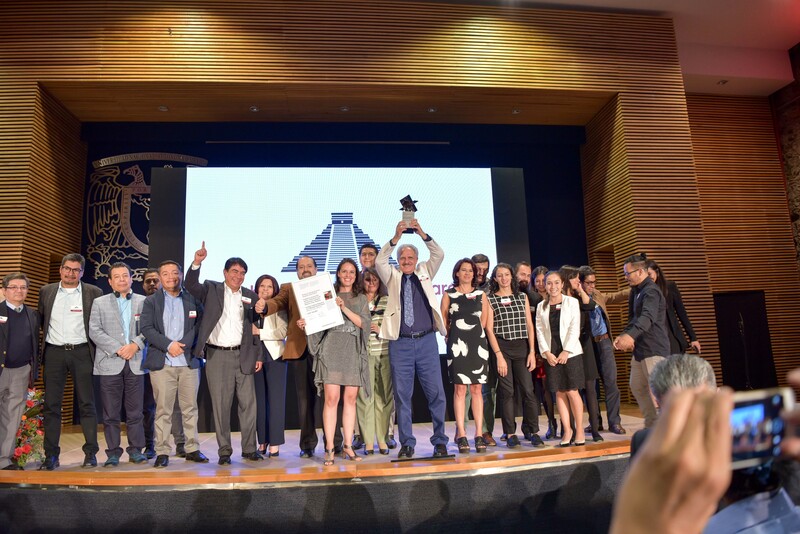 The prizes go ex aequo to “Refrigerating Jar” in Ghana, “Cooling Roof” in California, USA, and “Territorial Figure” in Argentina. 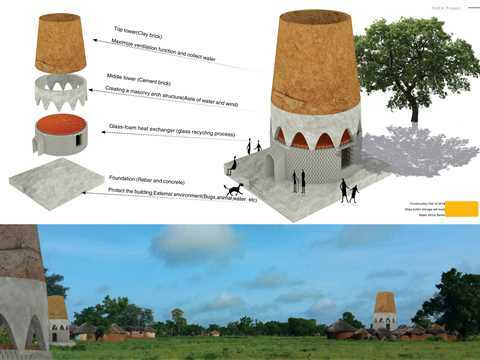 Architects Wonjoon Han and Gahee Van of VHAN together with Sookhee Yuk from Make Africa Better led a South Korean team designing shea butter storage towers in Nyingali, Ghana; they enable passive cooling that enhances the economic viability of agriculture and an aesthetic that alludes to traditional local architecture. 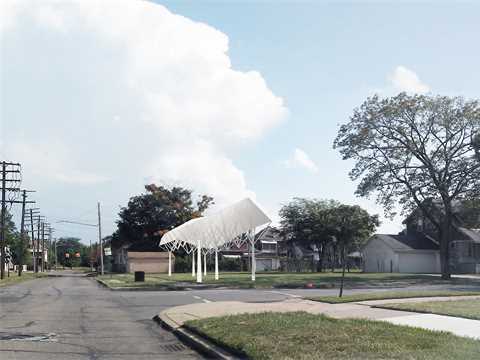 Georgina Baronian, student at Princeton University in the USA, developed a prototype of a large-scale structure using water on the roof as a thermal insulator and solar reflector in one. 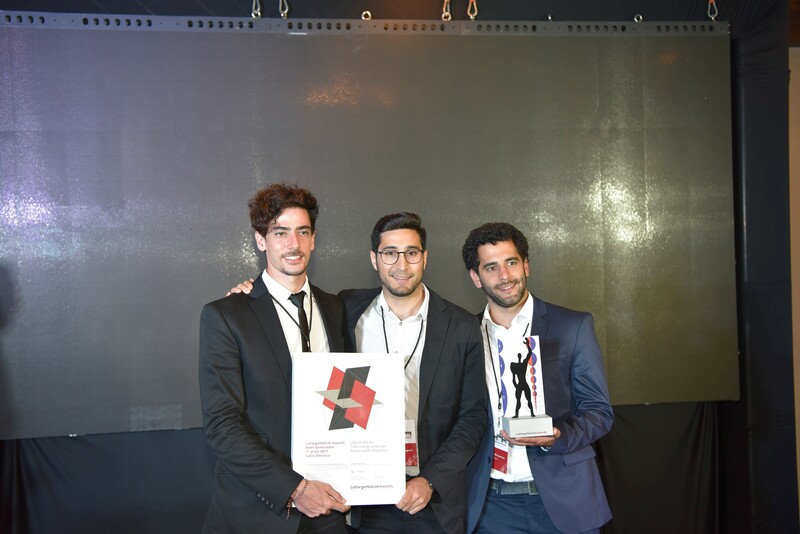 The infrastructure-landscape project for the generation of electric power based on tidal currents at Punta Loyola in Argentina was developed by three students from the Universidad Nacional de Córdoba in Argentina: Stefano Romagnoli, Juan Cruz Serafini, and Tomás Pont Apóstolo. 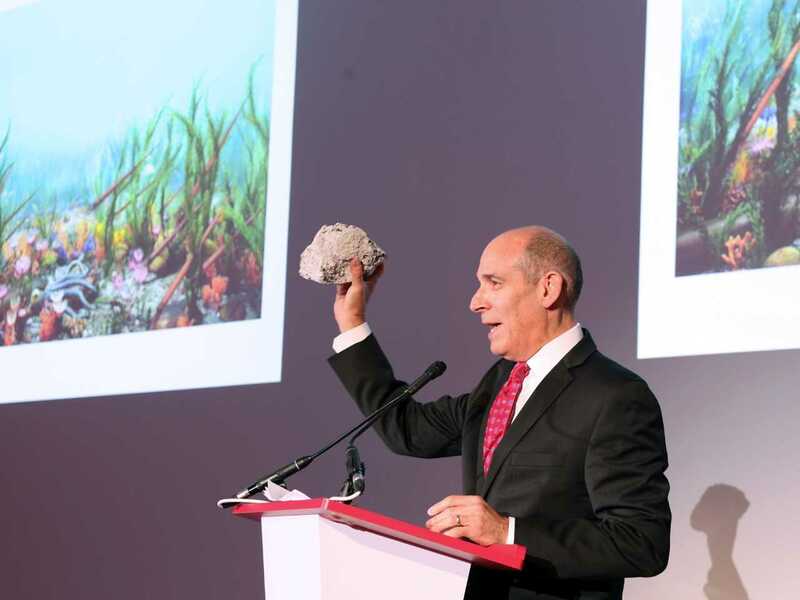 The 5th International LafargeHolcim Awards competition attracted 5,085 projects and visions to be implemented in 131 countries. 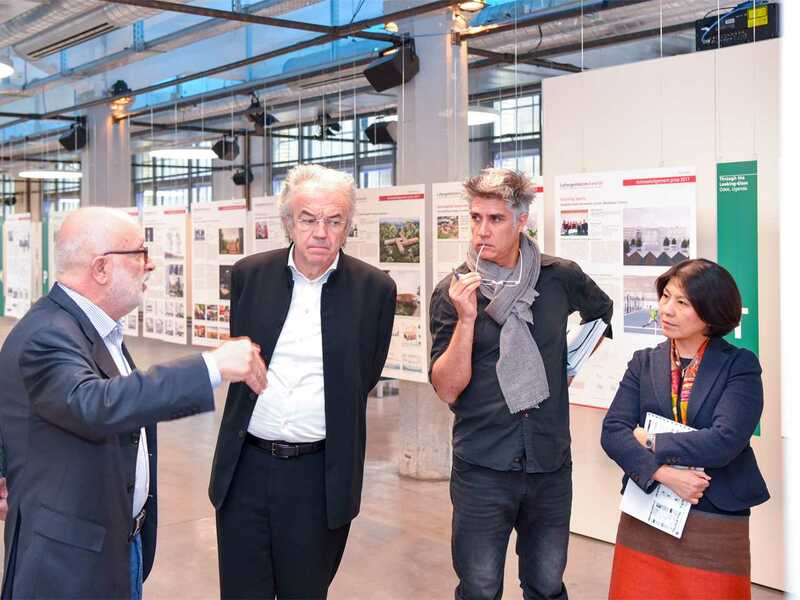 1,836 projects passed the formal and quality checks and were assessed by independent juries in five competition regions: Europe, North America, Latin America, Middle East Africa and Asia Pacific. 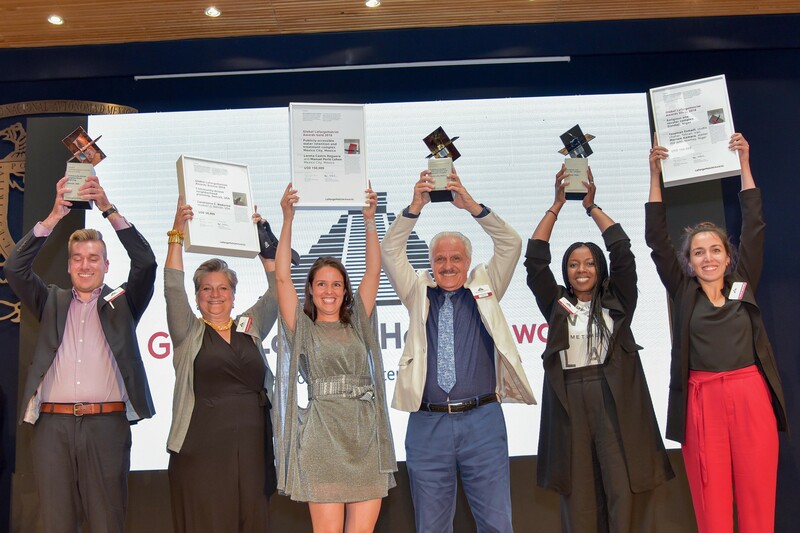 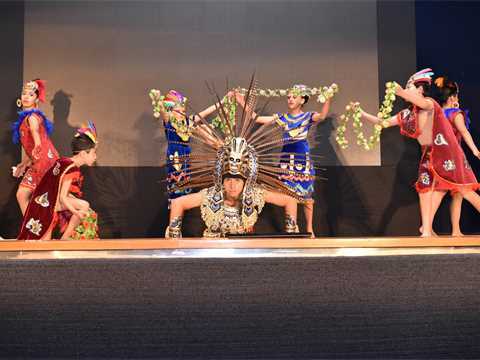 11 prizes carrying a total of USD 330,000 per region were handed-over to winning teams in 2017. 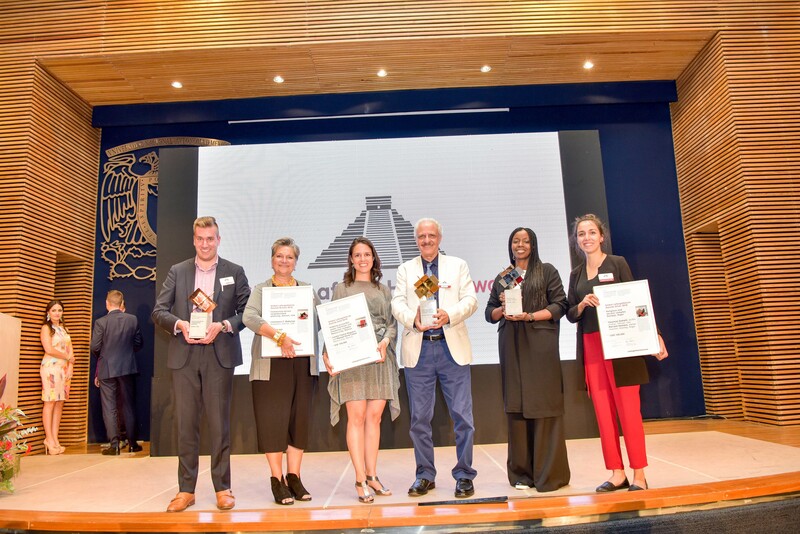 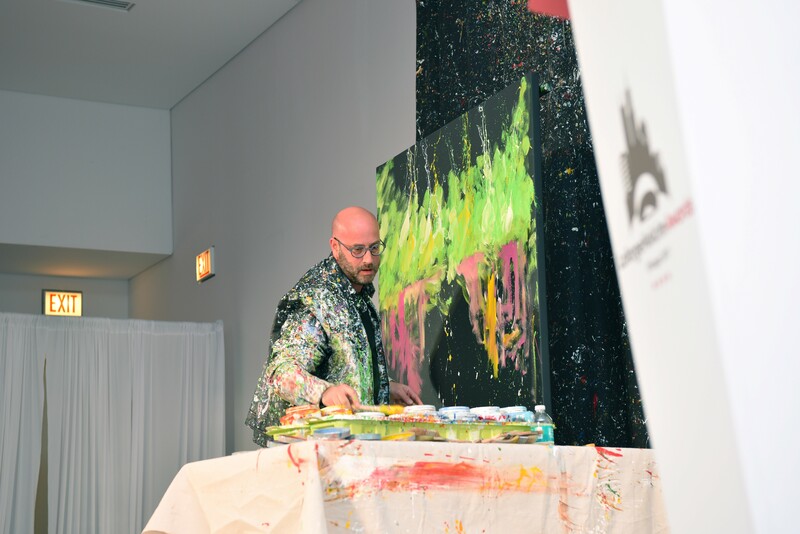 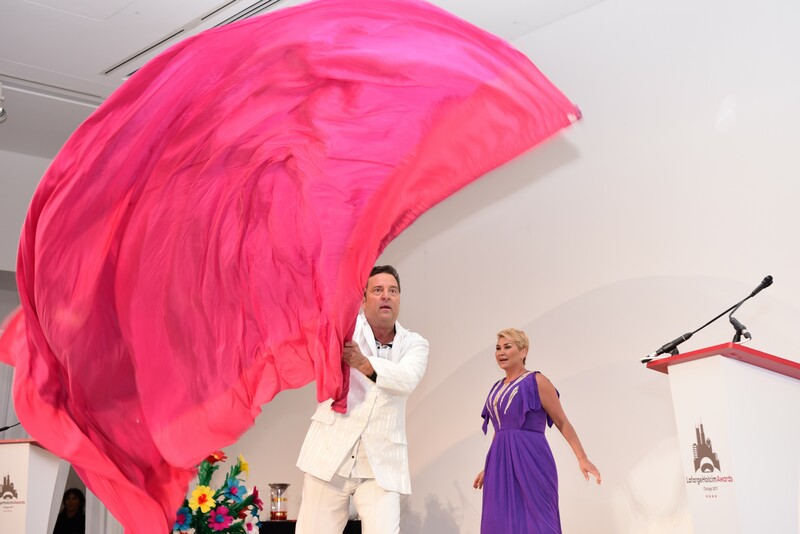 The three main winners per region automatically qualified for the global Awards; and the 40 Acknowledgement and Next Generation prize-winners were eligible for the Awards Ideas prizes 2018. 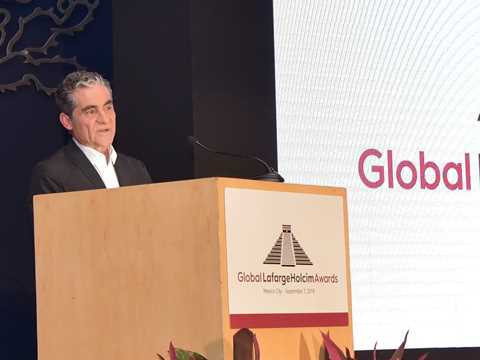 The prize pool for the global phase of the Awards totals USD 350,000. 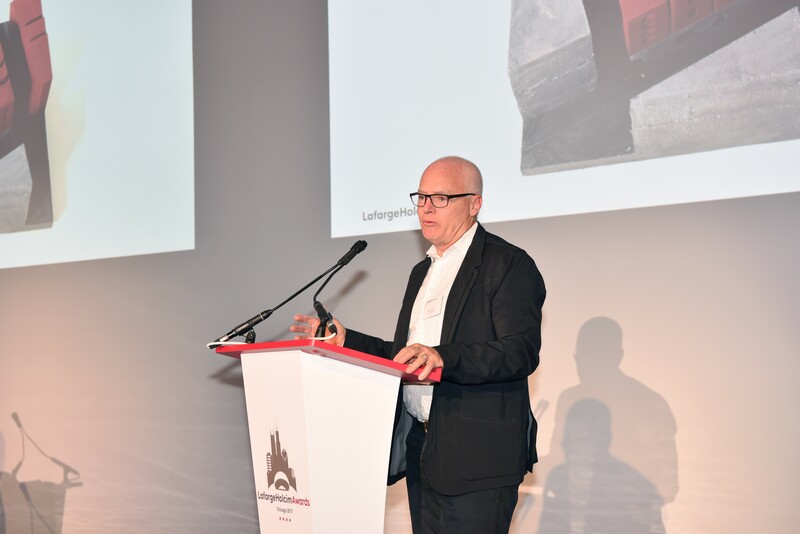 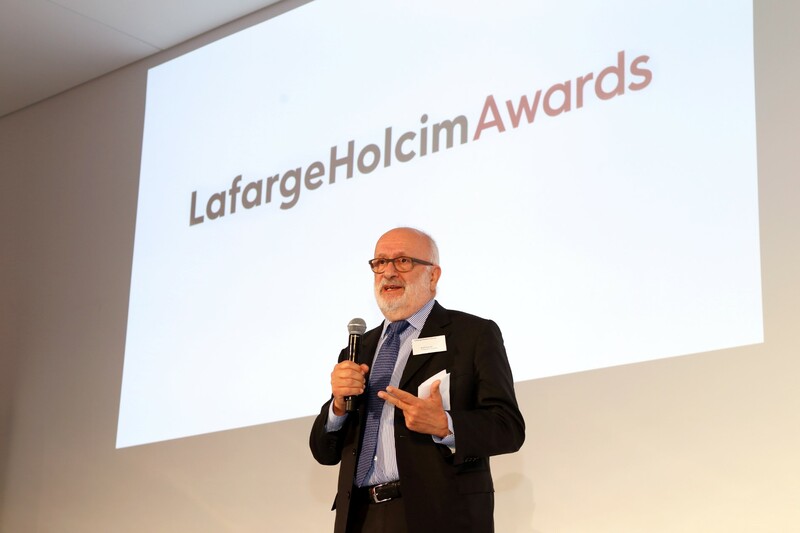 The International LafargeHolcim Awards cycle spans three years, the 6th competition will open for entries in mid-2019. 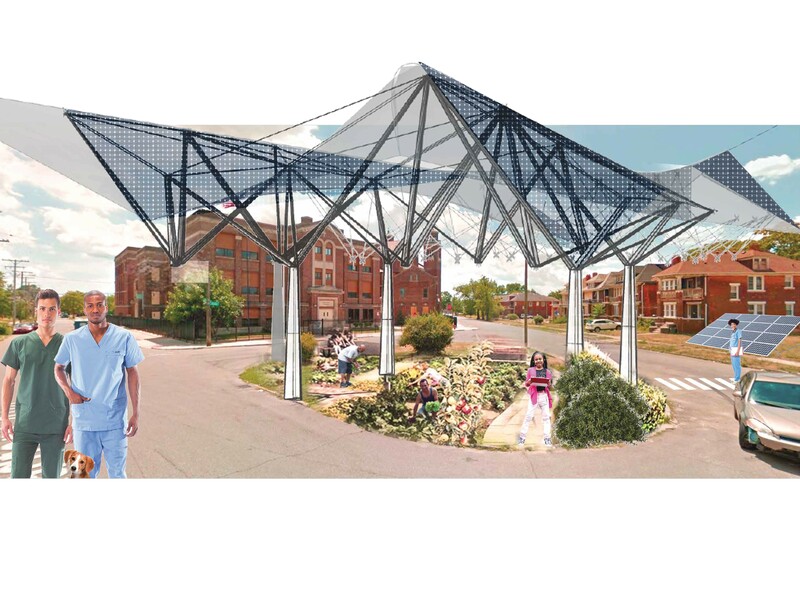 Hydropuncture – Publicly accessible water retention and treatment complex, Mexico City, Mexico. Project intermingling flood basins and public amenities in an underprivileged area, with spaces arranged to follow the gravitational flow of water. 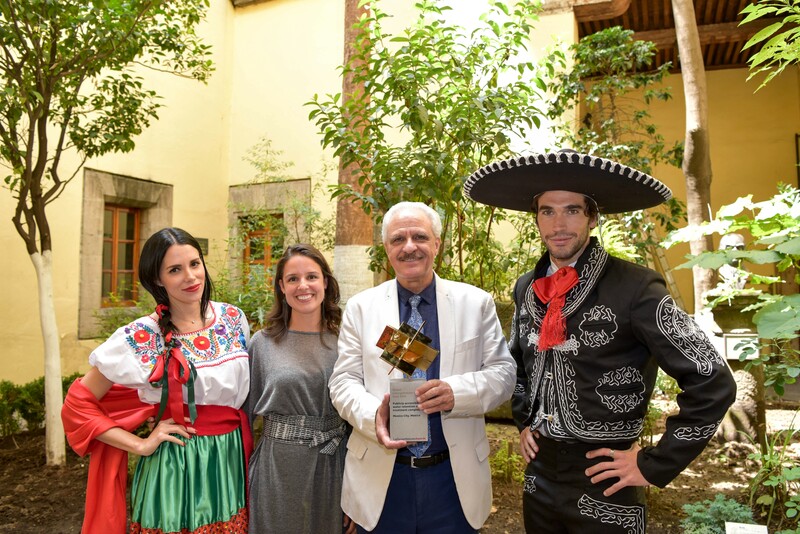 By Loreta Castro Reguera, Taller Capital; and Manuel Perló Cohen, Universidad Nacional Autónoma de México, Mexico City, Mexico. 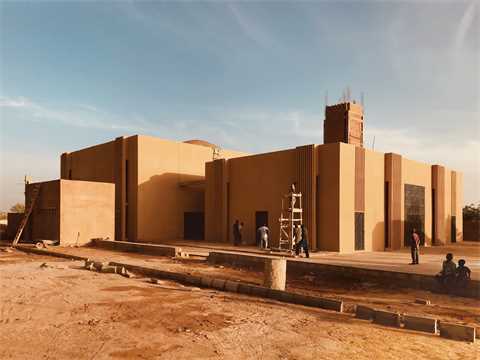 Legacy Restored – Religious and secular complex, Dandaji, Niger. A re-interpretation of traditional local construction for a new mosque and community center, creating a space in the village open to all. 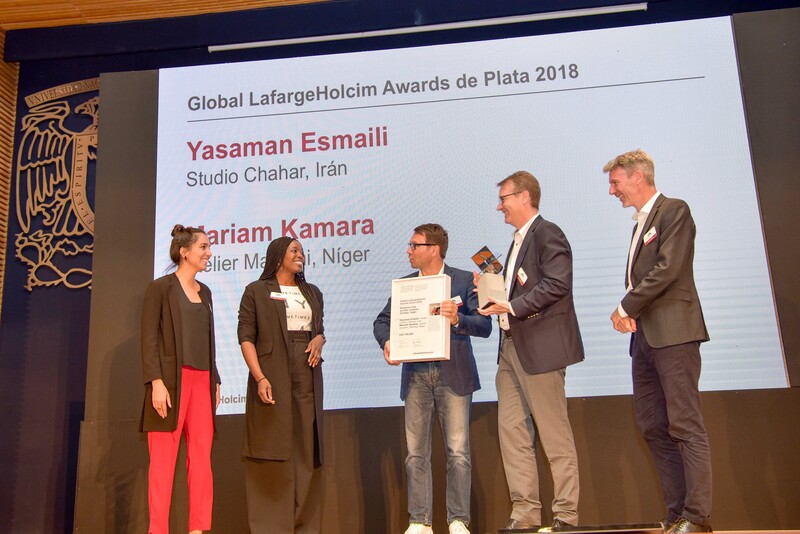 By Mariam Kamara, atelier masomi, Niamey, Niger; and Yasaman Esmaili, studio chahar, Tehran, Iran. Grassroots Microgrid – Communtiy-driven neighborhood planning, Detroit, USA. 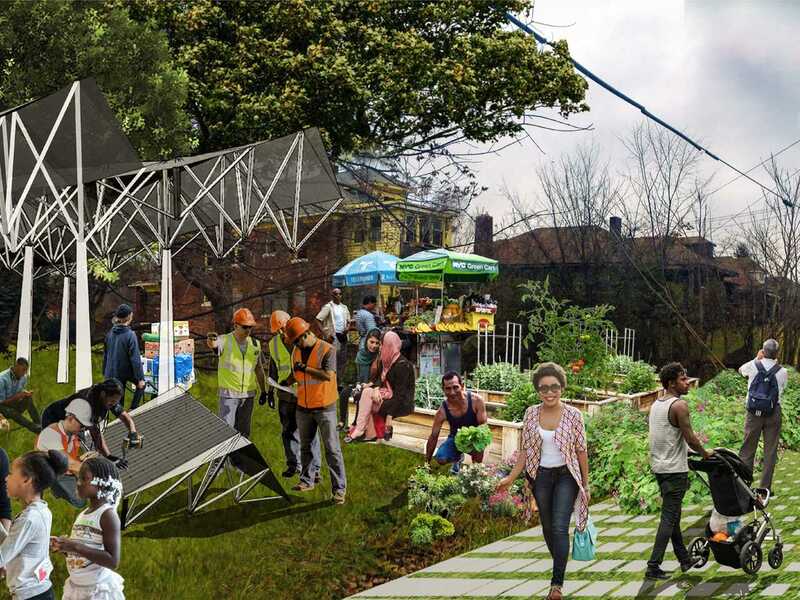 This neighborhood-scale project re-imagines empty lots as collective infrastructure for energy and food production as well as for civic engagement. By Constance C. Bodurow, director and Eric Mahoney, designer, studio[Ci], Detroit, USA, and a team of further authors. 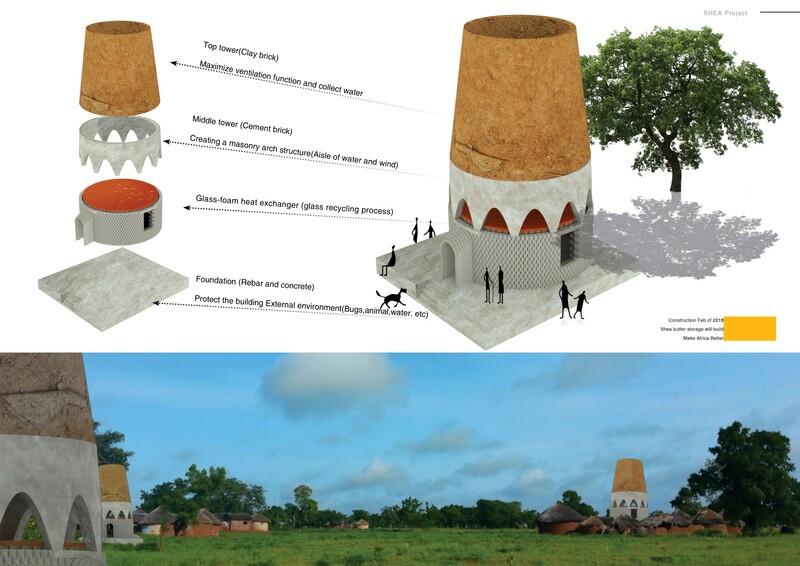 Refrigerating Jar – Shea butter storage for Nyingali community, Karaga District, Ghana. 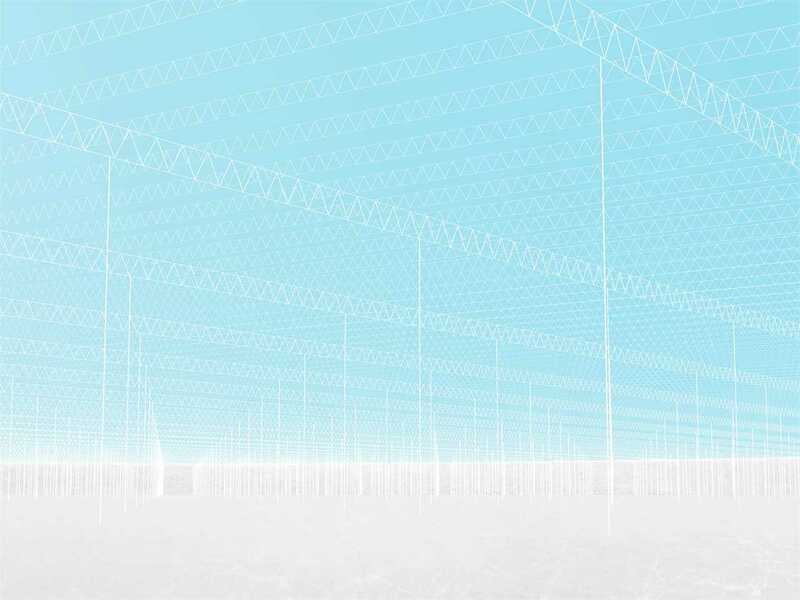 The striking towers of the storage units are designed for passive cooling and allude to traditional local architecture. 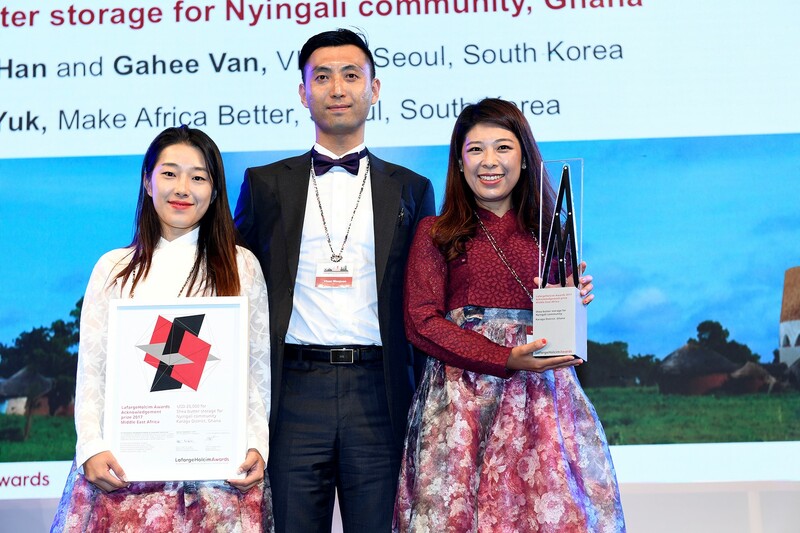 By Wonjoon Han, Gahee Van, VHAN; and Sookhee Yuk, Make Africa Better, Seoul, South Korea. Cooling Roof – Prototype for an evaporative roof for radiant cooling, Cherry Valley, CA, USA. 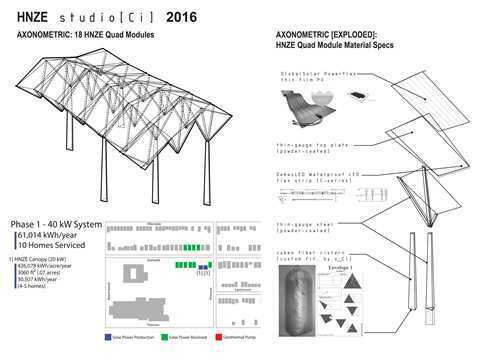 Research investigation on cooling large-scale structures using water on the roof as a thermal insulator and solar reflector. 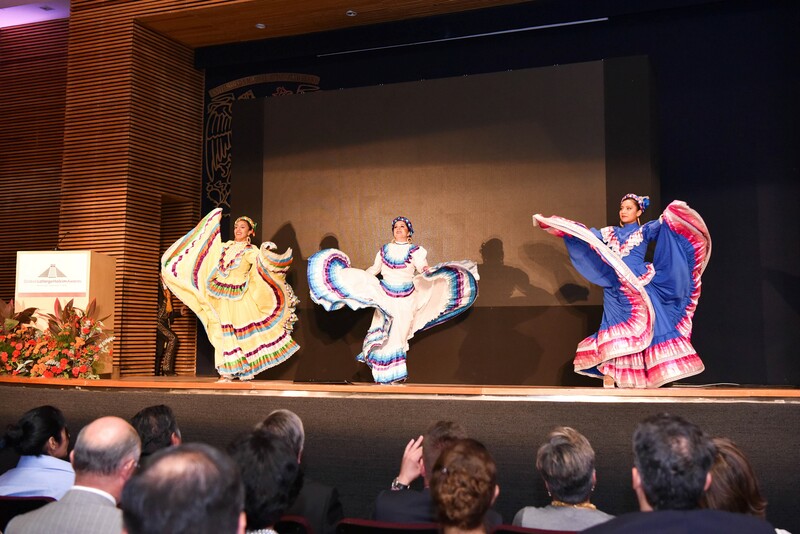 By Georgina Baronian, Princeton University, Princeton, NJ, USA. 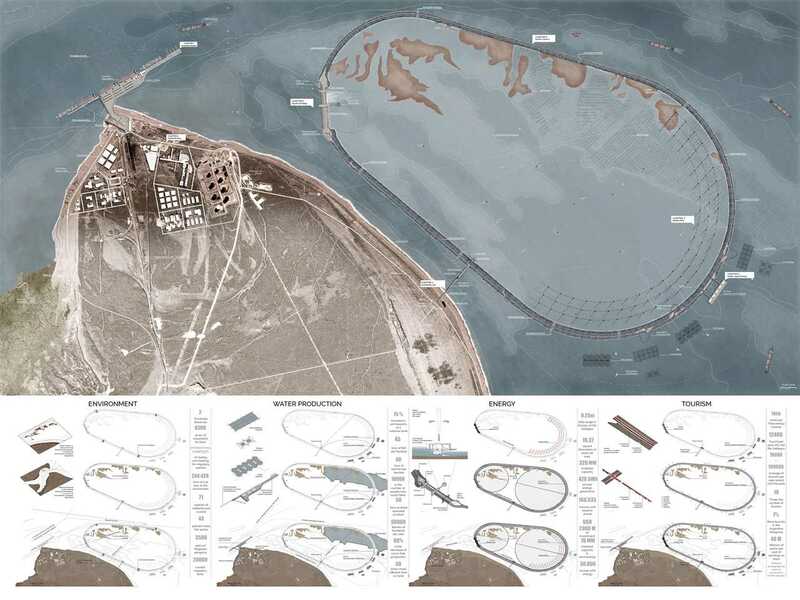 Territorial Figure – Tidal energy landscape, Punta Loyola, Argentina. 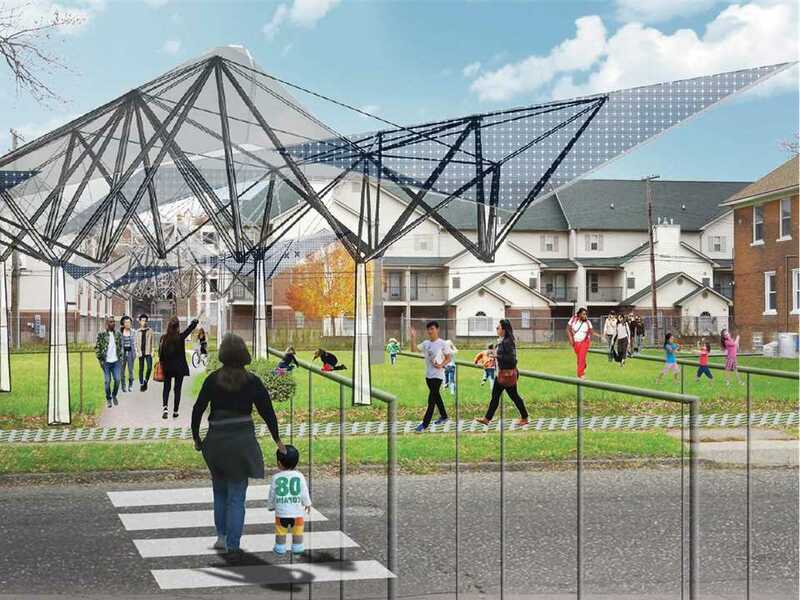 Infrastructure-landscape project for the generation of electric power based on tidal flow in the Río Gallegos estuary. By Stefano Romagnoli, Juan Cruz Serafini, and Tomás Pont Apóstolo, Universidad Nacional de Córdoba, Córdoba, Argentina. 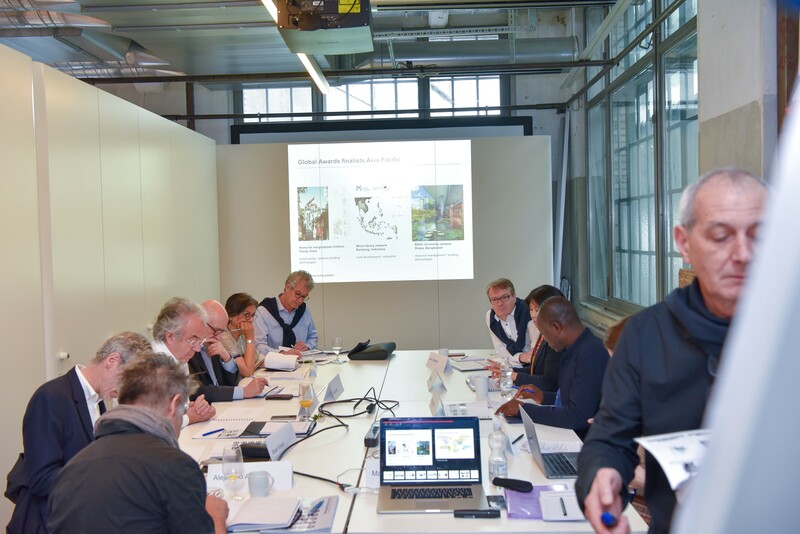 The jury is excited by the idea of a neighborhood reaching energy autonomy through micro-infrastructure. The buildup of this apparatus for energy production is seen as novel type of community generator, particularly in an area failed by inadequate yet costly municipal services. 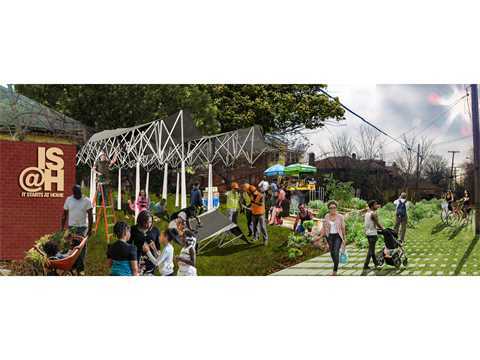 The negotiation needed to develop such a project and turn it into reality builds not just physical infrastructure but also sparks the conversations and common aims that produce community. 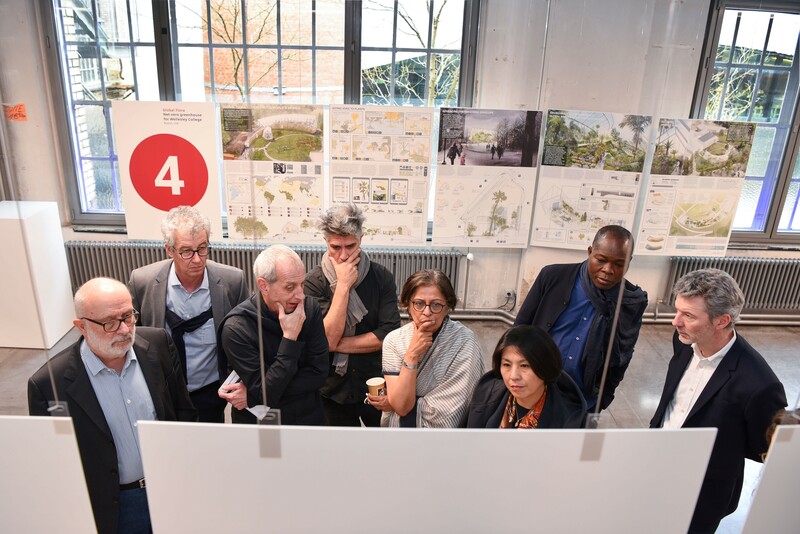 The jury members see the initiative as a highly transferrable project model that is both timely and provocative, potentially addressing the needs of developing communities and developed areas where infrastructure is beginning to fail. 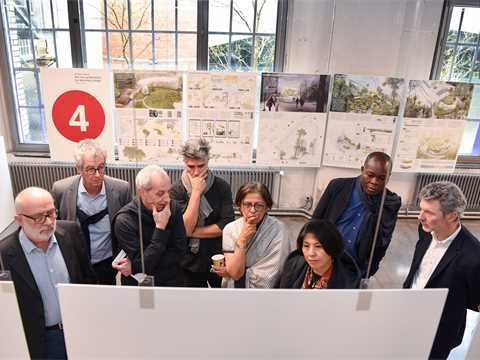 The jury nonetheless criticized the shape of the roof, which seems to complicate the construction, while not conforming to optimal solar orientation nor efficient water collection. 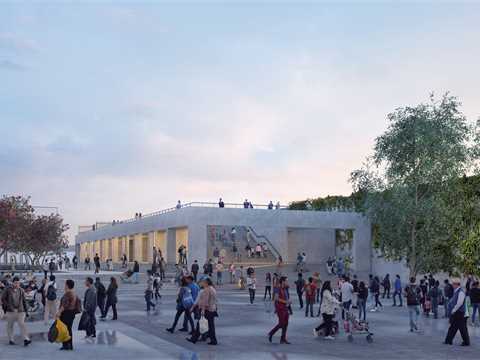 A more straightforward and less formal solution would have been more appropriate. 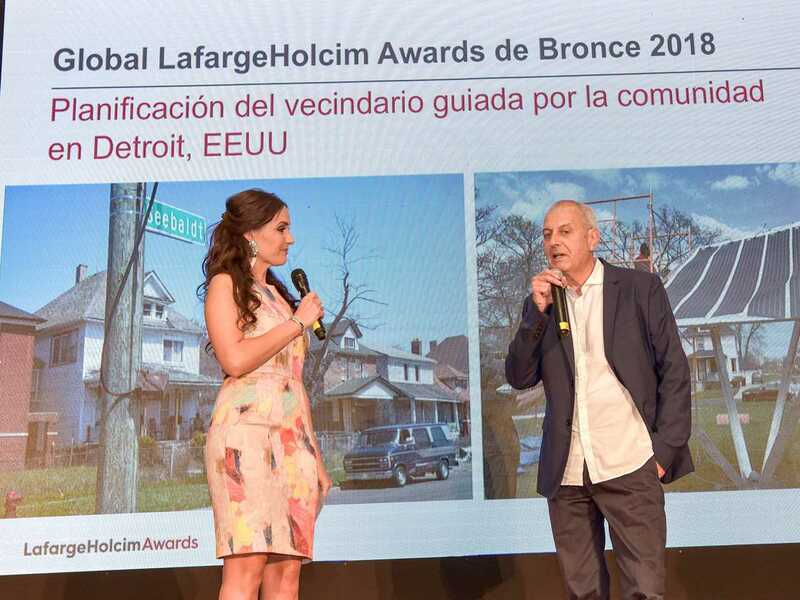 As one of the three main LafargeHolcim Awards winners for North America in 2017, “Grassroots Microgrid” automatically qualified as a finalist in the Global LafargeHolcim Awards 2018. 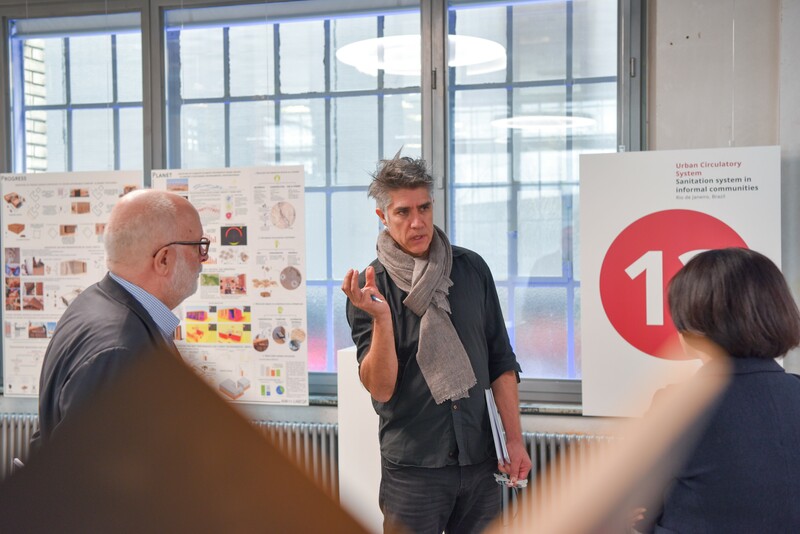 All 15 finalist project teams were asked to submit an updated and more comprehensive entry that was evaluated by a global jury in March 2018. 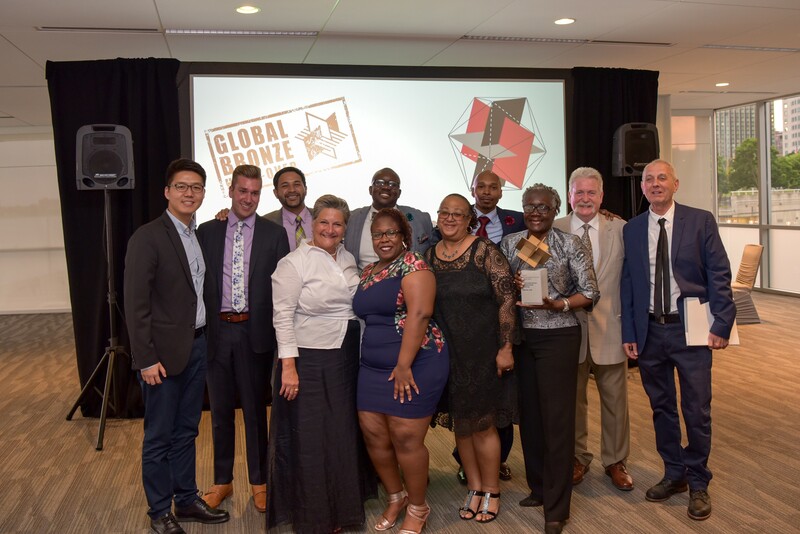 After the LafargeHolcim Awards prize handover ceremony for North America in Chicago, celebrations for the Gold winners continued at a dinner for the Board of Directors of It Starts at Home (IS@H) including (l-r): Latosha Melvin Bright (Board Lead, Fiscal Sponsorship), Will Bright (Board Treasurer), Rico Razo (Office of the Mayor of Detroit, Campaign Manager), Constance Bodurow (Board Lead, Design), Darrel West (Board President), and David Cross (Board Secretary). 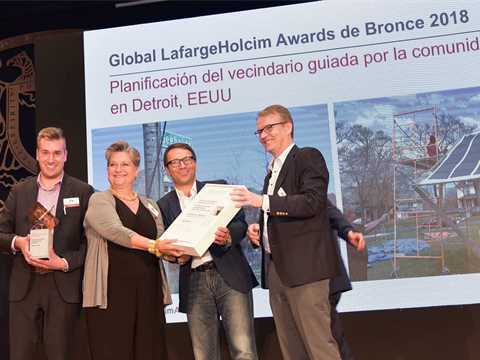 Winning the top prize for North America in the LafargeHolcim Awards has given the project team a huge boost. 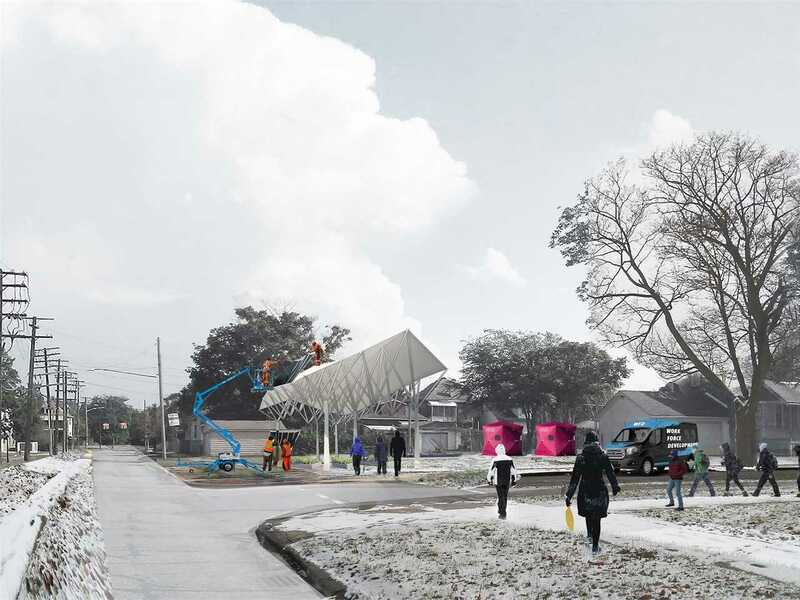 The Seebaldt Pilot project by studio[Ci], It Starts at Home (IS@H) and partners across Detroit aims to incubate long-term community engagement through interventions for local energy and food production, water and waste management, and community empowerment. 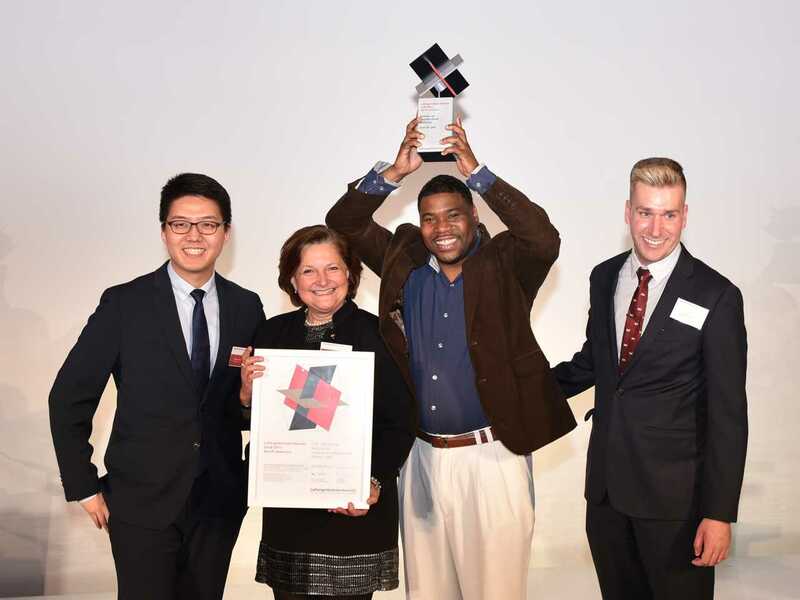 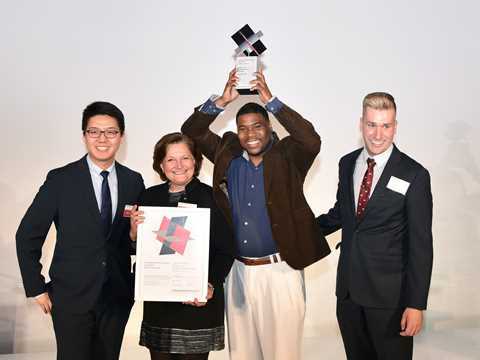 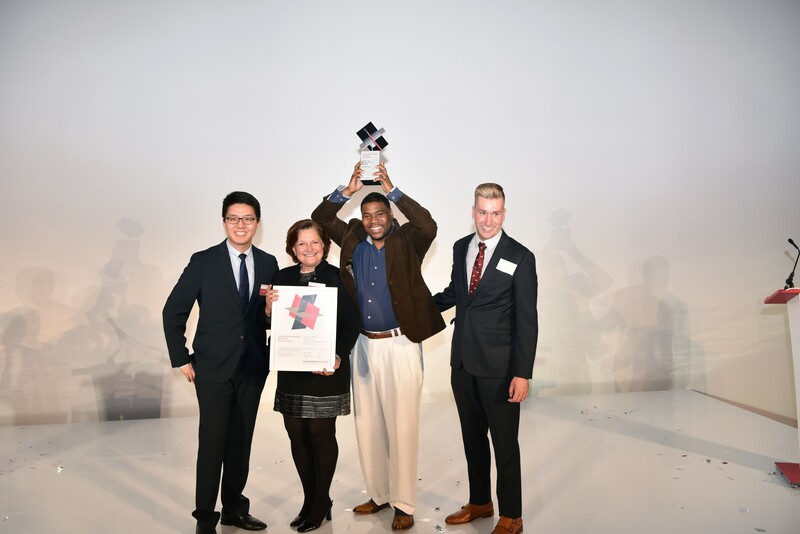 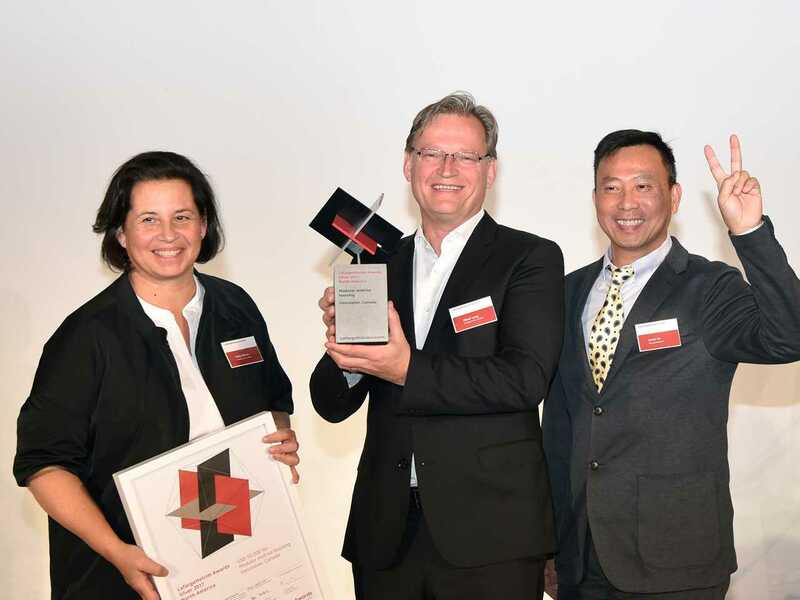 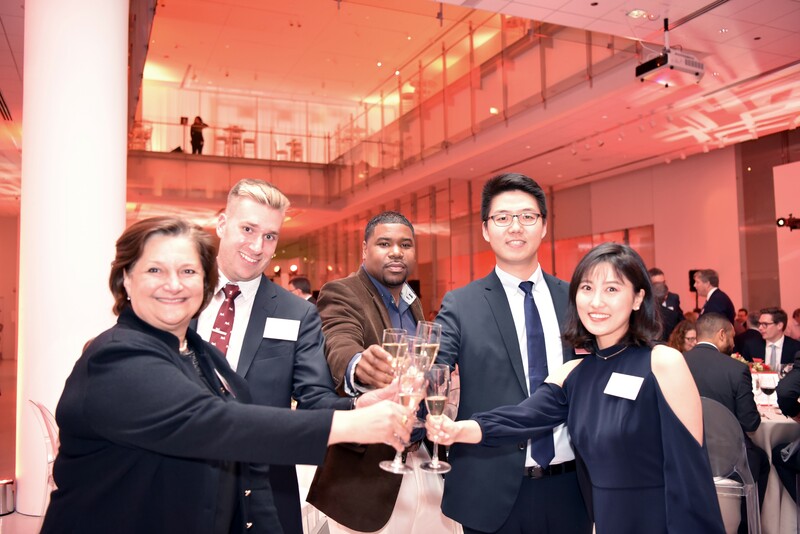 After the LafargeHolcim Awards ceremony in Chicago, team representatives Constance Bodurow, Will Bright, Haibin Tan and Eric Mahoney returned with trophy in hand and winning grins on their faces. 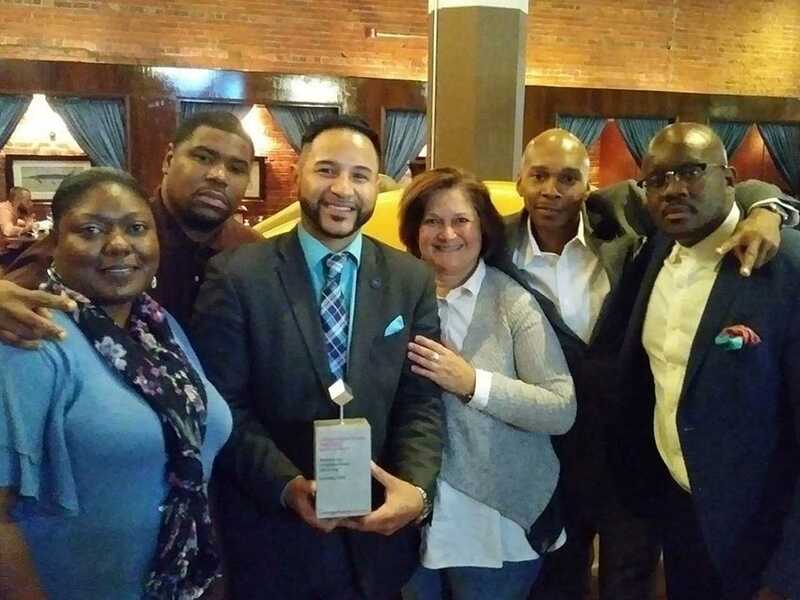 Celebrations continued at a dinner for the Board of Directors of It Starts at Home (IS@H) including (l-r): Latosha Melvin Bright (Board Lead, Fiscal Sponsorship), Will Bright (Board Treasurer), Rico Razo (Office of the Mayor of Detroit, Campaign Manager), Constance Bodurow (Board Lead, Design), Darrel West (Board President), and David Cross (Board Secretary). A community celebration is also in planning. 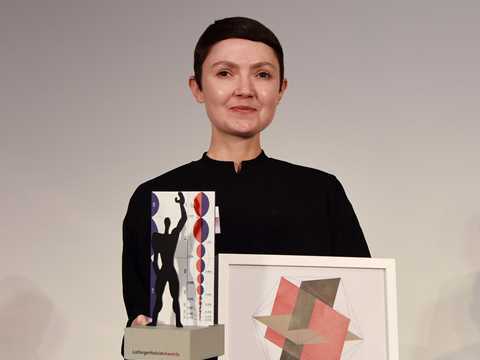 Main Author Constance Bodurow of studio[Ci] in Detroit explained that the prize was not only an important professional recognition, but also brought an enormous injection of enthusiasm. 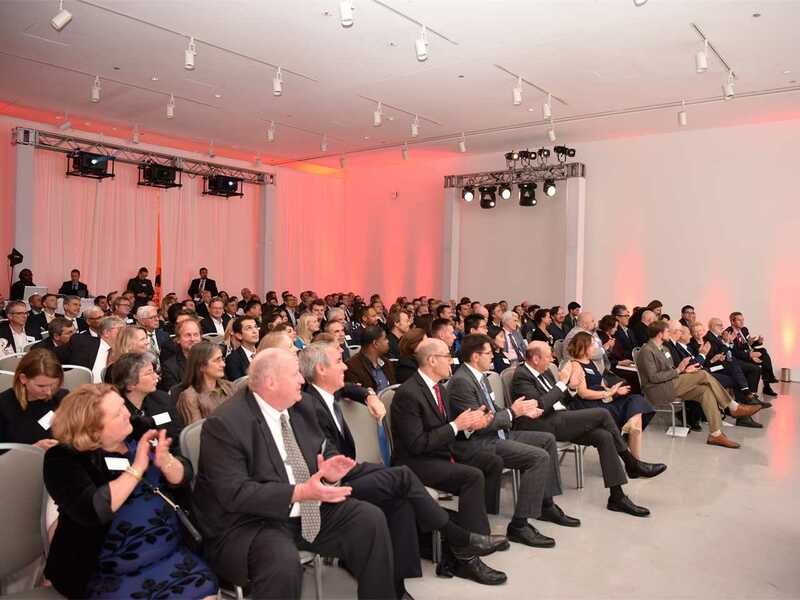 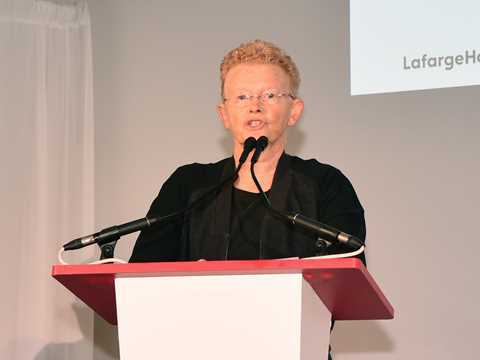 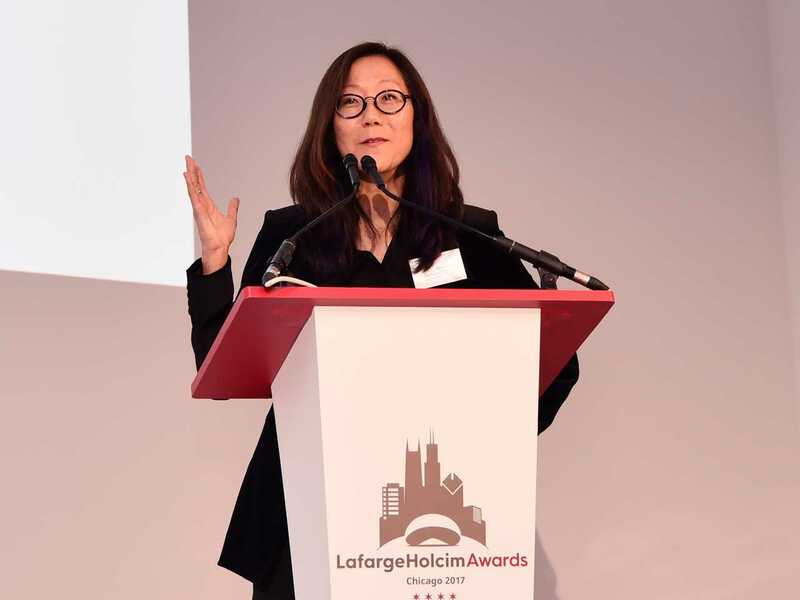 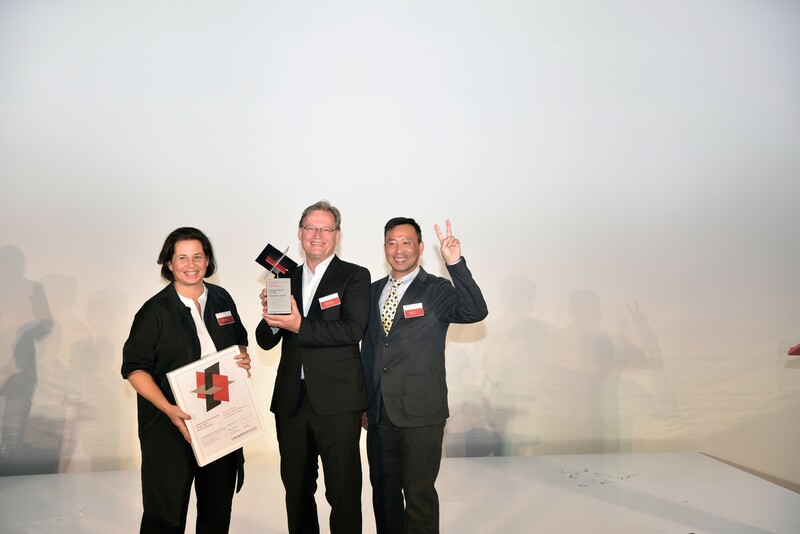 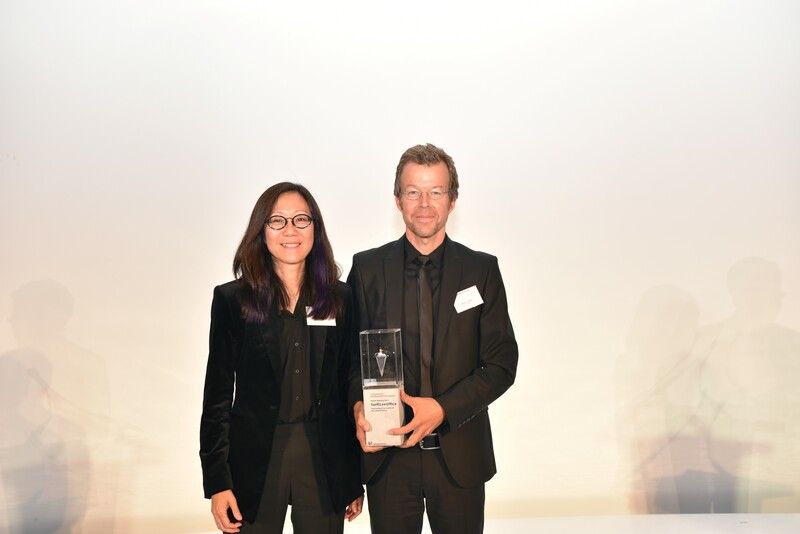 “We have always believed in the residents of Detroit 48204 and our design direction, but the LafargeHolcim Awards make a tremendous difference and give us new confidence and hope”, she said. 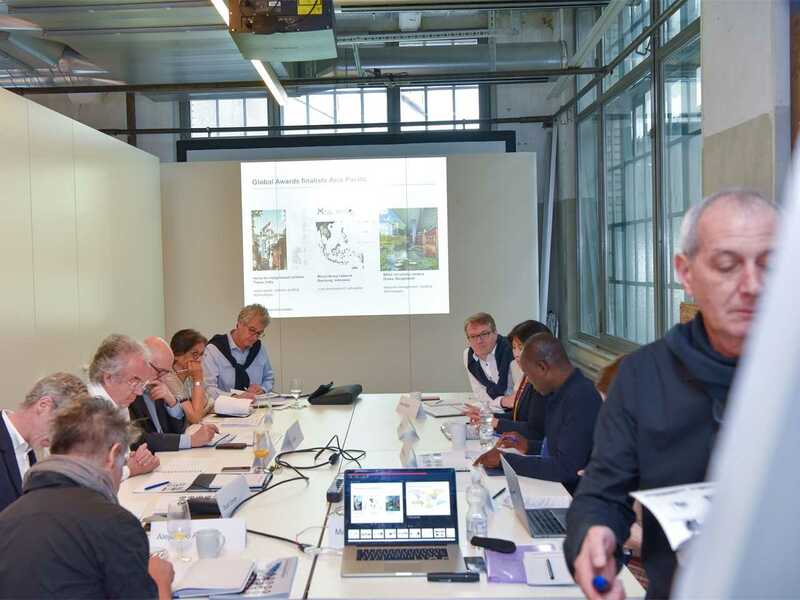 Under the name of The Seebaldt Pilot (TSP), a large group of collaborators proposes a pilot project for local energy and food production, water and waste management, and community empowerment. 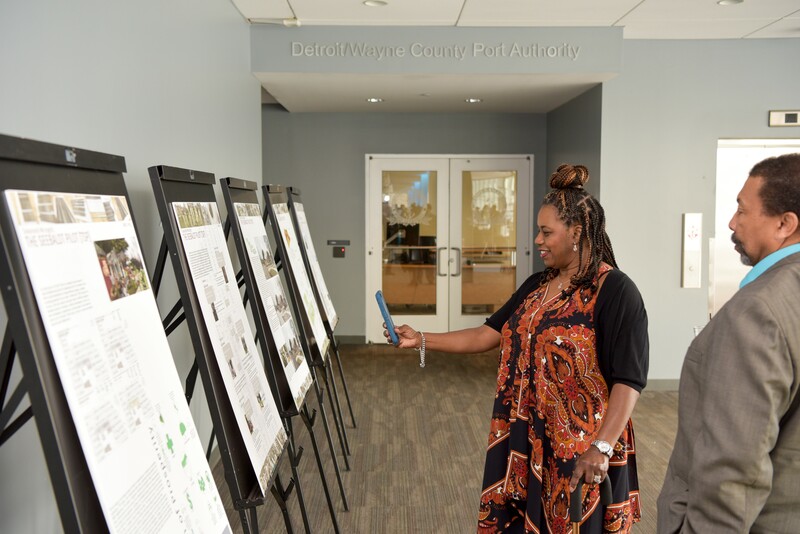 “Taking the pocket vacancies normally characterized as the biggest problem in Detroit, the design turns them into an opportunity to create a compelling sustainable neighborhood,” praised the jury. 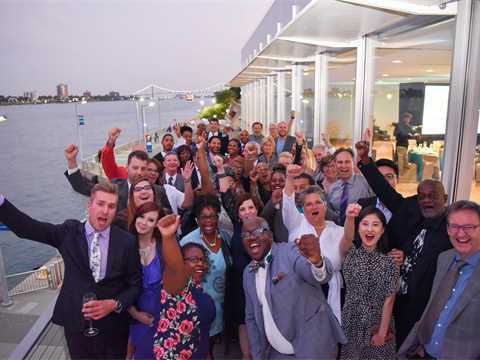 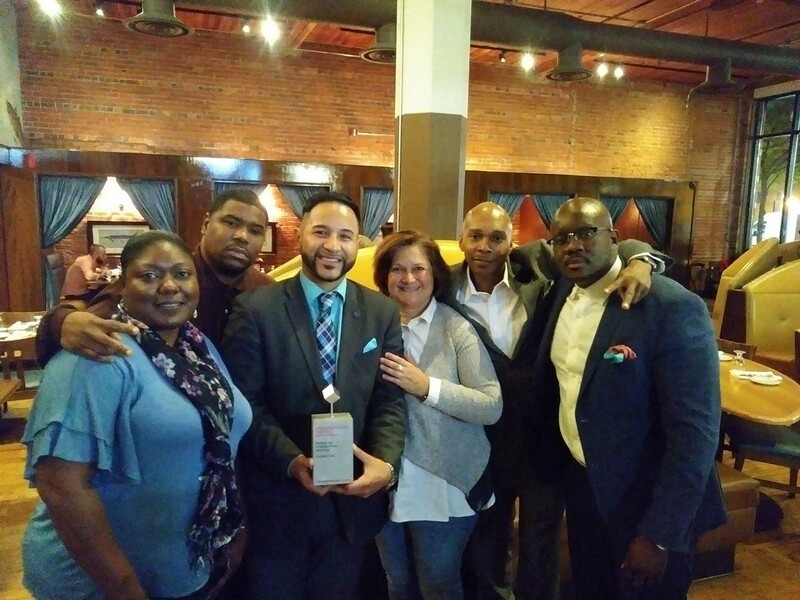 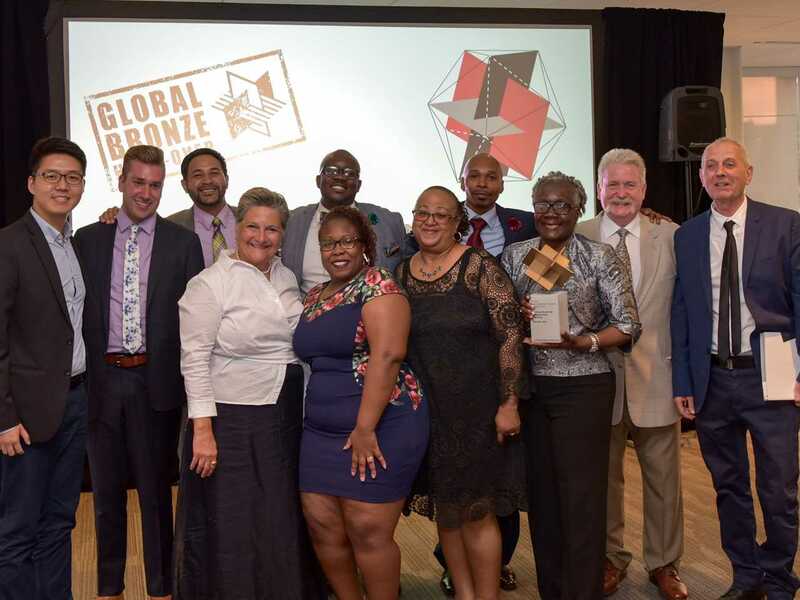 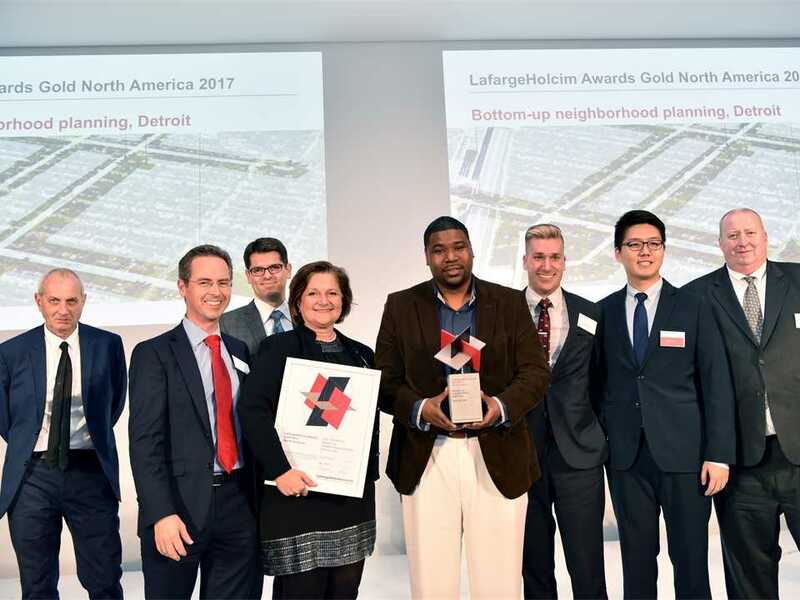 The winning team of the LafargeHolcim Awards Gold for North America celebrate in Chicago - their project for community-driven neighborhood planning in Detroit won the top prize for the region in the world’s most significant competition for sustainable design. 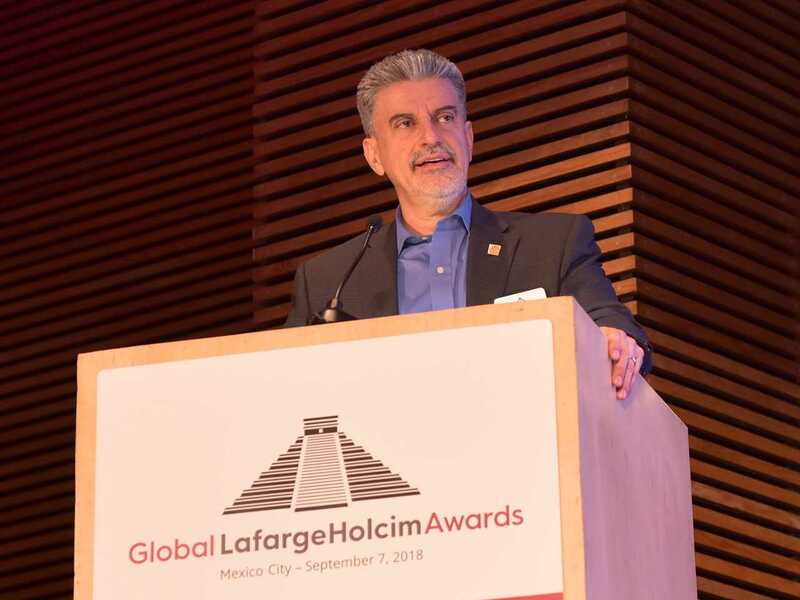 All prize winners of the LafargeHolcim Awards 2017 for North America. 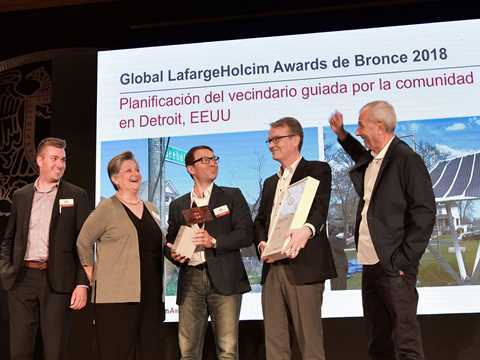 Winners of the LafargeHolcim Awards Gold, Silver and Bronze for North America celebrate at a prize handover event in Chicago. 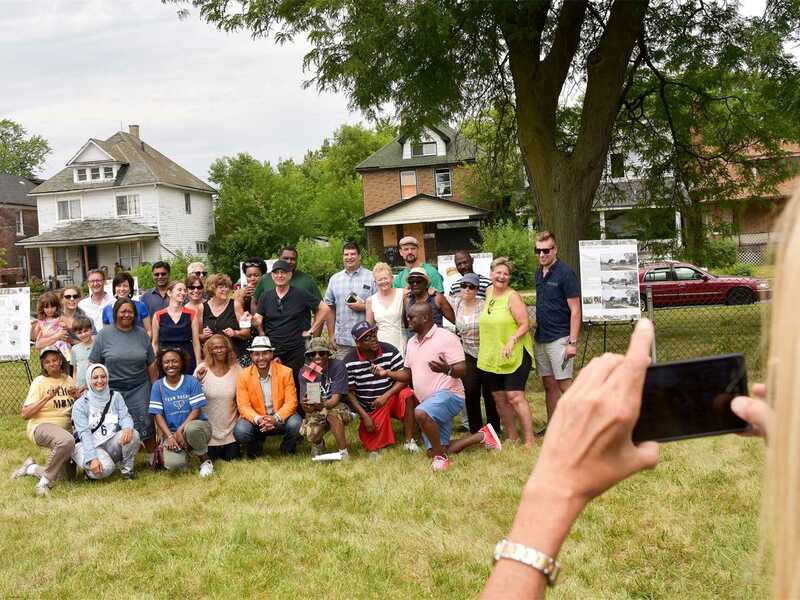 With its large team, studio[Ci] in Detroitis tackling one of the city’s greatest challenges: In a neglected district of the city, they want to create a community based on collective empowerment that functions as sustainably as possible. The community owned and managed infrastructure will include local energy and food production, water and waste management, while also strengthening civic empowerment. “Taking the pocket vacancies normally characterized as the biggest problem in Detroit, the design turns them into an opportunity to create a compelling sustainable neighborhood,” praised the jury. The design proposal for a neighborhood in Detroit repositions infrastructure as a civic project, under the name of The Seebaldt Pilot (TSP). 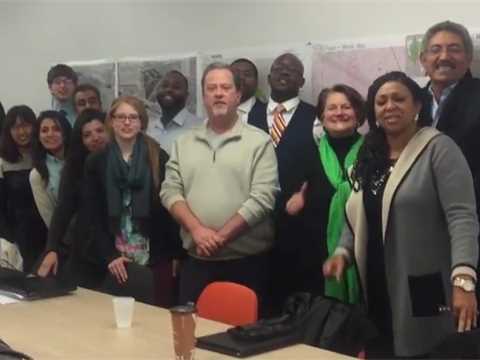 Building on longterm community engagement, the large group of collaborators proposes a pilot project for local energy and food production, water and waste management, and community empowerment. 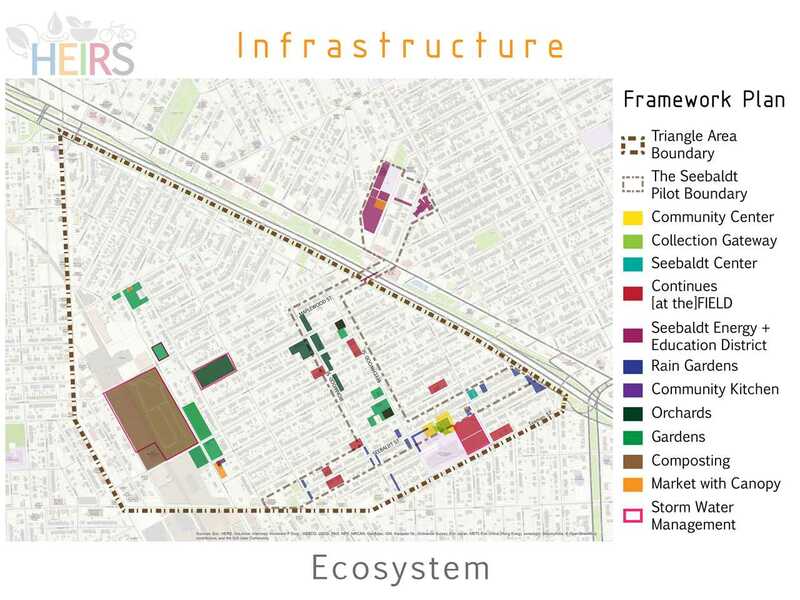 Solar photovoltaic canopies, rainwater collection, geothermal wells, and community gardens are stitched through the existing neighborhood on currently empty lots. 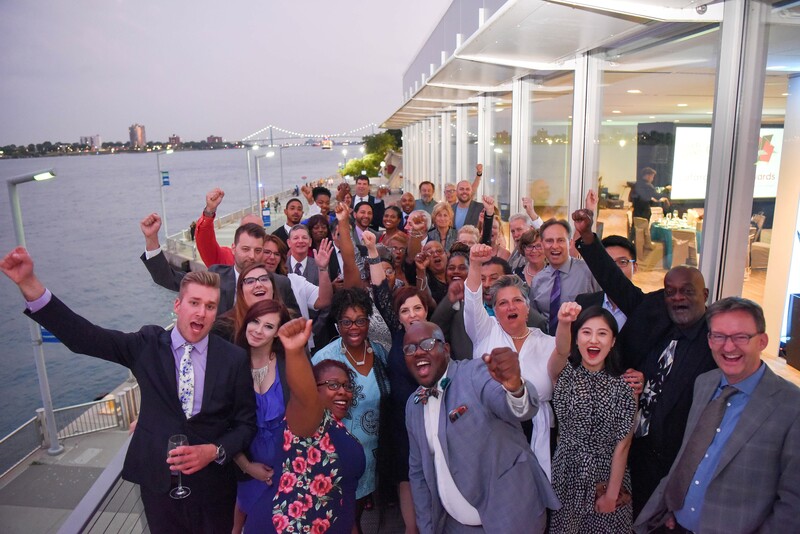 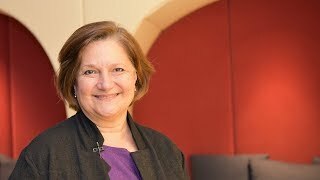 The collectively owned and managed infrastructure is both a gathering point and a new revenue stream for additional community services and an enhanced public realm. The jury commended the proposal’s fundamentally optimistic approach. 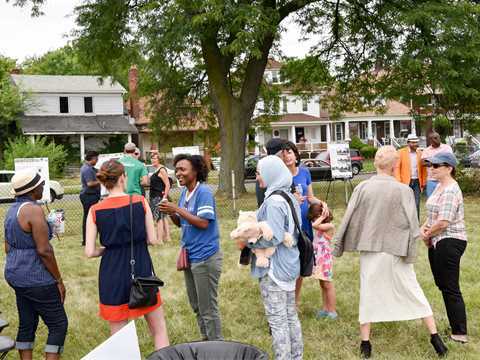 Taking the pocket vacancies normally characterized as the biggest problem in Detroit, the design turns them into an opportunity to create a compelling sustainable neighborhood. 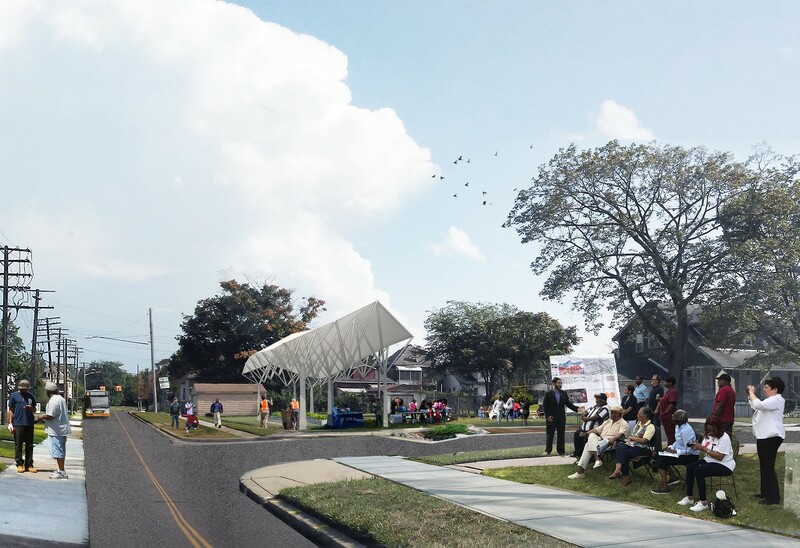 The combination of solar and geothermal energy, rainwater collection, and community gardening is particularly powerful in a city that struggles to provide basic services at the municipal level. 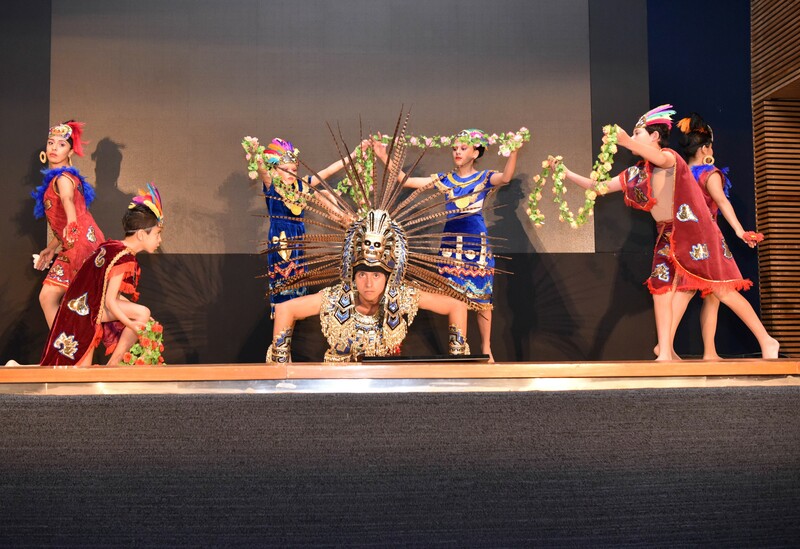 Physical investiture is complemented with education through training programs and investment through collective ownership and revenue sharing. Here, the infrastructure of energy and food production reinforces the infrastructure of community building. 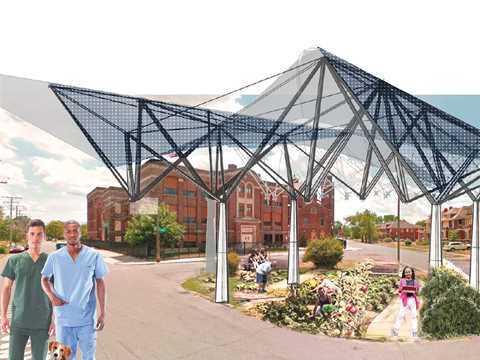 The strengths of the project in organization and planning are not yet matched by its architectural expression and the jury noted that the multifunctional umbrella roof being proposed will need to be refined as it moves into more detailed design phases. 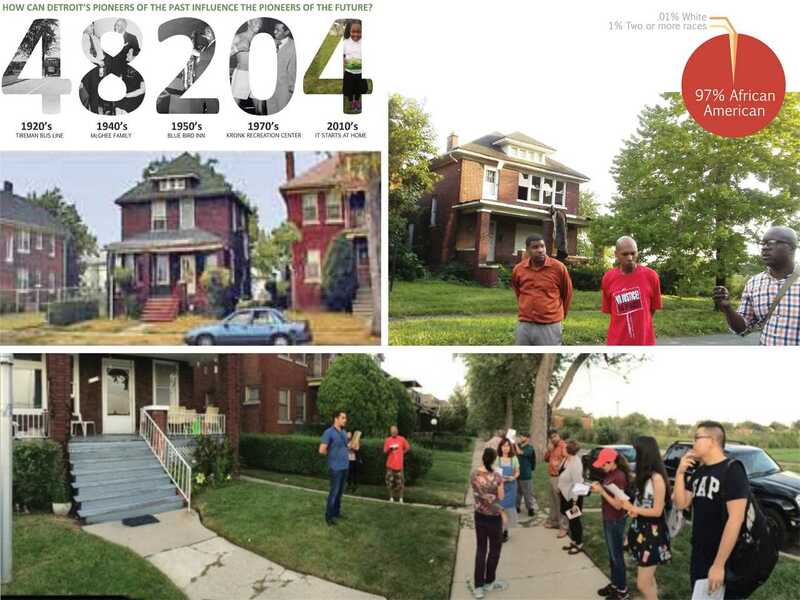 Detroit’s 48204 zip code is home to 27,000 low- and moderate-income residents with promising demographics: high percentage of home ownership, college degree attainment, and employment in Health/ Education. 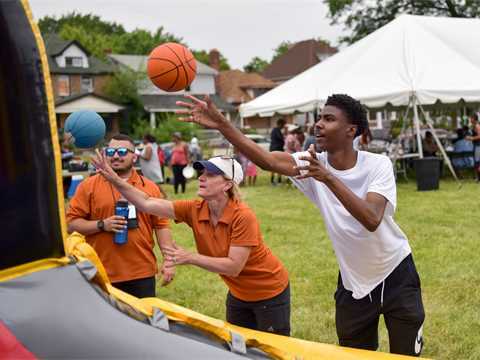 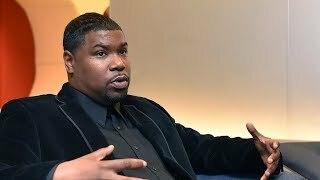 The Team’s pro bono commitments have been vital, but Detroit is emerging from economic decline, and 48204 is hard hit by lack of resources and opportunities, especially for youth. 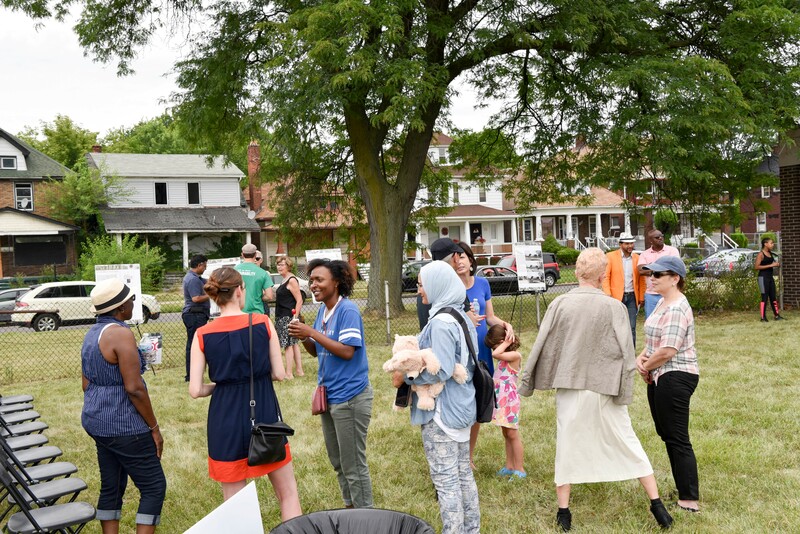 Our Mayor focuses on neighborhood development, so TSP can be a replicable model for stabilization and sustainable growth. Hybridized Ecosystem for Infrastructure and Renewable Systems (HEIRS) generative infrastructure and renewable systems decarbonizes and makes 48204 self-sufficient. 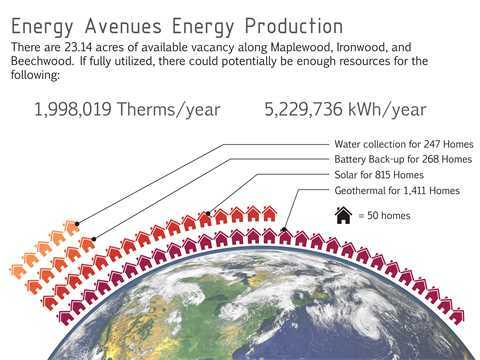 Michigan’s colder climate is ideal for solar power generation. Specified PV increases the power output 41 % for every degree Celsius drop in temperature. Bloomberg/Deutsche Bank rank Michigan 14th best for return on solar dollar. 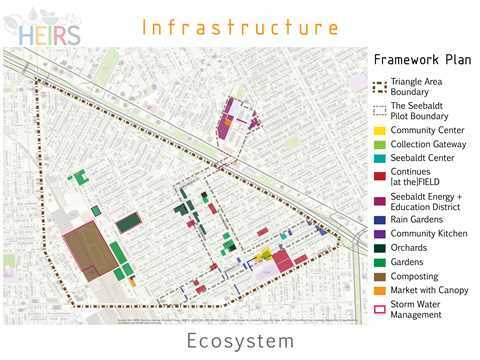 IS@H wishes to secure, make stable, and sustainably grow their beloved 48204 neighborhood. 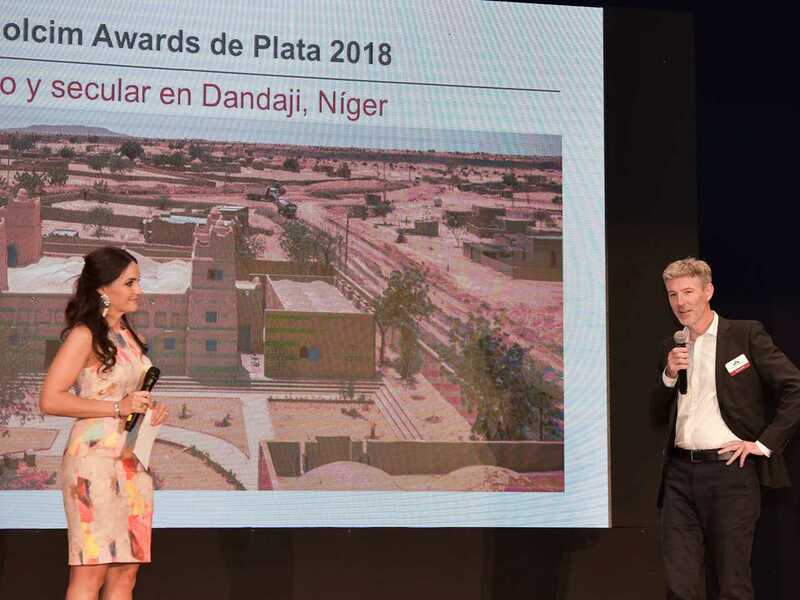 Since 2014, IS@H and studioCi have collaborated to create a sustainable vision based on achieving NZE through a community MicroGrid with solar and geothermal energy, rainwater collection, and primary education and training opportunities. The HNZE MicroGrid is a “three legged stool” of solar, geothermal, and storage that will distribute energy from PV to strengthen and stabilize the grid. 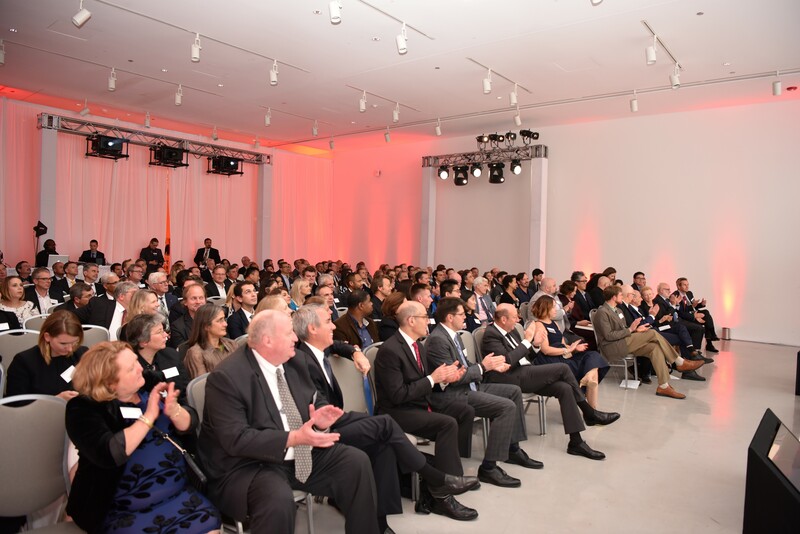 IS@H has established emerging partnerships with local university, banking, and utility sectors in support of their vision and program. 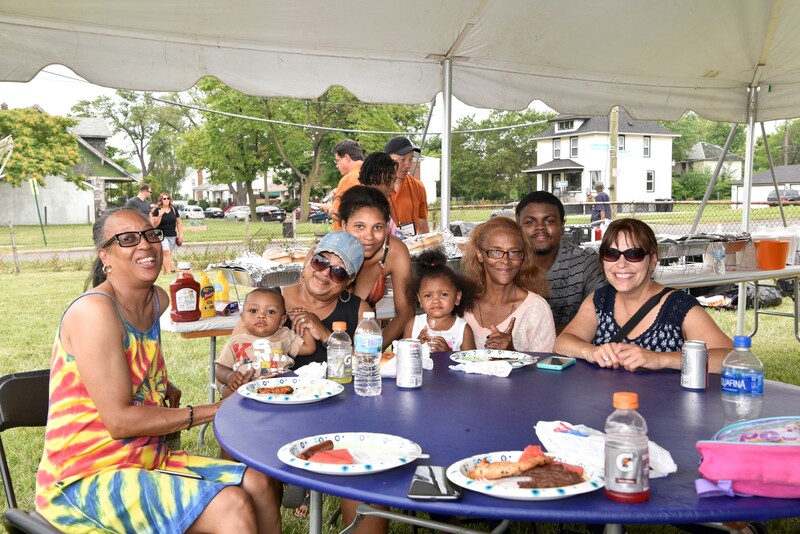 Weatherization and efficiency programs will directly engage the community and link the enhanced public realm of the micro grid to the private realm of homeowners and constituents. TSP creates a new transactional public realm, generating ownership benefits for the 48204 neighborhood. 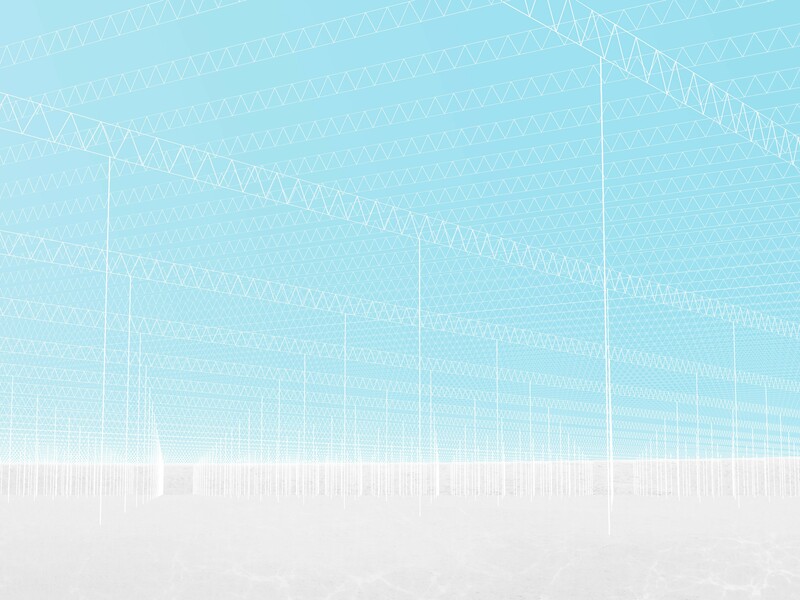 TSP envisions distributive ownership and operations models, placing resources such as vacancy into a renewable cycle of collective use. 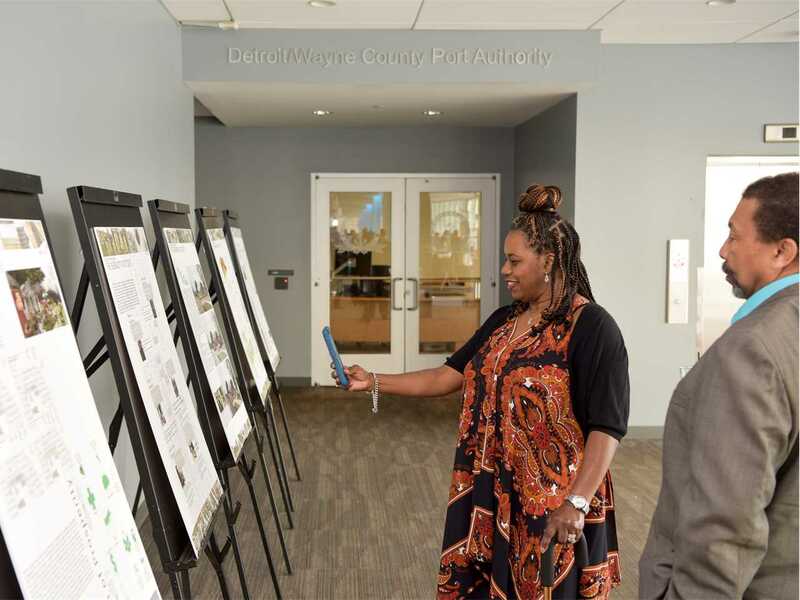 Revenue sharing with DTE will fund an escrow account, which will allow the coop to add more infrastructure and beneficiaries. 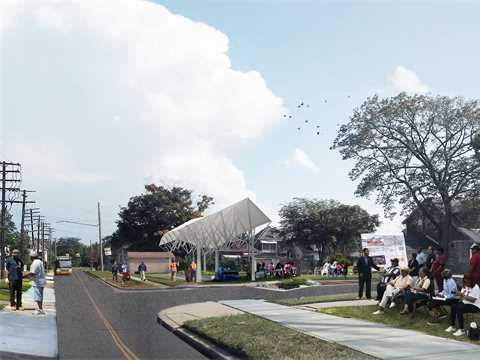 The community owned MicroGrid will be installed with the help of residents trained through local NGOs. Initially, several hundred under-served youth will be trained in the renewable energy economy. The long-term vision is a fully functional, cooperatively owned MicroGrid that will deliver both reduced energy and water costs and a revenue stream for community services, initiatives, and investments within an enhanced public realm.